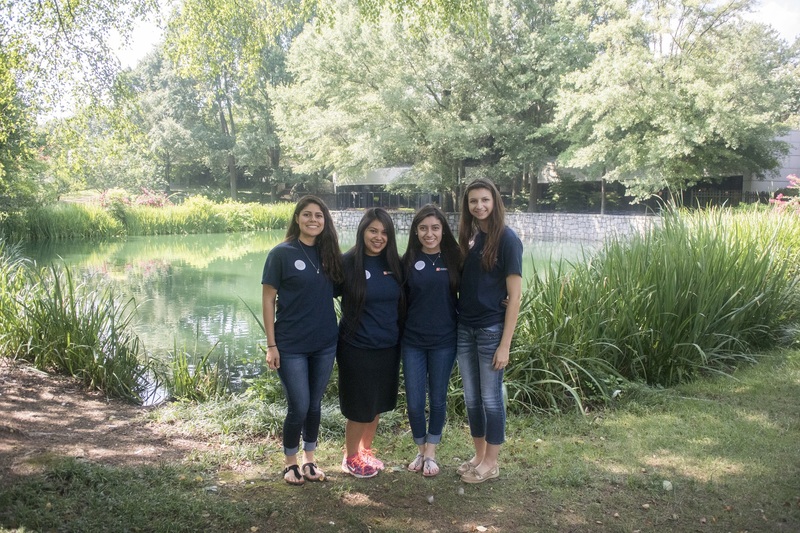 It was a fun second week for participants in the LEAP Center’s heART of Huntsville program. 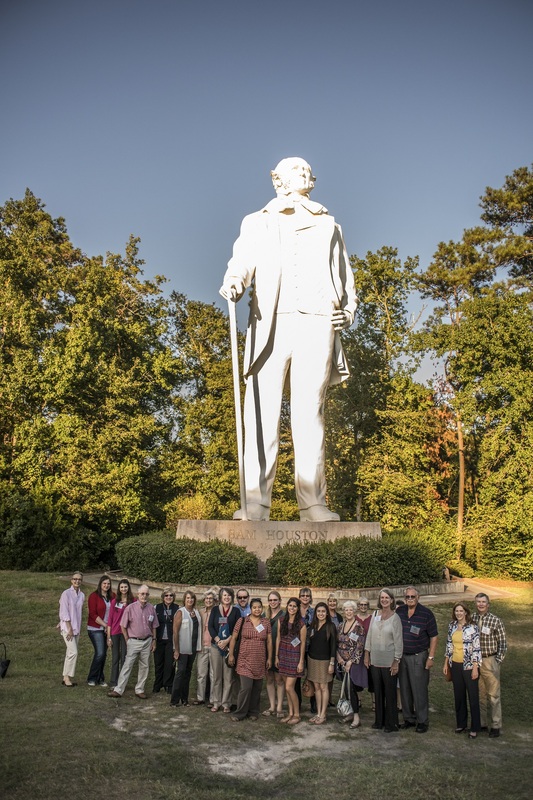 The week involved a behind-the-scenes tour of David Adickes’ “Big Sam” at the Huntsville Visitor Center, a bus tour of the city’s outdoor sculptures, dinner at the new Eclectic Studio, and a wonderful tour of the Adickes’ Foundation. 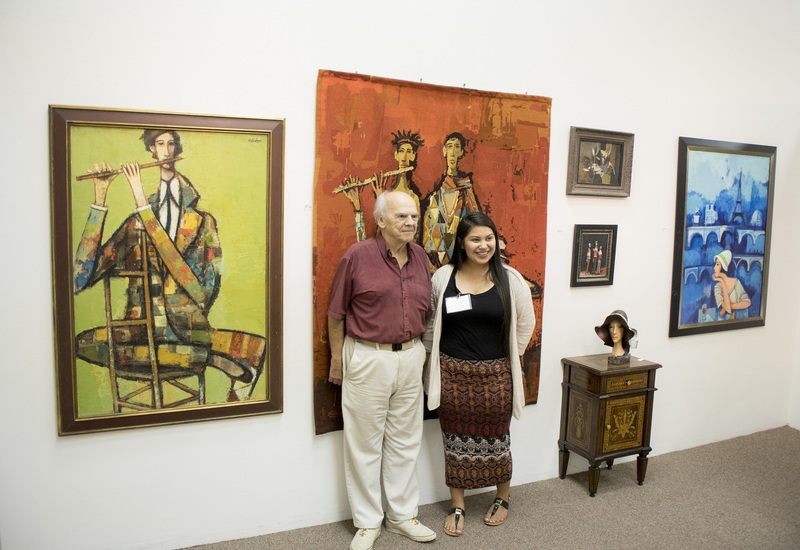 …which was produced by SHSU students in the animation program of the University’s art department. 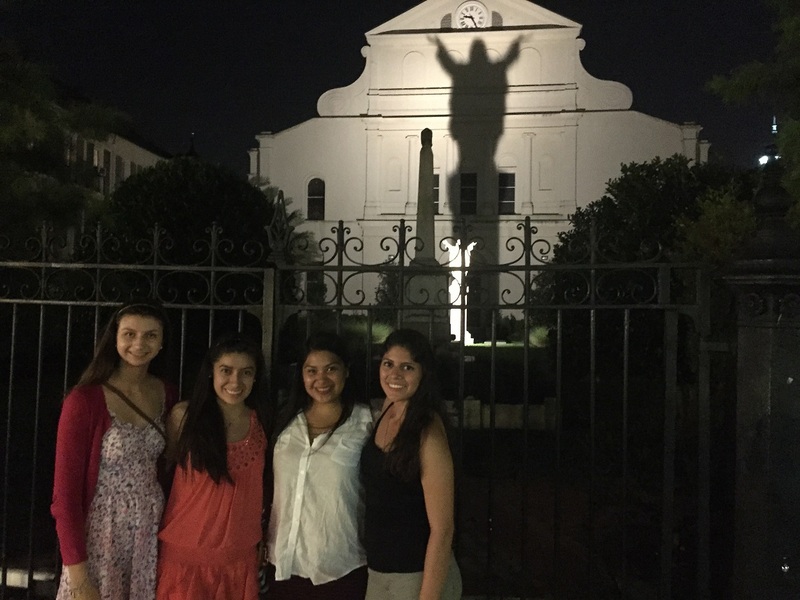 Following the video, we visited the statue, gathered for a group picture…. …and learned cool facts. Did you know, for example, that there is a door to the interior of the statue, allowing people to climb to the top of Big Sam? 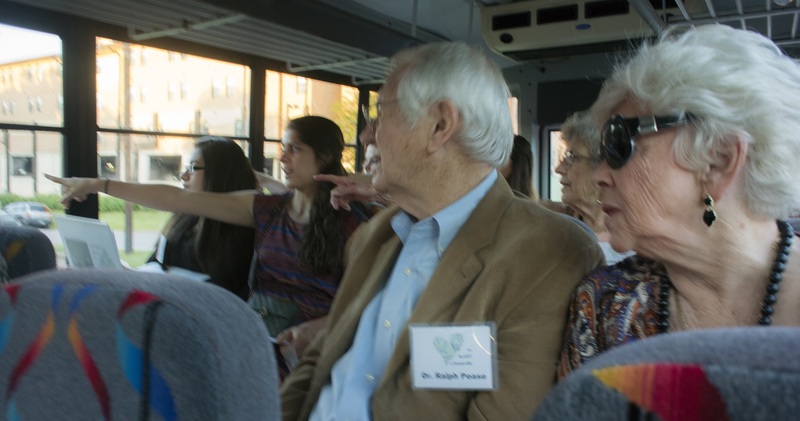 We also had an hour-long bus tour of Huntsville’s outdoor sculptures. 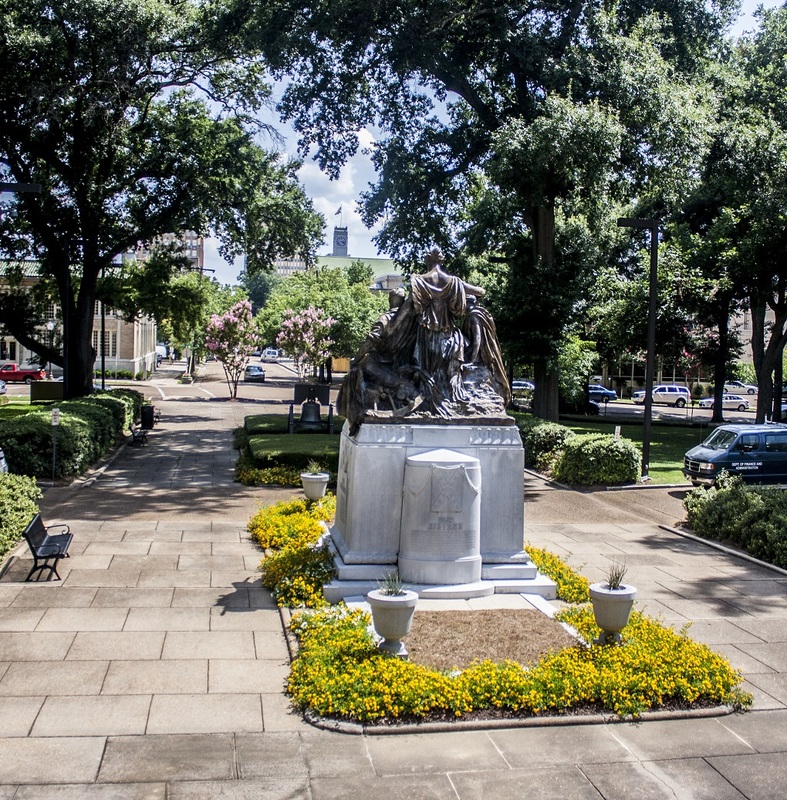 We would bet that most Huntsville residents don’t know the city has more than 30 such sculptures, including work by world-renowned artists such as Charles Pebworth (“Totem Number One” behind City Hall), Jesus Moroles (two outdoor sculptures on SHSU’s campus and four on the Wynne Home grounds), and Pompeo Coppini (Sam Houston’s grave monument)? While those sculptors may be some of the more famous, there’s also the abstract Christ statue by Brother Melvin Meyer, who completed more than 10,000 sculptures (mostly from recycled materials) before passing away in 2013? 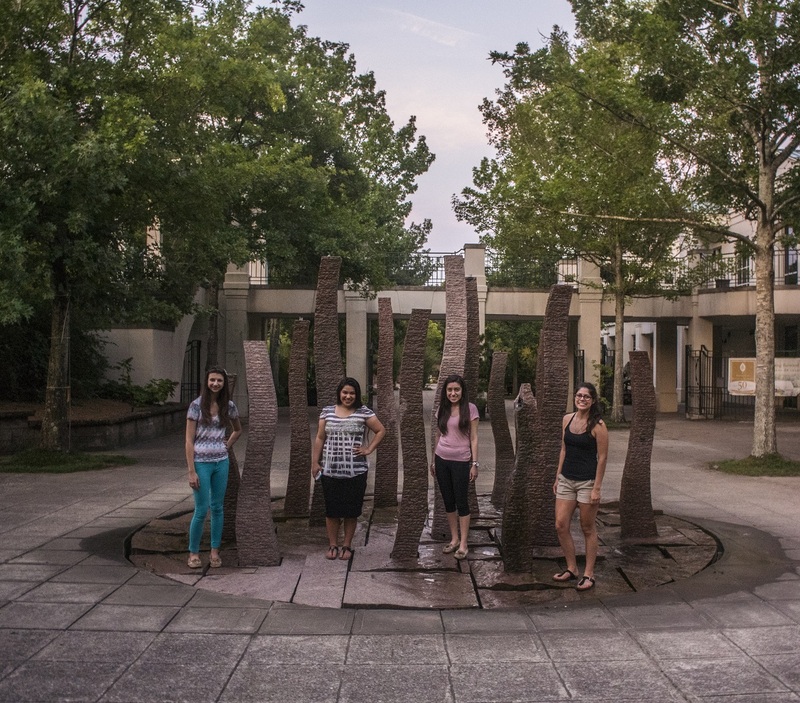 Or that one of Stuart Kraft’s two Huntsville sculptures was lost by Huntsville Independent School District? Or that John Stewart’s “Reclining Figure” was inspired by the work of Henry Moore, perhaps the greatest 20th Century sculptor? 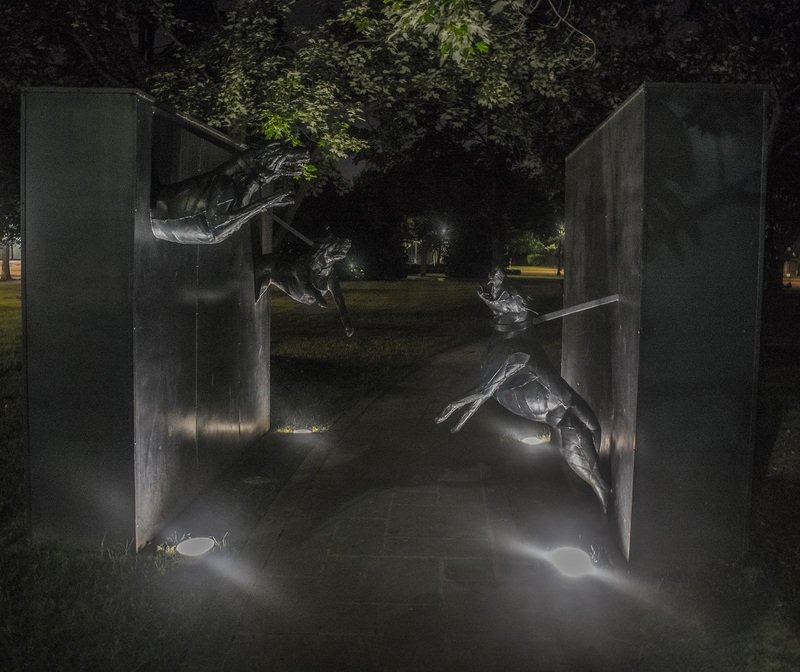 Or that the seven trees surrounding the “reclining figure” represent the seven astronauts lost in the 1986 Challenger explosion? 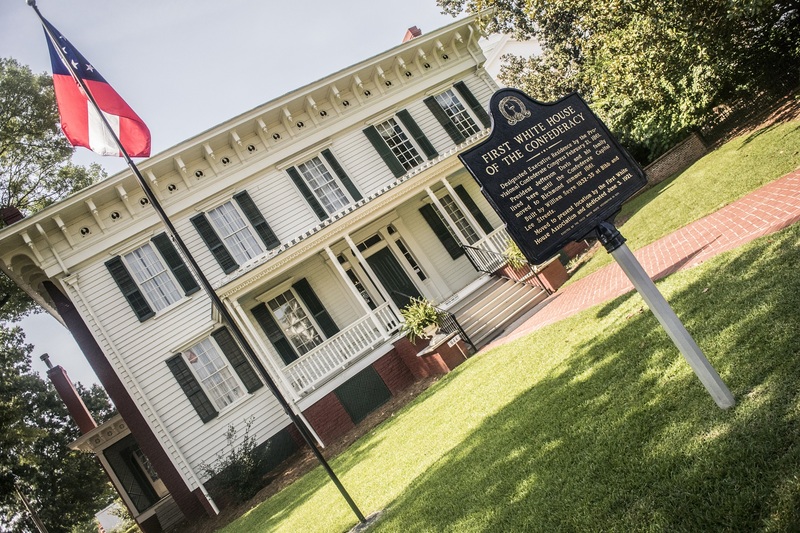 And how many people know that architect Harry Payne completed more seven or eight structures in Huntsville (e.g., Smither-Martin law firm, Sam Houston Memorial Museum) that are still standing? 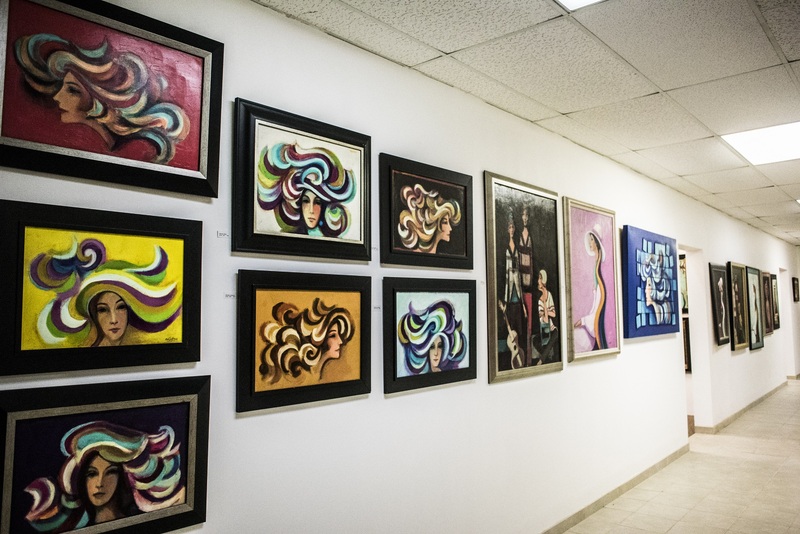 The arts are just one of the fun things to explore in Huntsville! 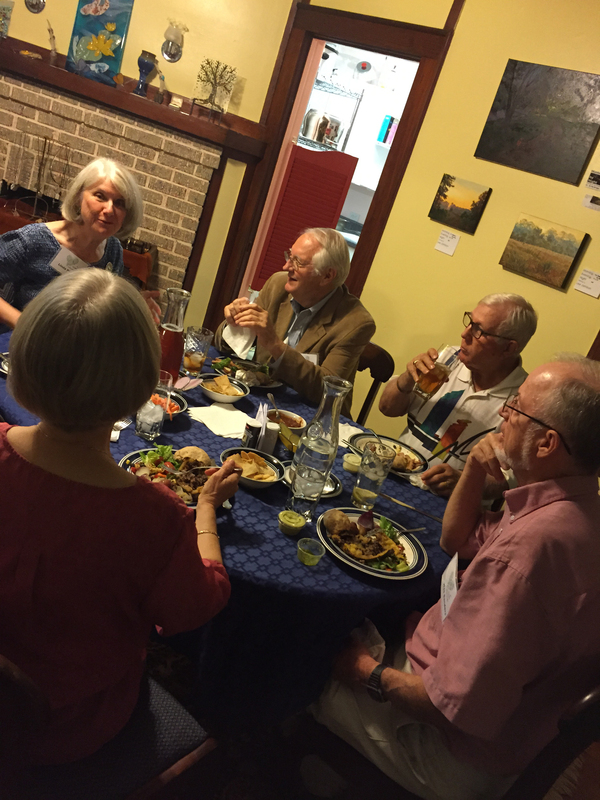 For most of us, our dinner was the first time to visit Eclectic Studio, but the food and the art will be bringing us back for more! Although normally specializing in vegan and vegetarian fare, the chef (Jennie Dickenson) catered to our meat-eating group with scrumptious ribs, potatoes, pasta salad, and wonderful hummus and chips. 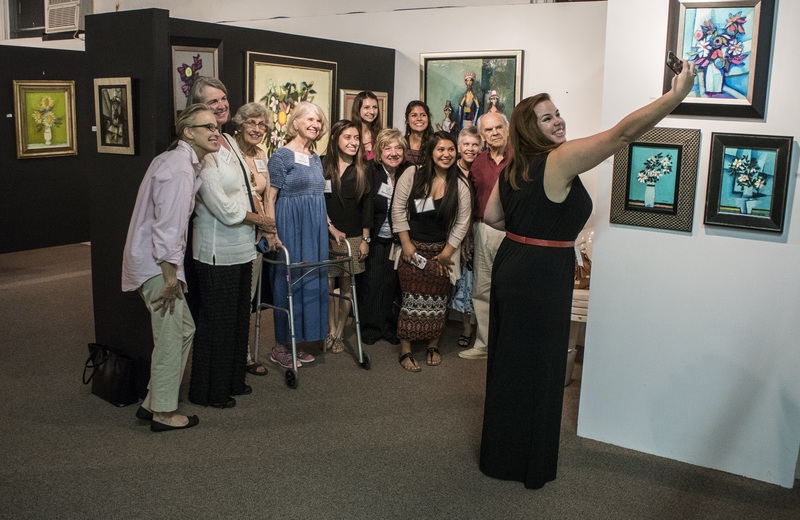 One of our participants, Betsy Maloney, even had some of her art work on the walls, along with art by Lee Jamison and Jennie Dickenson. We’d like to thank the POLS department at SHSU for sponsoring this week’s activities and dinner! 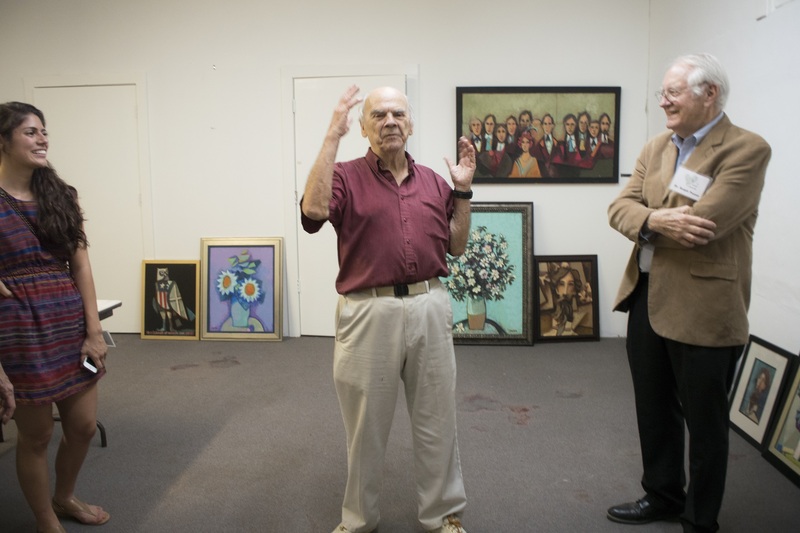 The highlight of the evening was the tour of the Adickes’ Foundation, the old Huntsville High School on Avenue H. Containing more than 300 pieces of art by Adickes, it is a wonderful place to spend an evening…. 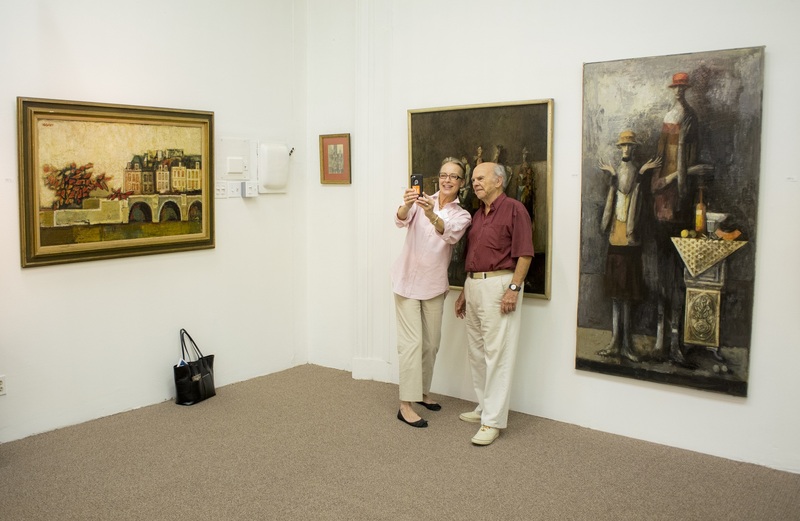 …although, at times, there were so much art to see, we didn’t know which direction to turn! …we all had fun. 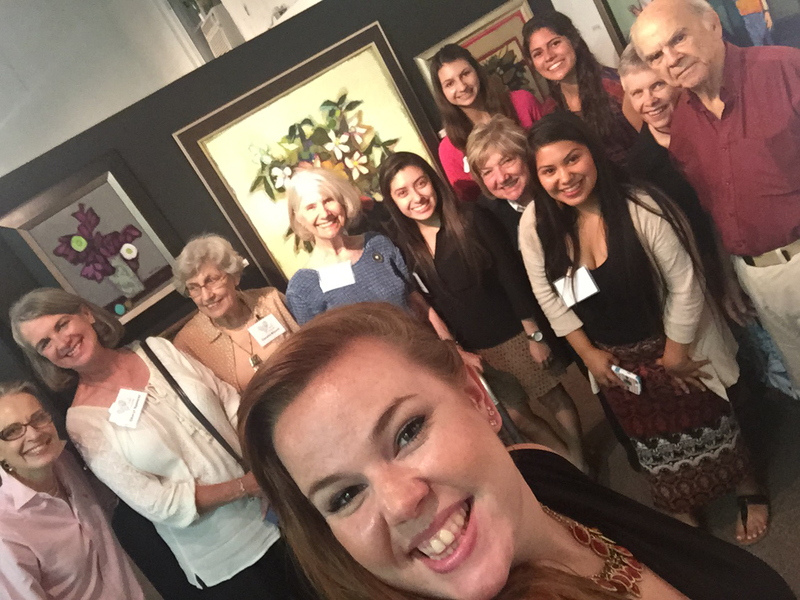 Even Ms. Woodward got into the selfie spirit! …the stories were as interesting as the art. And for students who are political science majors, it was a treat to hear about the night he spent in the White House, when he had the privilege of going to the Kennedy Center with George H.W. and Barbara Bush, followed by a night in the Lincoln Bedroom. It was a fun, educational evening! After a great night of rest, we made our way to the impressive Biloxi Visitors Center. At the visitors center we were able to sign up for a tour Biloxi’s Lighthouse. The Biloxi Lighthouse was built in 1848 with a cast iron exterior and brick interior. 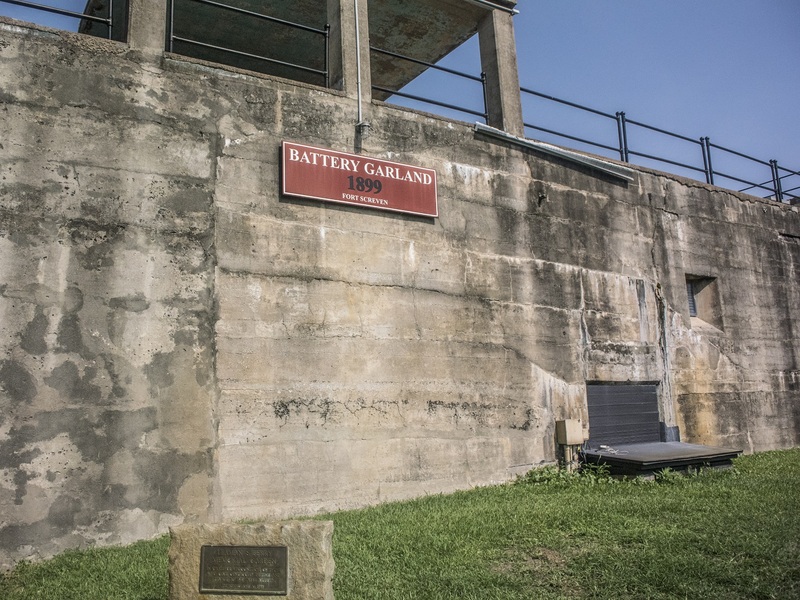 It is 65 feet tall and has been electrically operated since 1926. 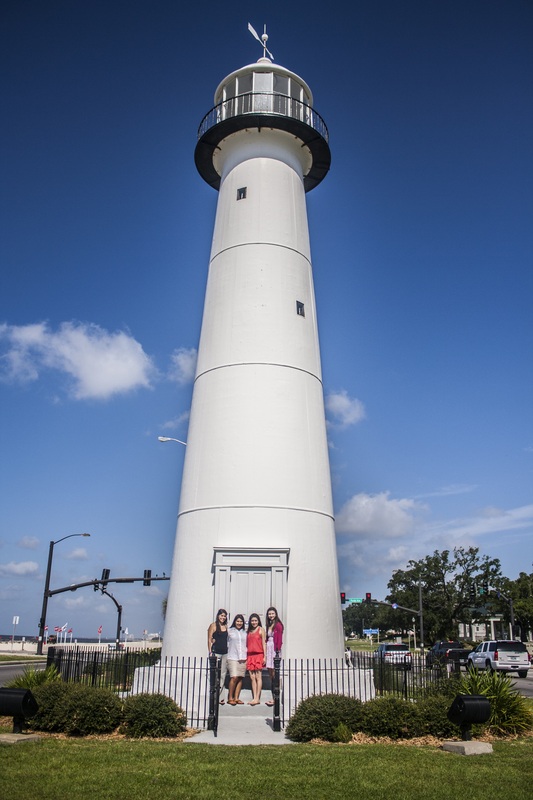 An interesting fact about the Biloxi Lighthouse is that it was civilian operated and many of its operators were women, including one stretch of 50+ years where only women operated it. As we walked to the lighthouse we noticed another one of its unique features: it is the only lighthouse between a highway thoroughfares. To enter the lighthouse we had to make our way up a wobbly, metal stair case until we reached the top. Once we all reached the lantern room, our tour guide gave us a brief overview of the lighthouse’s history. As we stood in at the top of the lighthouse we began to feel the intense heat caused by the cast iron exterior of the lighthouse. 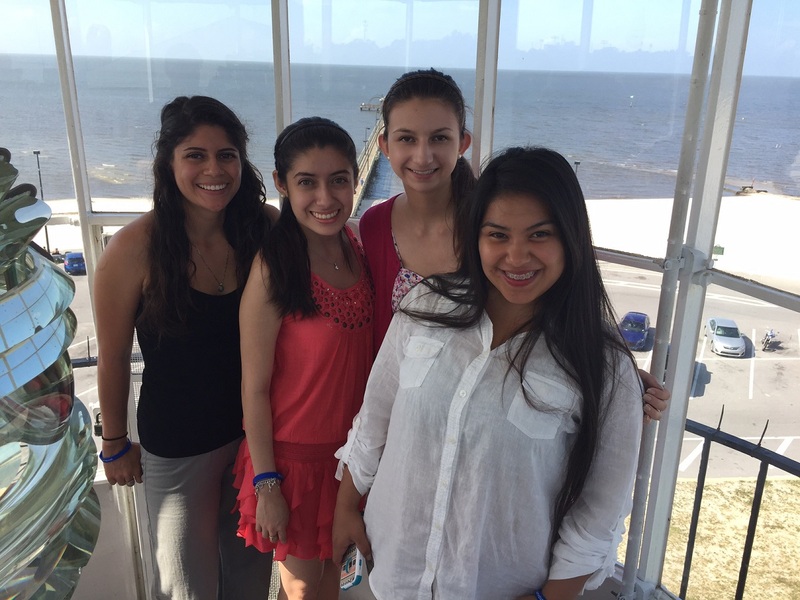 We couldn’t imagine what it was like to be the lighthouse keeper in the southern heat! 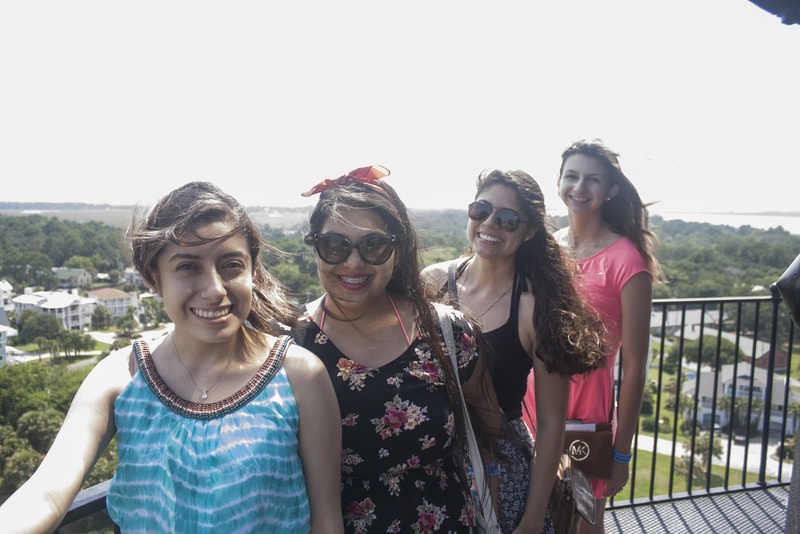 When all of us had enough of the heat we began our journey down the stairs. It was way easier to go down than up, but still frightening for some. 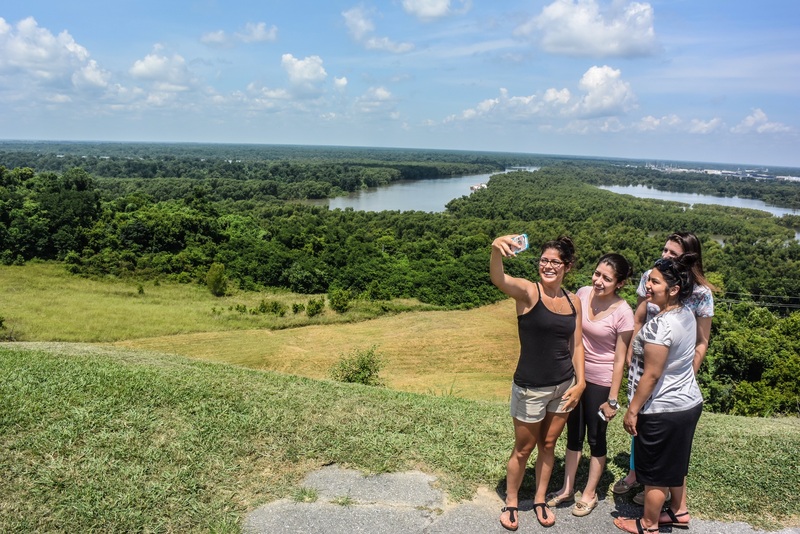 Once we were back inside the visitors center we were able to learn more about the lighthouse and the challenges they have faced on the coast of MS. For example, the lighthouse has endured many storms, most notably Hurricane Katrina. Hurricane Katrina caused much damage to the lighthouse. 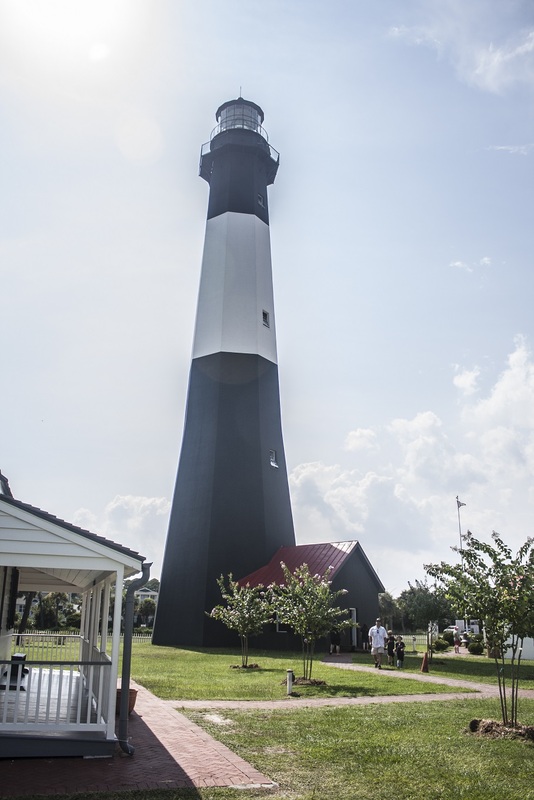 It filled the lighthouse with 21.5 feet of water and four hundred thousand dollars in reconstruction costs. 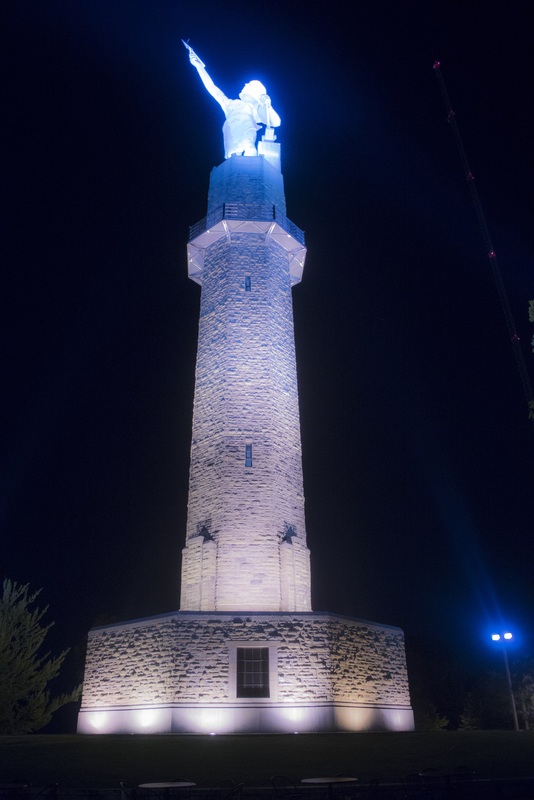 The lighthouse was torn and battered by the destructive storm, but it still stood tall and was seen as a symbol of hope and resilience during the disaster, and the light in the lantern room still lights up the waters every night. Following our exhilarating climb at the Biloxi Lighthouse, we drove along the shore to the George Ohr-O’Keefe Museum of Art. 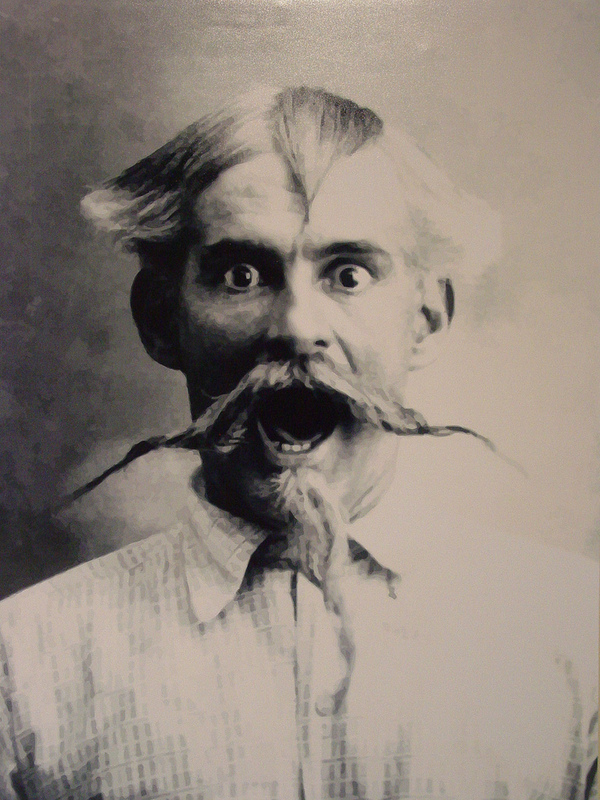 George Ohr is the self-proclaimed “Mad Potter” whose art was relatively unknown until fifty years after his death. 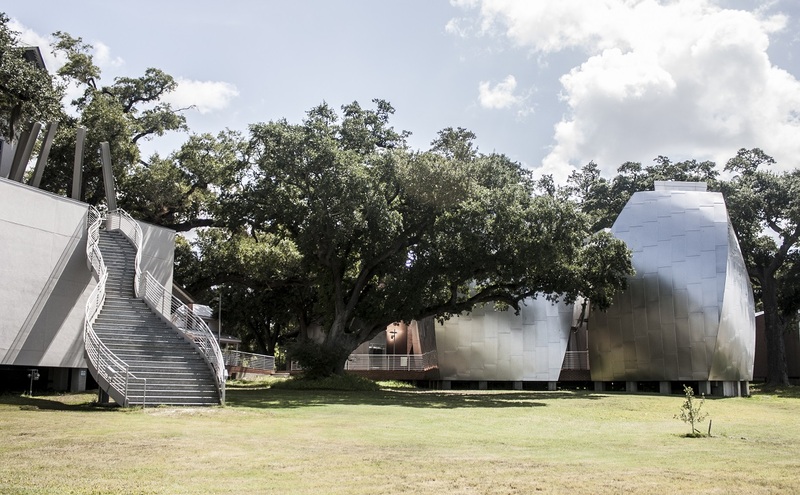 Designed by architect Frank Gehry, the museum building and grounds provide a stunning man-made counterpoint to the beautiful beaches, which are located directly across the highway. 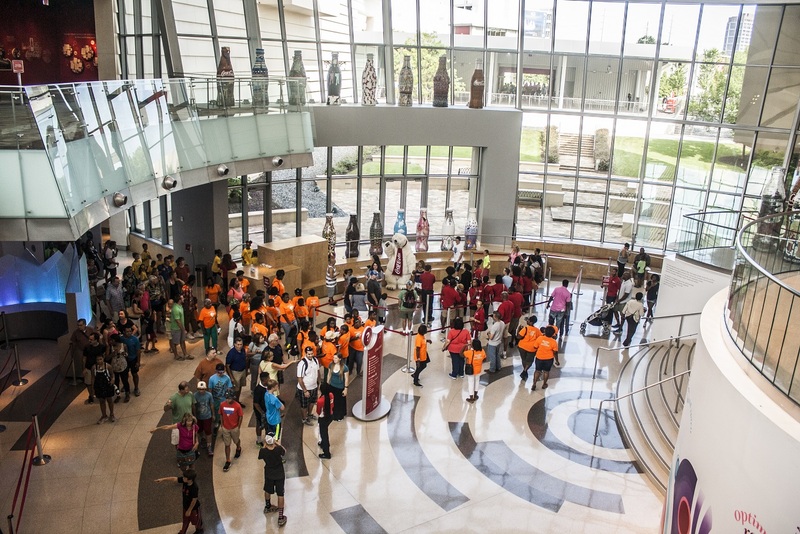 Since it is the tenth anniversary of Hurricane Katrina, much of the current museum exhibits are dedicated to commemorating the hurricane. Biloxi, right on the Mississippi coast, was hit hard when Katrina rolled in. 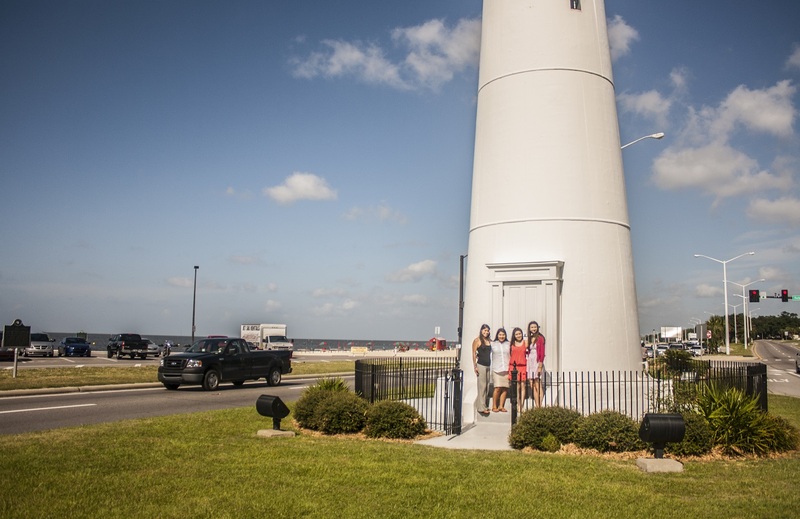 The damage to the lighthouse helps visitors visualize the magnitude of the storm in Biloxi. 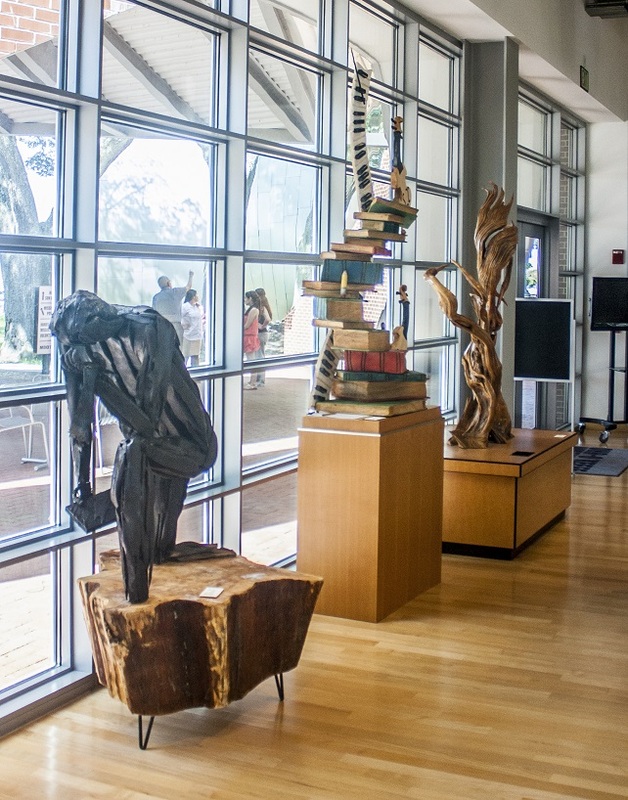 In the lobby of the museum, there are many statues constructed out of wood. 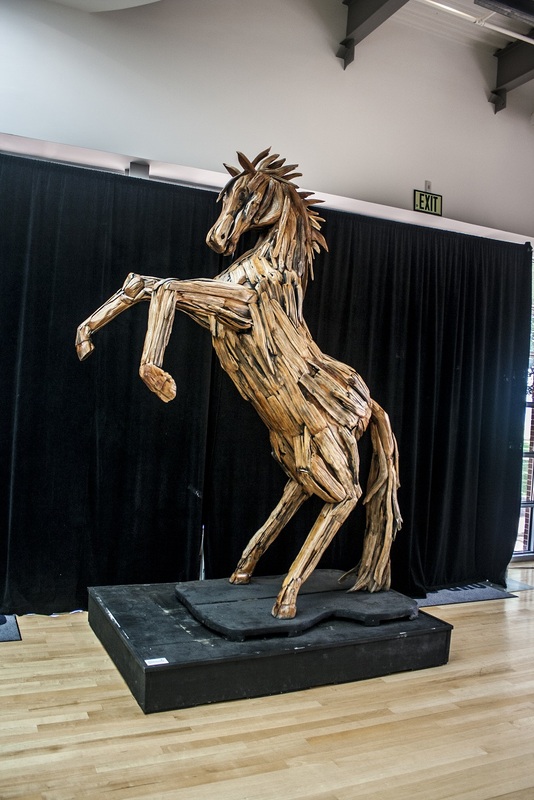 Marlin Miller, a popular artist who took the dead and destroyed trees left after Hurricane Katrina and carved them into masterpieces that now decorate the once desolate landscaping of Biloxi. 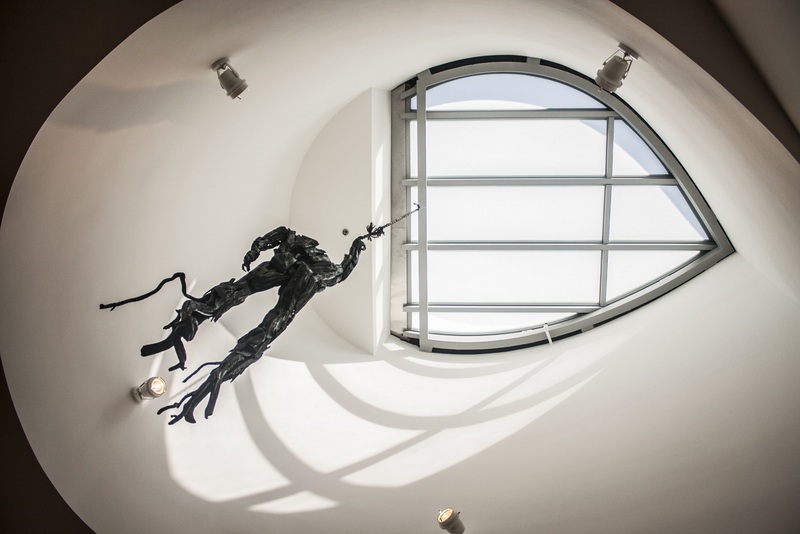 The museum contained a few of his sculptures each representing various emotions surrounding Hurricane Katrina. The sculptures were beautiful and representative of the way Biloxi rebuilt itself after the storm. The exhibits reminded visitors of how severe Katrina was and the change that has occurred since then. The Mississippi Power Company and the local news each had exhibits in the museum explaining the aftermath and their job when cleaning up. 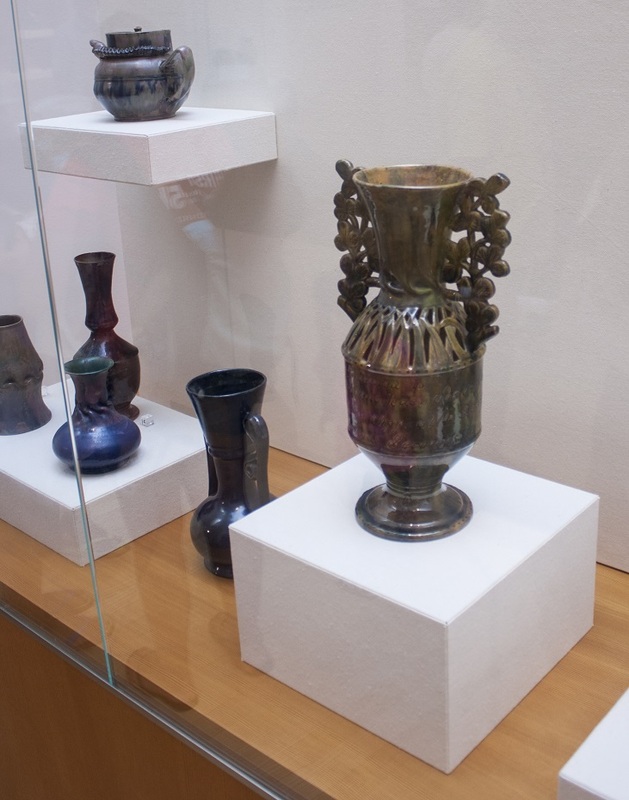 After the Katrina exhibits, we visited the main exhibit showcasing George Ohr’s pottery. George Ohr was born in 1857 and in 1879 he began his pottery career in New Orleans, LA. Ohr’s philosophy was that no two pieces of pottery should be alike because no two people were alike. To create thousands of pieces and not craft two pieces alike illustrates his creativity and support for individualism. Unfortunately, George Ohr’s pottery studio was burned in a fire in 1894. 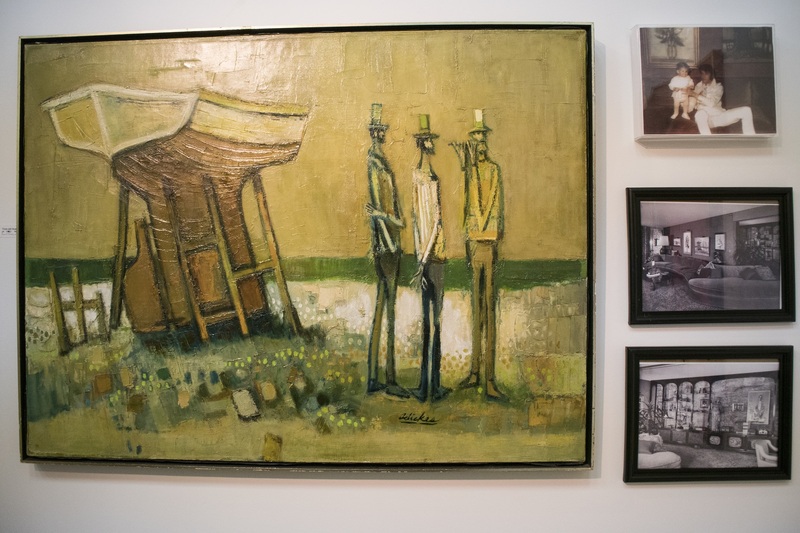 However, when he opened his new studio, it marked a significant change in his pottery with many brighter and bolder colors than his previous works of art. 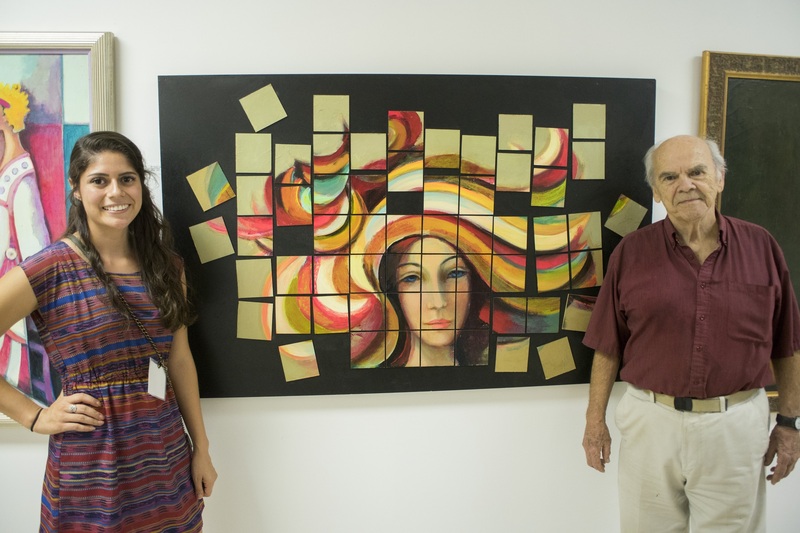 It was amazing to see the shift in his artwork and the transformation throughout his life. Although not entirely what we expected, we immensely enjoyed learning about Hurricane Katrina’s impact on Biloxi and about the famous “Mad Potter”. The museum marked our last stop in Biloxi and we departed for New Orleans, the penultimate destination of our Tour of the Deep South. Upon arriving in New Orleans we stopped for lunch at a New Orleans style restaurant, Elizabeth’s. The restaurant was founded in 1996 and their mission has, since then, been to make everything from scratch to provide a great product with the care and creativity that it deserves. We began with boudin balls and praline bacon as appetizers. Kaitlyn went with the special for the day which was Elizabeth’s original, Joe’s scramble. Alex and Karla went with the hot sausage Po’ Boy which was plenty of food for both of them. It was also something they had never had before. It was a sandwich with a sausage with a soft spice kick to it. The restaurant was also very unique with plenty of colorful art on the walls that is from a local artist named, Dr. Bob. The art featured many NOLA sayings and recycled bottle caps as borders. His shop was located directly down the street from the restaurant. After days of intense sightseeing and learning, we decided that retail therapy would be a nice way to spend an afternoon in New Orleans. 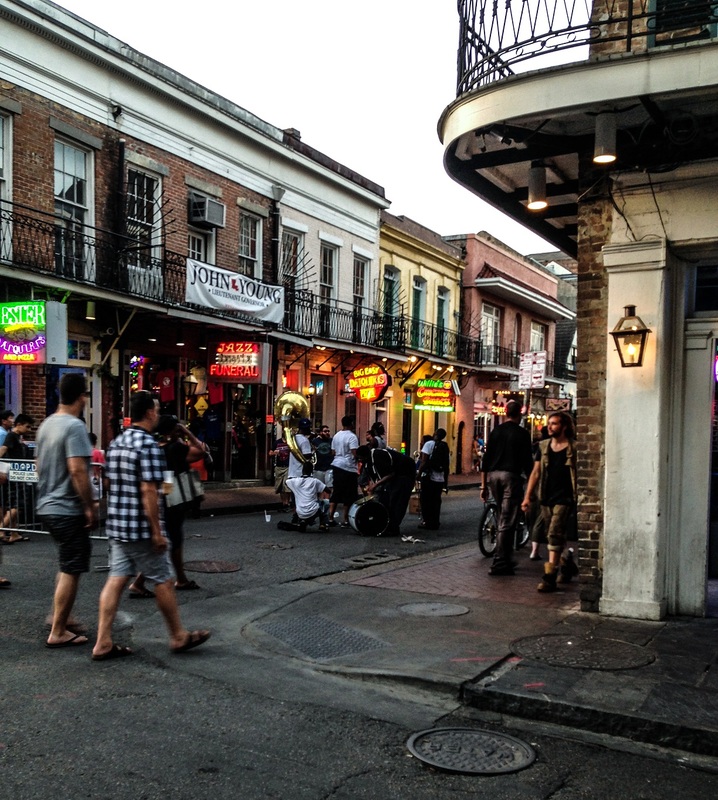 For a few hours we walked the interesting streets of the French Quarter, shopping and absorbing the culture of the great city. There were countless vendors that sold a variety of things. We saw the traditional Mardi Gras beads, souvenirs, and so much art work! I bought a print from a local artist of one the horses that give carriage rides to locals and tourists. All of the artwork was unique. And while the shopping was going great, we were even more amazed by the entertainment that filled the streets. Instruments of all sorts made music that could be heard throughout NOLA. Dancers, magicians, comedians, and many more make a living on the streets of New Orleans keeping folks entertained sun up to sun down. 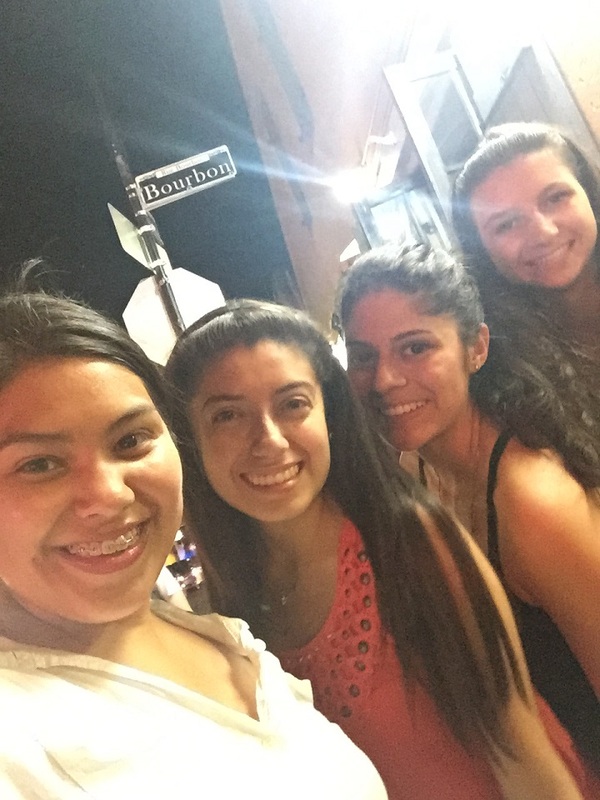 This was a new experience for all of us – especially Bourbon Street. Many of us had heard what it would be like, but being there was totally different than any of us expected. It was a diverse place that offers so much to do and see. For dinner we went to the famous Oceana Grill, we heard great things about this restaurant and couldn’t wait to try the food. We got there and were surprised by a long line of people waiting to be seated outside the door. After waiting in line, we finally got seated. 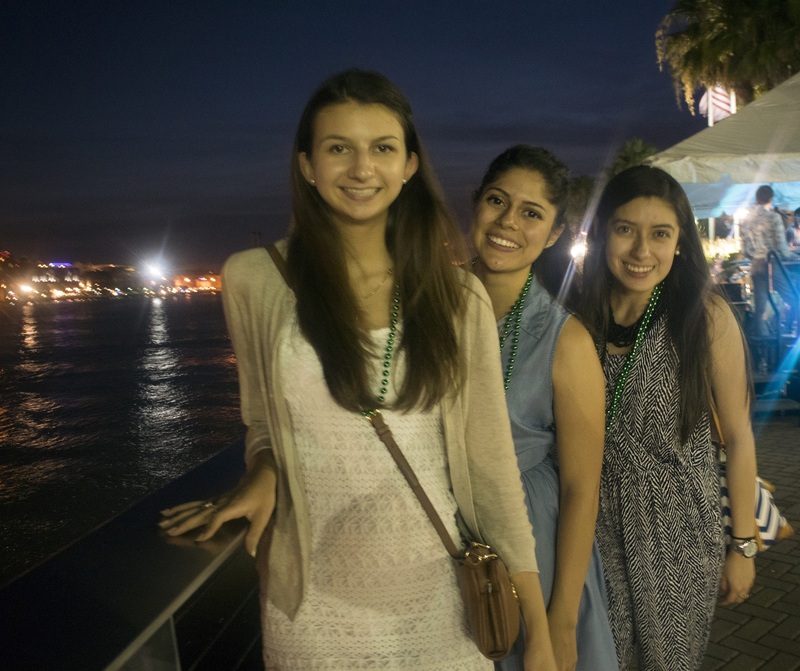 We began with gator tail bites, Cajun alligator sausage, Oceana’s famous oysters, and gumbo. For most of us it was our first time trying many of these appetizers. It seemed like a lot for starters, but they were all great and gone in no time. 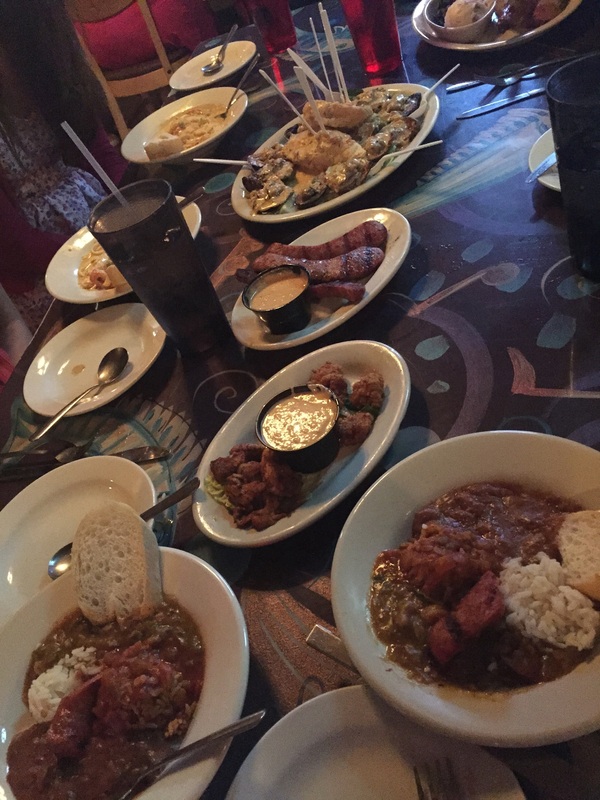 Megan and Alex shared one of New Orleans Favorites, the Taste of New Orleans that came with creole jambalaya, crawfish étouffée, red beans, and rice with smoked sausage. Kaitlyn and Karla shared a crawfish fettuccini pasta with freshly diced green peppers and New Orleans seasonings. We were all so pleased with our food, it was much more than we expected. It added more definition to the culture. After an appetizing dinner, we walked around the town for a while. The “day crowd” was different from the “night crowd”, but unique all the same. 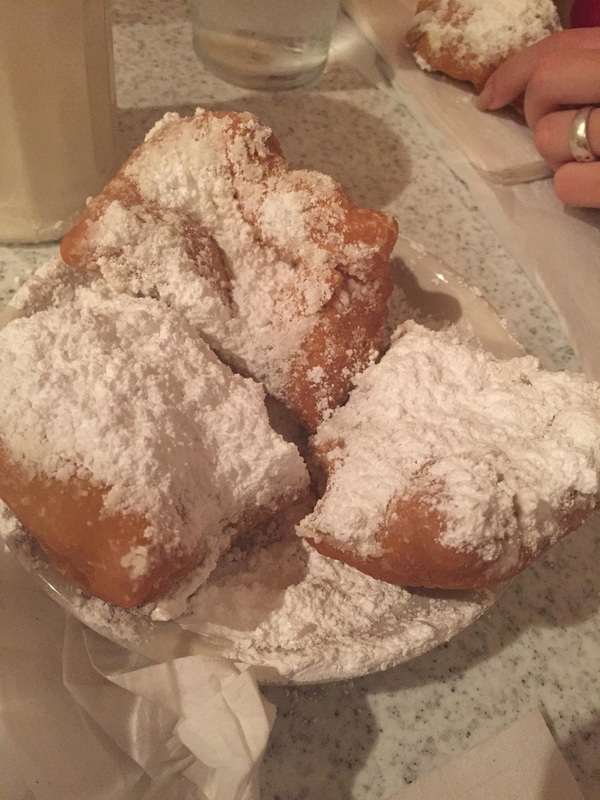 Dessert was spent at Café Du Monde enjoying some warm and fresh beignets and chatting about the day’s events. On the walk back to the hotel we enjoyed taking pictures at landmarks and learning a new way of life. We were all very sad that tomorrow would be the last day of our tour, but thankful to have had this amazing opportunity! The South has been great to us. 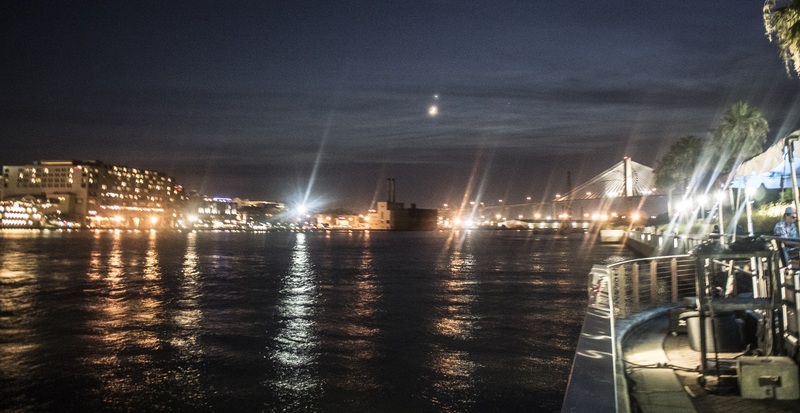 Sad to leave Savannah, we awoke early this morning before sun rise to begin our travels. Montgomery was our first destination of the day. Before heading into the city, we visited Liger’s Bakery for sweet treats to kick off the day. For a few of us, a doughnut was a perfect way to boost our energy after little sleep. In Montgomery, we first stopped to tour the Confederate White House. 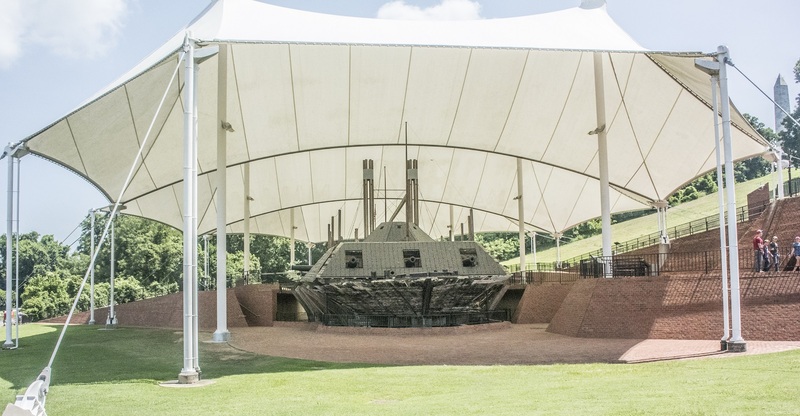 Once chosen for its central location within the Confederacy and for its easy access to travel routes, Montgomery was the perfect place to build the first Confederate White House during the Civil War. 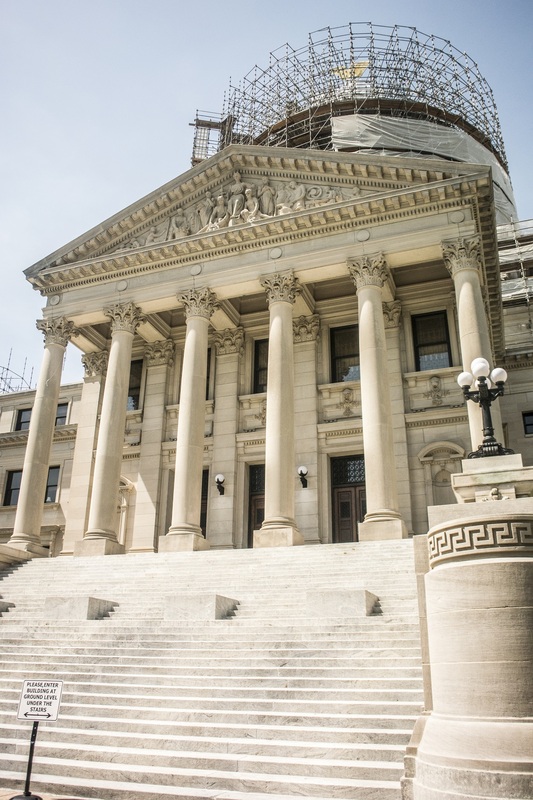 Since then, the building has been moved to its new location on the South side of the Alabama State Capitol. 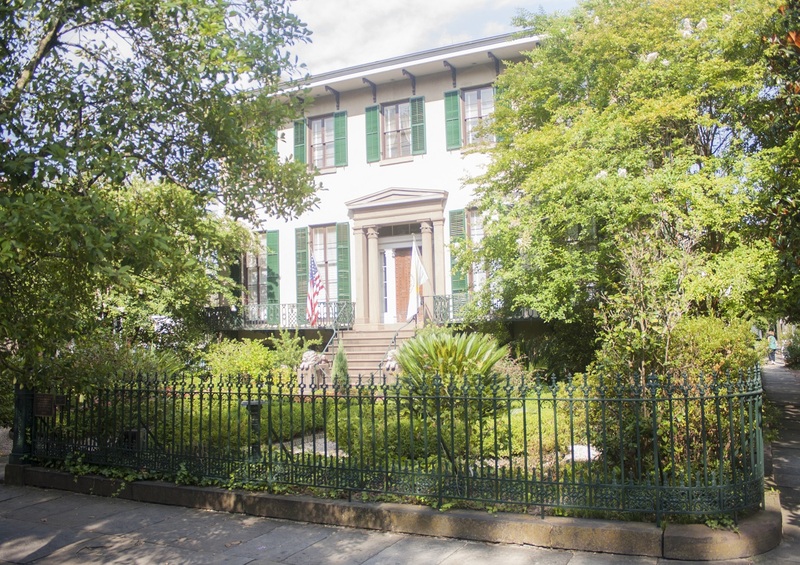 President of the Confederate White House, Jefferson Davis and his family lived in the home from the time it was built in 1835 until the time the Confederate Capitol was moved to Richmond in 1861. The home showcased two bedrooms, the First Parlor, the Second Parlor, the Dining Room, and the President’s Study. 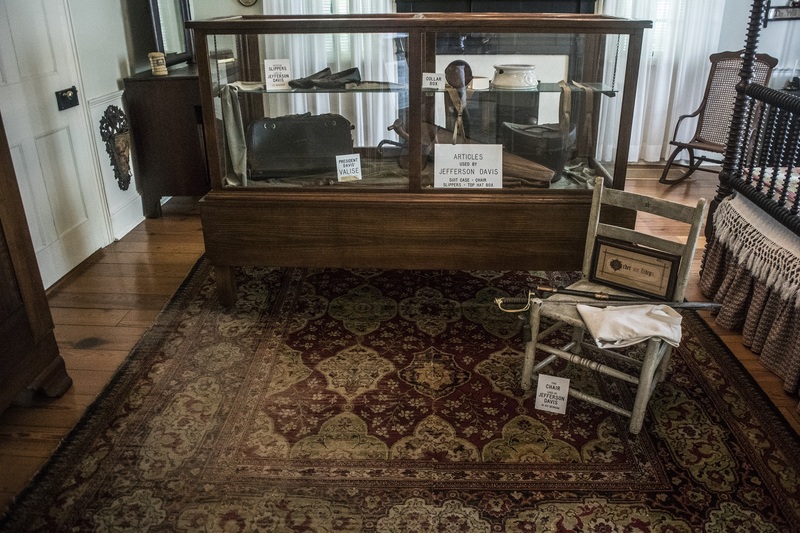 The first of the two bedrooms was Jefferson Davis’s bedroom which included artifacts from throughout his life, such as his slippers and Bible. Another interesting room, the President’s Study contained many pieces of furniture used by Jefferson Davis and was a room where many important decisions were made for the Confederacy. 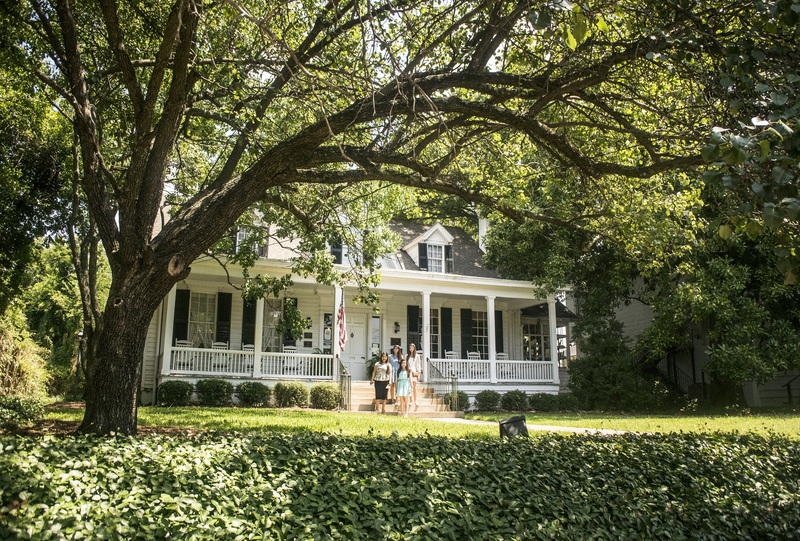 Amidst the current controversy surrounding the Confederate Flag, the Confederate White House in Montgomery seemed unbothered by the dispute and fit in with the surrounding landscape with the capitol. 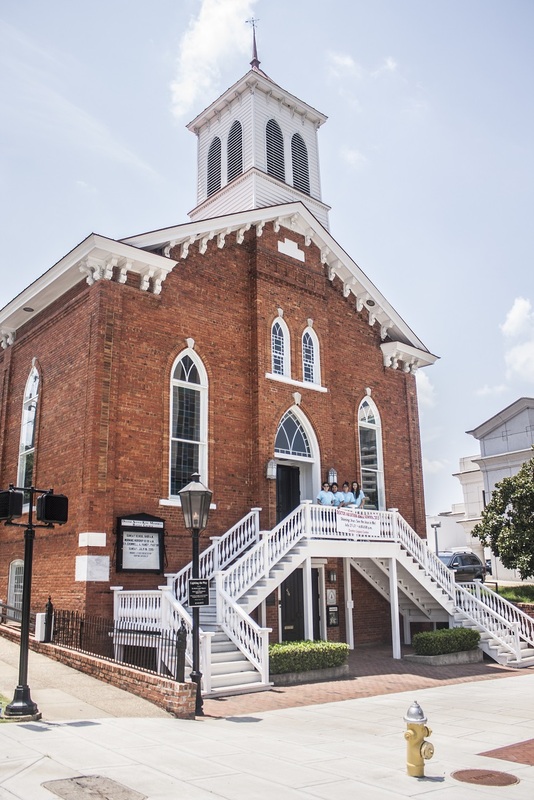 Against this strong backdrop of confederate history, more modern history also played out in Montgomery–the civil rights movement. Rosa Parks was a thriving civil rights activist along with Martin Luther King Jr. and Reverend E.D. Nixon. She was born and raised in Tuskegee, Alabama. Because her mother was an educator, she was taught to read and write and later attended the city Industrial School for Girls. …and the bus stop where she was arrested. 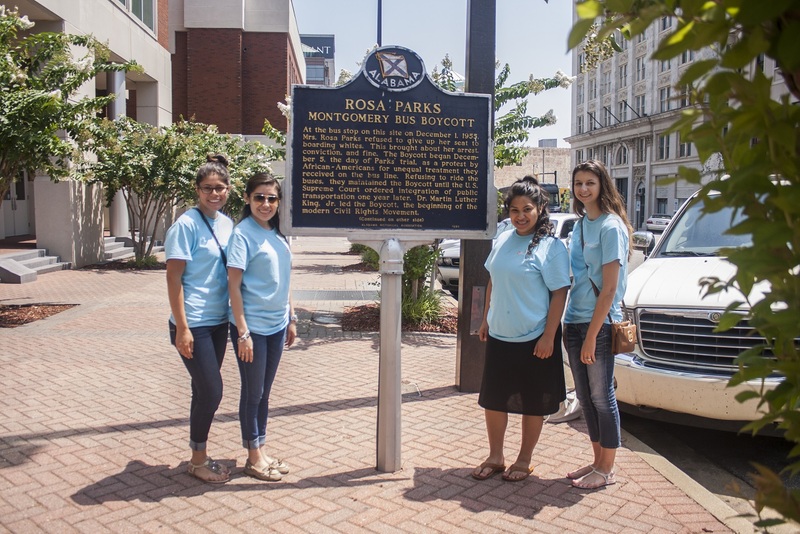 The Rosa Parks Library and Museum tour began with background history of Mrs. Rosa Parks and her involvement in the Civil Rights Movement. She was the secretary of the NAACP and worked very closely with Dr. King and Rev. Nixon in the nonviolent protest for equality. Mrs. Parks refused to give up her seat on the bus and was arrested. This was a transition point for the state of Alabama and segregation laws. This also prompted the Bus Boycott that caused the bus companies to lose thousands of dollars. 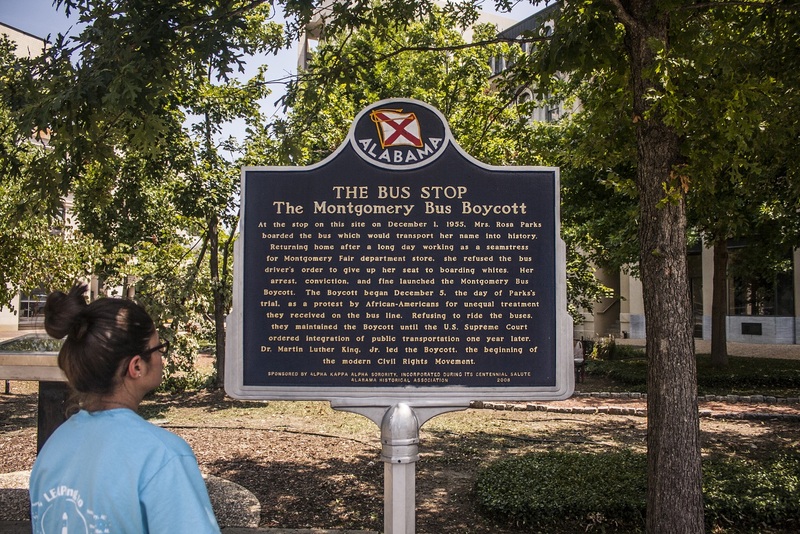 In order to support the boycott African Americans refused to ride the bus, so they walked or carpooled around town. This boycott lasted 13 months until justice was served. Rosa Parks was the perfect example of using educational and spiritual guidance to seek justice. Her and many other Civil Rights leaders have paved the way for many Americans today. Following the tour of the museum, we walked across the street to stand at the spot she was arrested. It was an honor standing in a place where a brave woman had made up her mind to be treated nothing less than equal. With conviction and respect, we stood reflecting upon how different America would be today without Rosa Parks contribution and leadership in the Civil Rights Movement. Time was running short so we made our way to visit the Alabama State Capitol, after briefly checking out some of the beautiful architecture, art, and history in the downtown. 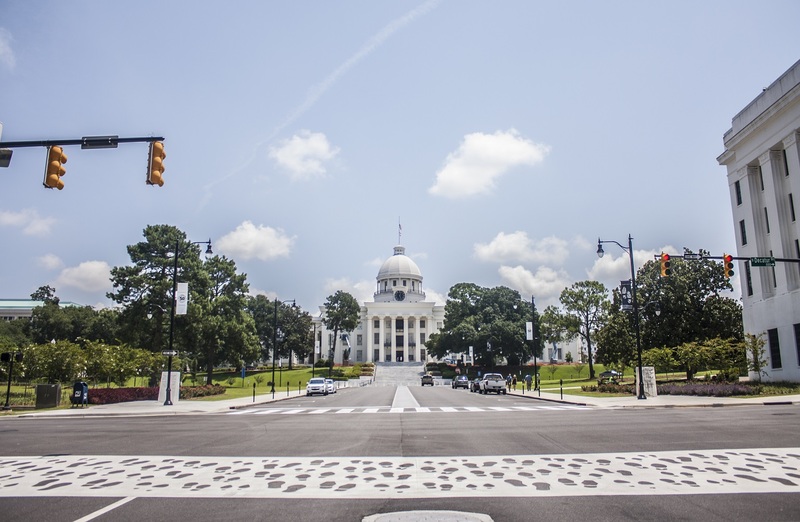 Architecturally, the Alabama State Capitol modestly resembles the United States White House. Much smaller than the Texas State Capitol, many offices have moved out of the main Capitol building and into various buildings bordering the Capitol building. 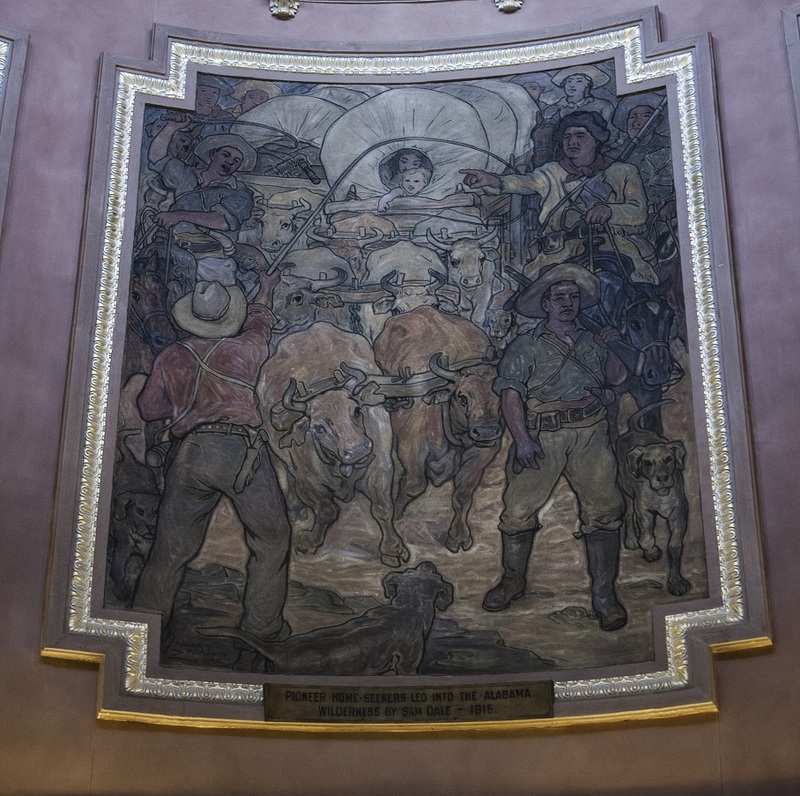 Our self-guided tour began in the Governor’s Hall, a common feature of state capitol buildings. Here, we admired the portraits of previous Alabama Governors leading up to the current Governor’s office. Also, on the first floor we were able to see the previous Supreme Courtroom which has now been converted into a World War Memorial. On the second floor, the previous House and Senate Chambers are now open for public viewing. 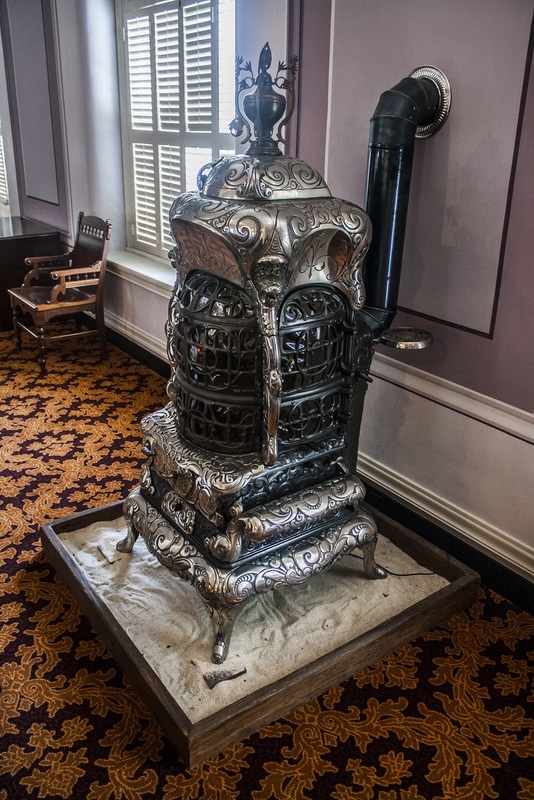 Reflective of the Antebellum Era, much of the furniture and fixtures were original from when the capitol building was originally built in 1849. Part of the second floor opened up to the rotunda, richly decorated in warm colors with scenes throughout Alabama’s history. 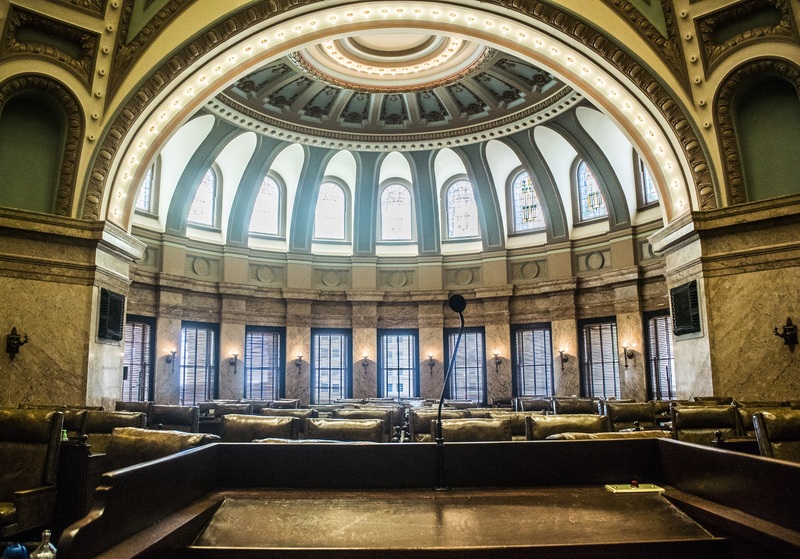 Finally, the third floor consisted of the House and Senate gallery where citizens could come and observe the legislature in session. 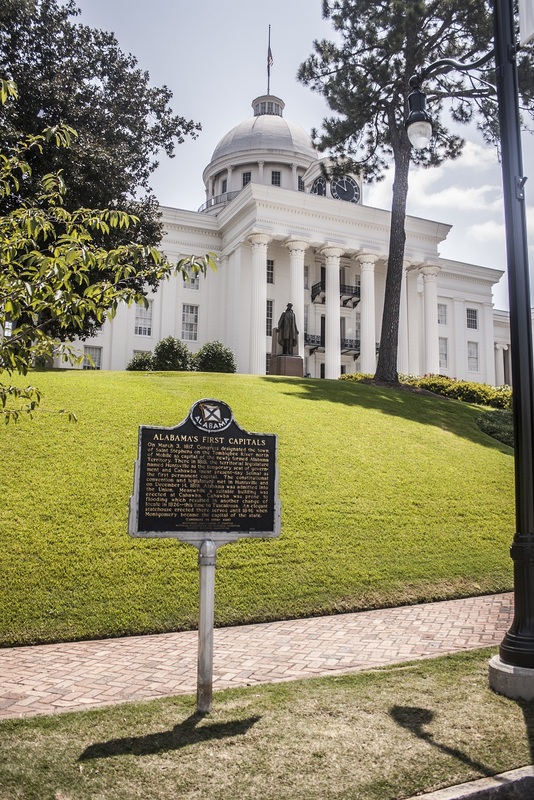 One of the most interesting locations at the Alabama State Capitol is the location where Jefferson Davis was sworn in as President of the Confederacy. 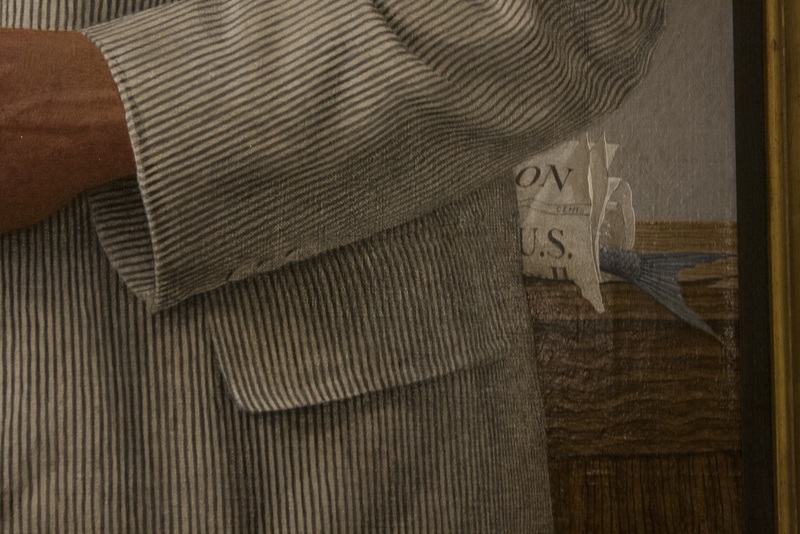 Marked by a bronze star, everyday visitors are able to stand in the same spot Jefferson Davis entered office for the confederacy. 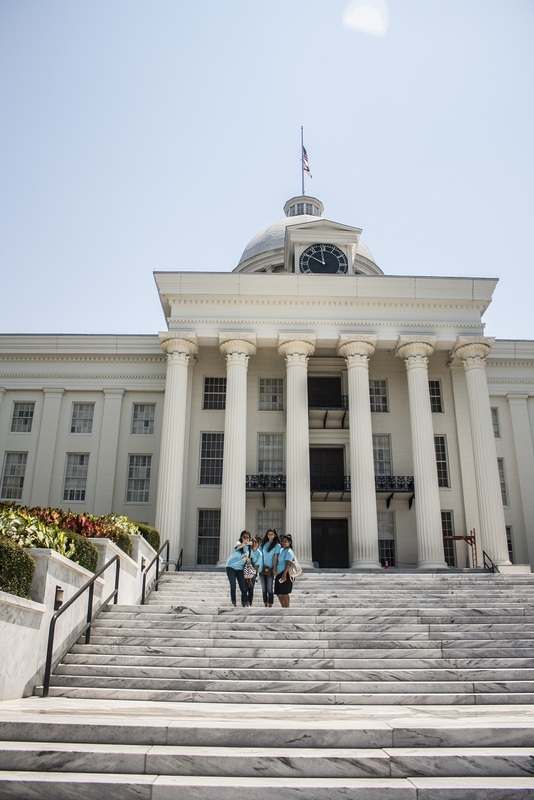 The Alabama State Capitol is our third state capitol to visit on our Tour of the Deep South. Not only has it been interesting to learn about their architectural similarities and differences, but also to learn about how the state government works in each state. In order to stay on schedule, we hurried over to the Dexter Avenue King Memorial Baptist Church where Dr. Martin Luther King Jr. preached for six years of his life to read the historical marker and take a quick picture. Interestingly, the cross-walk in front of the church is marked by painted shoeprints. 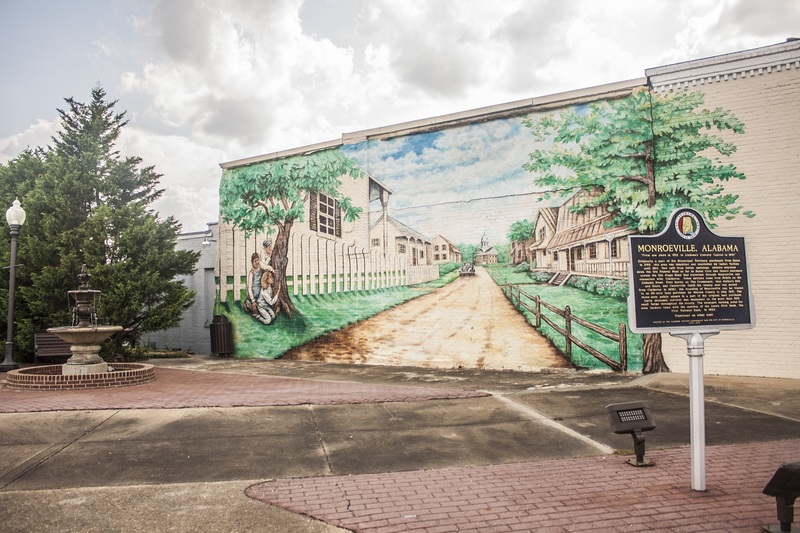 The shoeprints not only decorate the city scape, but also reflect MLK’s march from Selma to Montgomery, but also the African-American’s bus boycott, which required them to walk rather than take the bus. For lunch we went to Chris’, home of the world famous hot dogs in Montgomery, Alabama. Chris’ opened in 1917, celebrating their 98th year anniversary May 1st of this year. The restaurant is mostly known for their hot dogs. Their special hot dog comes with 2 dogs, sauerkraut, chili, onions, and mustard. The addition of their famous Chris’ chili gives its world famous recognition. Not only did the restaurant have great lunch food, it also has an interesting history. 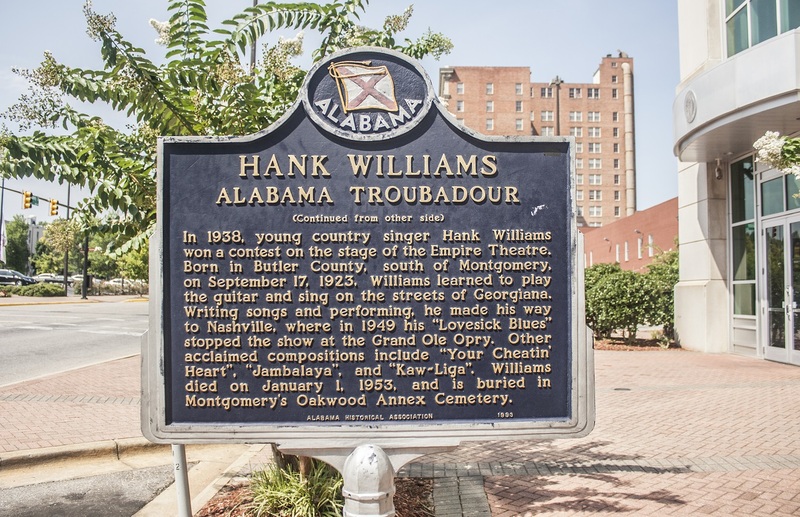 Hank Williams, a famous country musician often visited Chris’, making it one of the hottest places to hangout in the mid nineteen hundreds. The restaurant also advertises their support of equality during the Civil Rights Movement where their served African American citizens alongside white citizens. In the end, this was a neat place to have a comfortable lunch in the heart of downtown Montgomery. After lunch we embarked on our trip to Monroeville, Alabama. 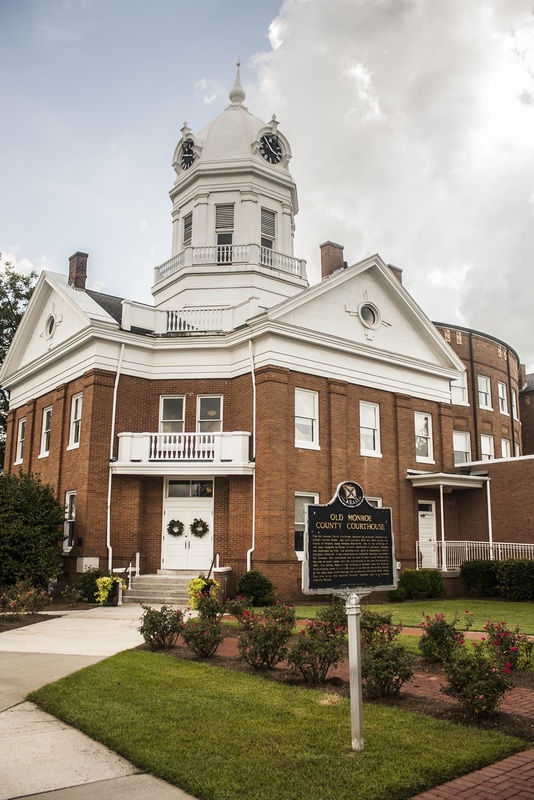 Once we arrived in Monroeville we stopped to tour the Old Monroe County Courthouse to learn more about Harper Lee and her friend, Truman Capote. Harper Lee is the author of “To Kill a Mockingbird” and Truman Capote is the author of “In Cold Blood” and “Breakfast at Tiffany’s”. 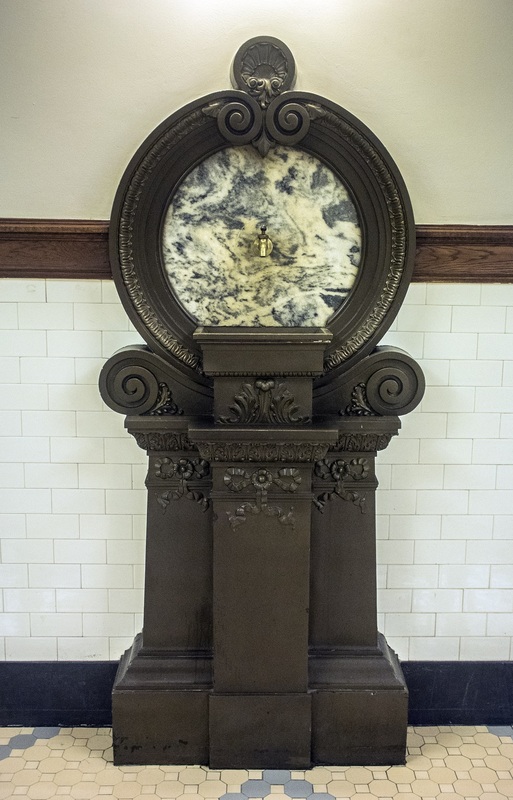 The Old Monroe County Court House was restored to its 1930’s appearance. 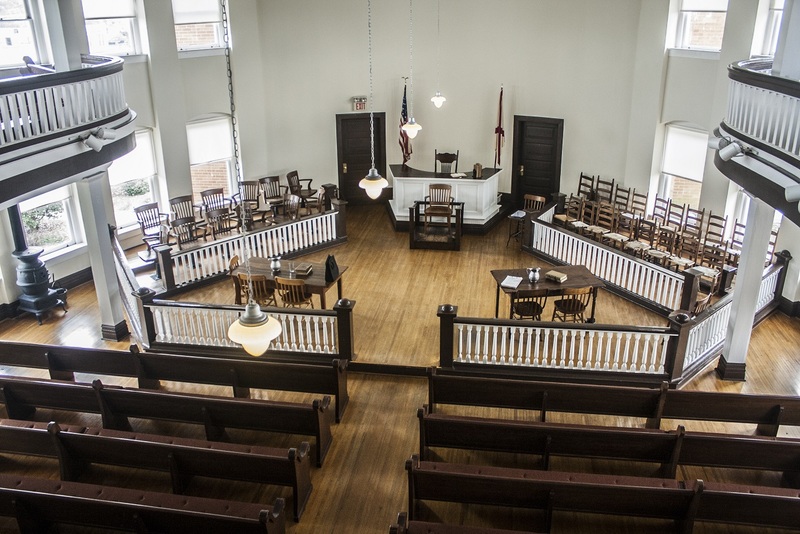 The courthouse is also the model for the courtroom in the To Kill A Mockingbird movie. As we arrived in Biloxi, we searched to find dinner. In the end, we chose Adventurous Pub and Spirits. 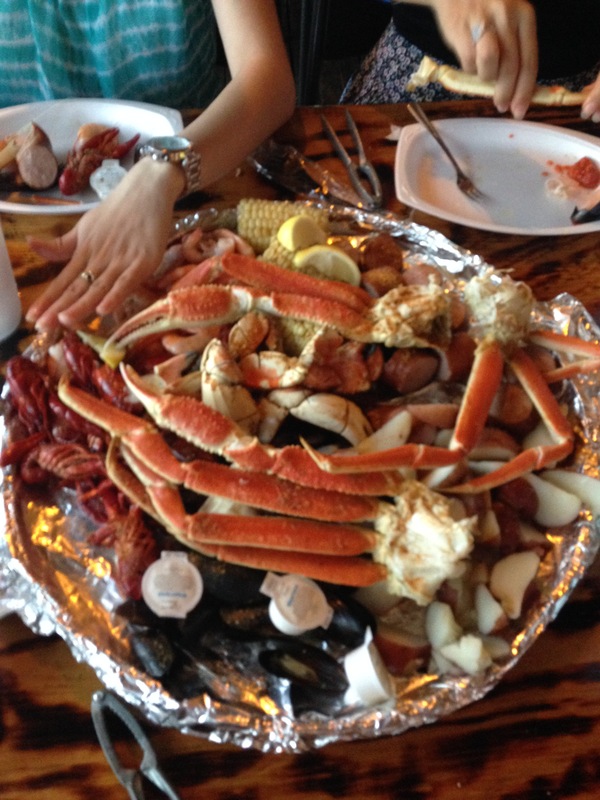 A few members of the group shared the seafood platter with a combination of fried shrimp, oysters, catfish, and fries. Biloxi’s location to the Gulf of Mexico, made seafood an easy choice for dinner. Although, it was a much different restaurant than what we expected, the group enjoyed it and headed to check into our hotel to catch up on extra rest. 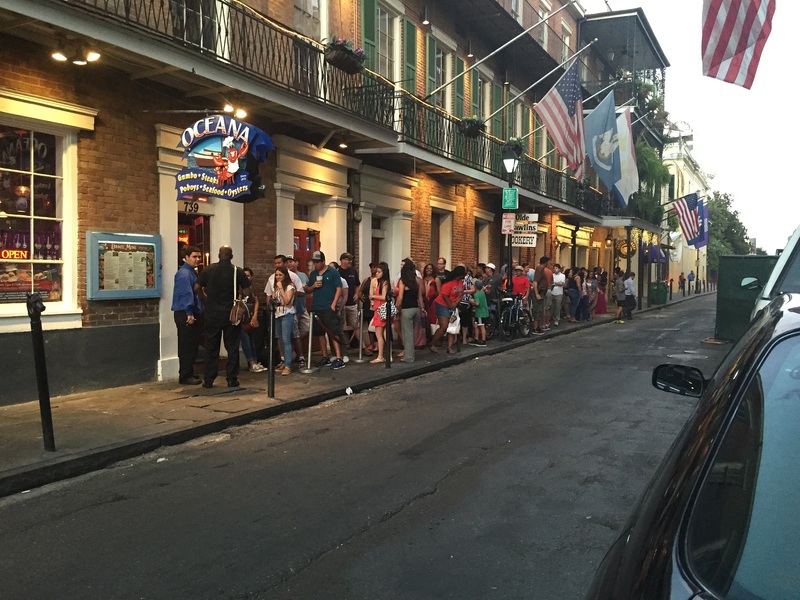 Tomorrow, we have another eventful day of sightseeing and traveling as we head to New Orleans. We knew that today would be great because we were going to spend part of the day shopping! Early Monday morning we hit the squares to find souvenirs, clothes, and candy. City Market is full of small shops that are all unique. As we were shopping we also had the opportunity to visit many of the areas within the historical district we learned about the day before. After we finished City Market, we also walked down River Street (conveniently named for its location on the Savannah River) to do some last minute shopping and enjoy the view. The group bought gifts for our family members, including lots of candy from the Savannah Candy Kitchen. We all have thoroughly enjoyed the pralines. Savannah has the best by far! With all the purchases and walking around the squares we worked up quite an appetite and we decided to try a local pizzeria called Your Pie. Your Pie was a welcome break from the heat and humidity Savannah summers offer. We decided to split the ten inch pizzas, which turned out to be the perfect sharing size. However, before the pizza arrived, we indulged in cheese sticks, but we considered them to be more like cheese bread. 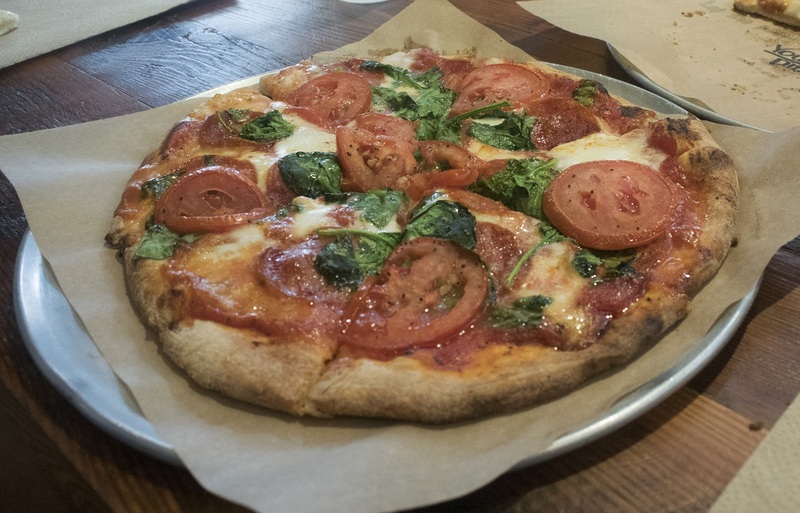 Megan and Alex decided to custom make their pizza, while Kaitlyn and Karla opted for a specialty pizza called “The Nat”. When the pizzas arrived, we were not disappointed at all. Fresh out of the wood fire oven, the cheese was perfectly gooey. The pizza gave us energy as we headed down the block to Mabel’s Cupcake Emporium. 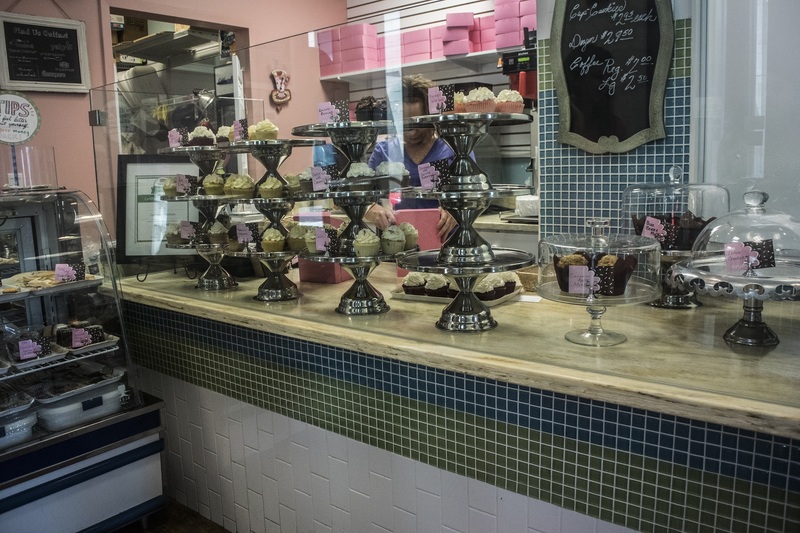 Rumored to have the best cupcakes in Savannah, we wanted to see for ourselves! After ordering various flavors, we agreed that the Rich Butter Vanilla cupcake was our favorite. After lunch, we continued our sightseeing of historic Savannah. 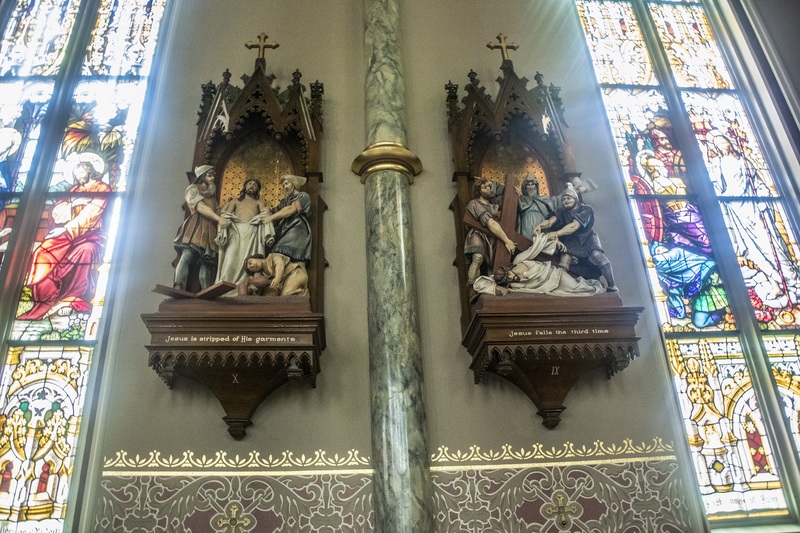 Our first stop was to the Cathedral of St. John the Baptist. 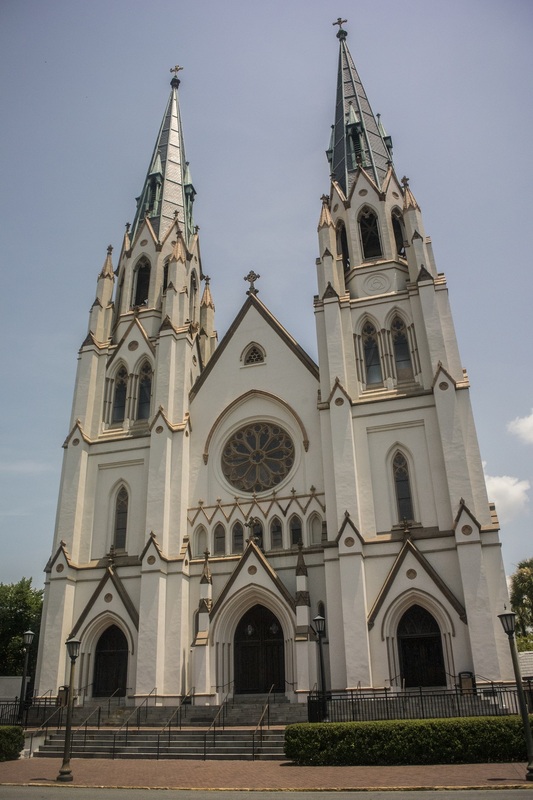 Built in 1863, the cathedral is one of the tallest structures in Savannah. 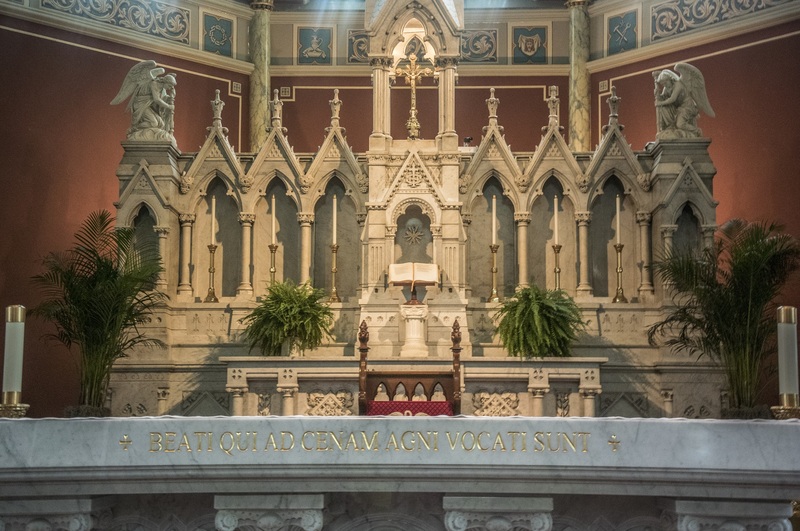 When walking in, we all paused in amazement of the intricacies and beautiful interior of the Cathedral. 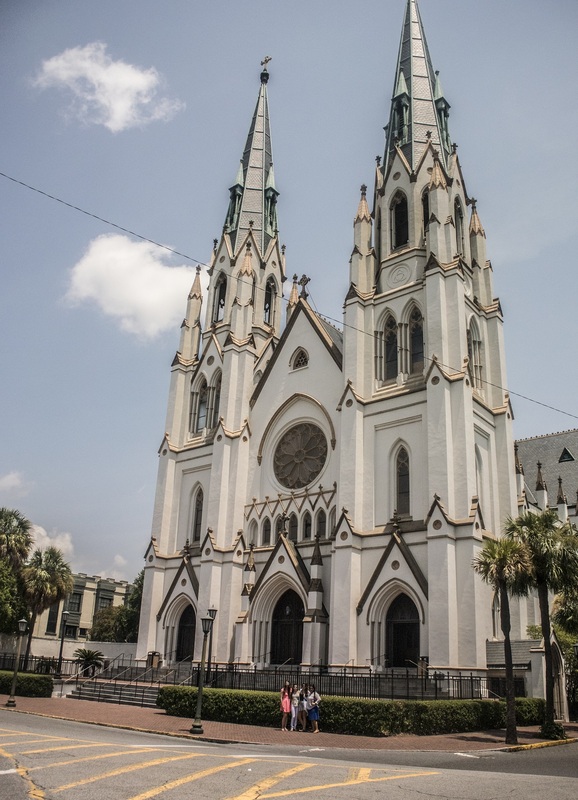 The church brings many visitors every year because of its beauty and Gothic architecture. 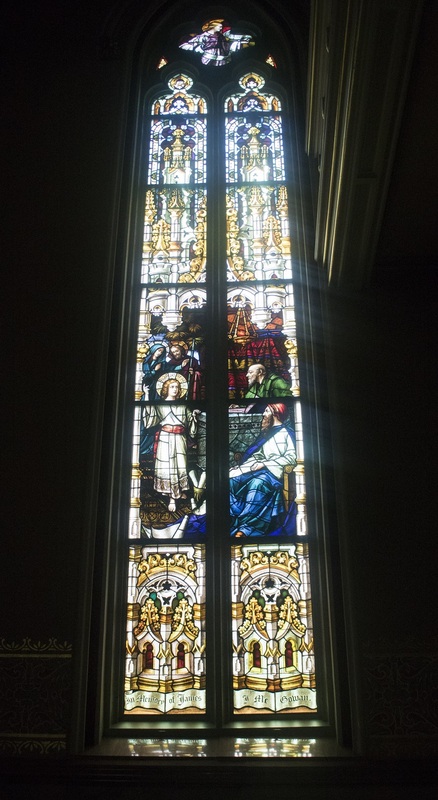 One of the intricate details of the church included numerous stained glass windows with detailed biblical scenes on them. The walls also had decorative narratives from the Bible. The grandeur of the Cathedral can be observed from every angle which we thoroughly enjoyed. Also, in our free time we visited Chipewa Square where Forrest Gump filmed a scene where Forrest famously says “Life is like a box of chocolates, you never know what you’re going to get.” In an effort to recreate the picture, we searched the bench where the scene was filmed, but came to the conclusion that the bench had been moved for the purpose of filming the movie and chose one with a similar view. And a group photo at the fountain. 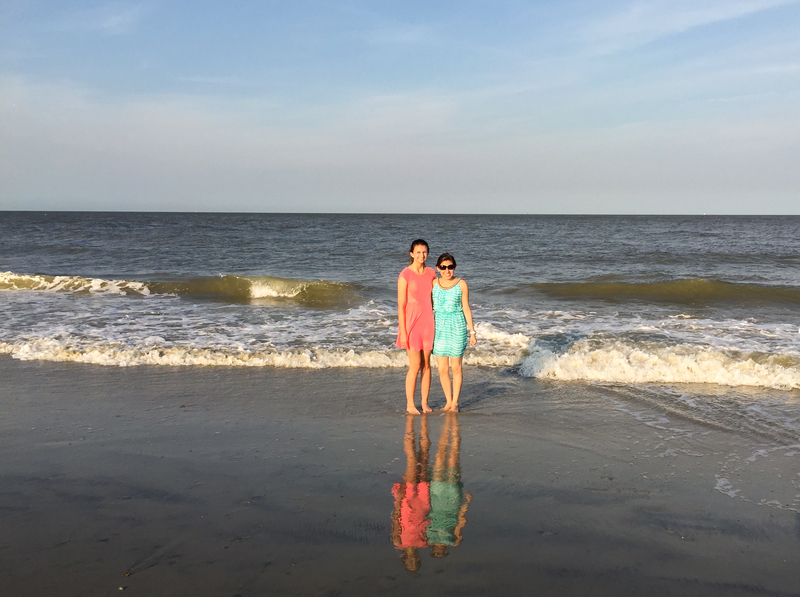 Once we we’re finished touring and shopping at Historic Savannah, we headed to Tybee Island. 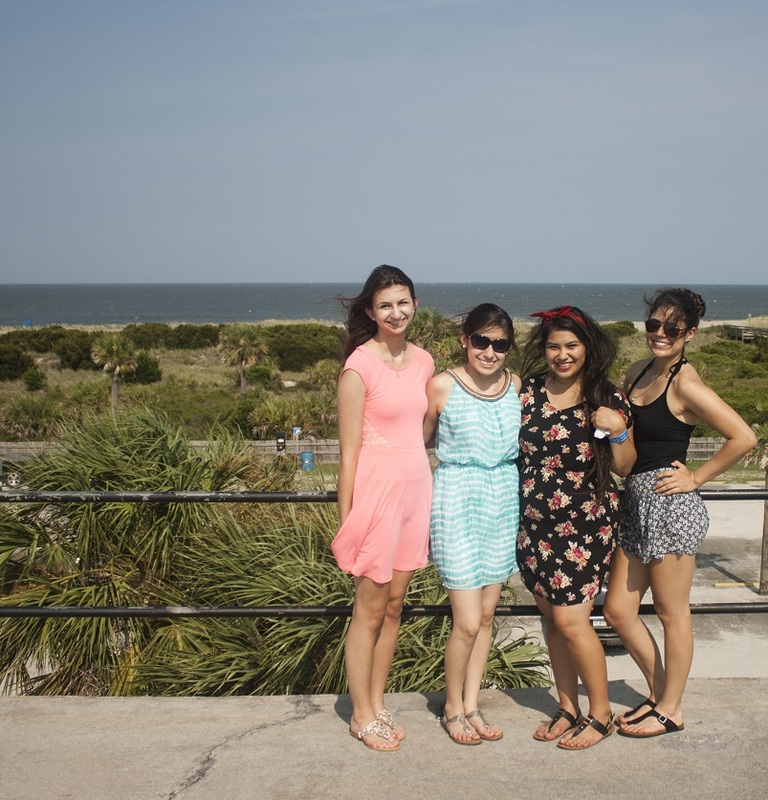 While in Tybee we visited the Tybee Island Light Station and Museum. Although it sounded daunting, we were excited to begin the 178 step climb up to the top of the light house. The climb up to the light house served as a great workout for us! We eventually all reached the top of the light house which is 145 feet tall and 154 feet above sea level. Some of us were nervous to step out onto the ledge of the light house but everyone eventually got to enjoy the view despite the phobia of heights. 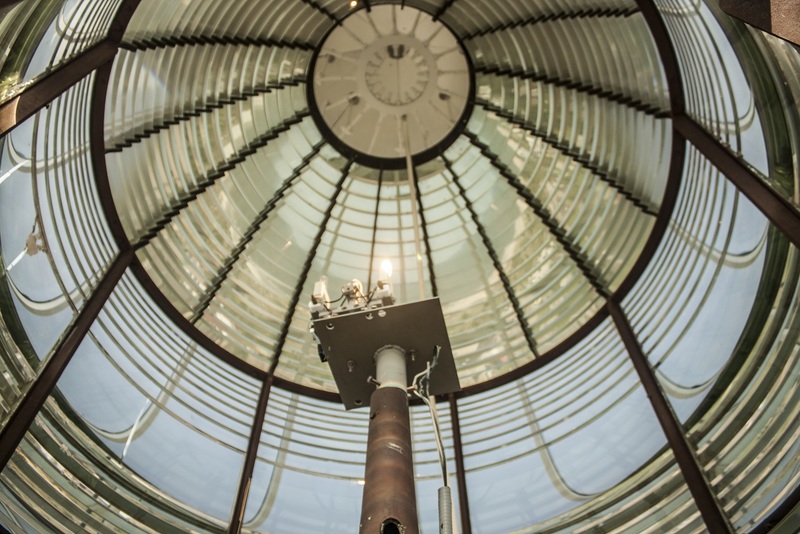 We even got a peek at the lighthouse lens, which was always on and required a 1,000 watt bulb–the brightness of which was amplified by numerous and layered reflectors. The system that was put in place consists of two lightbulbs, one in use and one ready to light up when the other burns out. and shots of the view from the top. After taking many pictures at the top and enjoying the view along with the breeze, we descended down the flight of stairs again. Once we finally reached the ground we were able to tour the homes of the Lighthouse Keepers that were built in 1881. 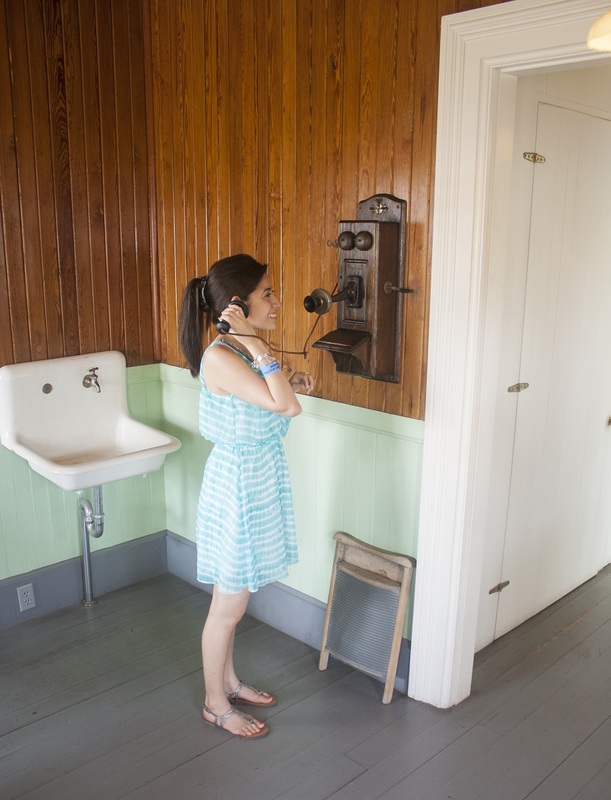 We enjoyed wandering inside the homes and finding old metal irons and telephones that had once been used. We exited the Tybee Lighthouse and Museum through the gift shop and headed across the street to the Fort Screven Museum. In the museum, we learned about the origin of the settlers and meaning of Tybee. 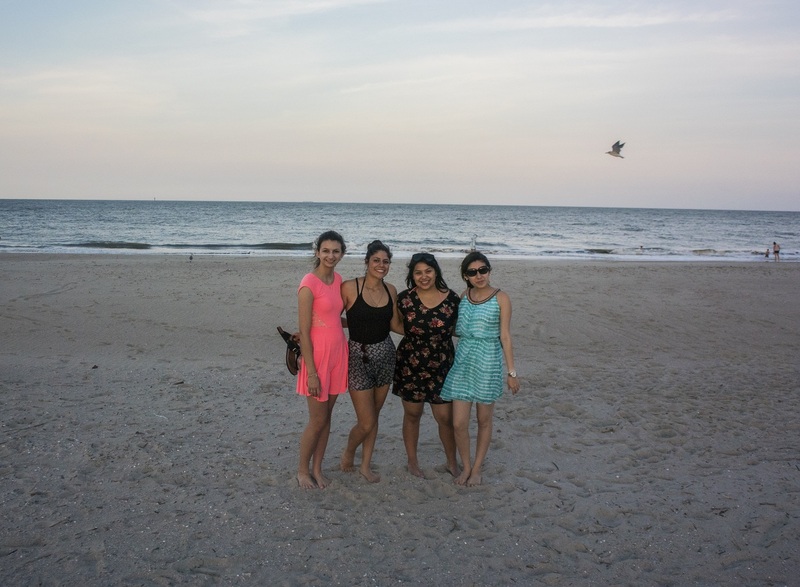 The Spanish were the first to arrive on Tybee and we also learned that “Tybee” is a Native American word for salt. As we walked through the museum, we were able to see how much has changed in the past century. We saw an old diving outfit that had a helmet which weighed 31 pounds! We also walked through an exhibit that showed the evolution of the swimsuit, which we found very interesting. The museum had an exit onto the roof top so we went up and enjoyed the beachfront view for a while before heading to dinner. After the adventurous tour at the light house and Fort Screven, we headed to the Crab Shack for dinner. Throughout our travels, many people recommended the restaurant to us, making it a must try! The restaurant’s decor was interesting and the food was great (visitors be warned: no air-conditioning). We had their specialty sampler dish for three with shrimp, crab, crawfish, mussels, potatoes, sausage, and corn. Our food was served on one larger tray which brought enough food for the entire group of six to eat. The restaurant also has a mini-gator farm, where patrons can feed the baby gators with “gator treats” (for $3…). 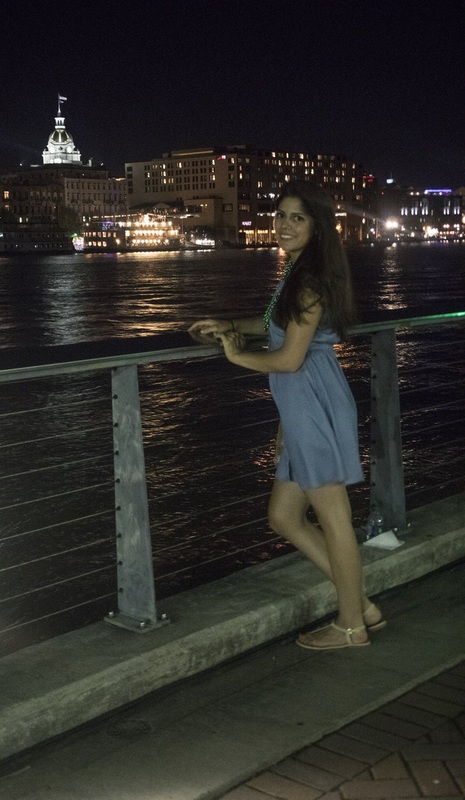 Since we were extremely close to the ocean, we hoped the seafood would live up to our grand expectations and we were satisfied when we walked away. At the beach, we enjoyed the waves and the sunshine. Ending our delicious dinner and fun times at the beach, was time to get back to the hotel to freshen up for the Kentucky Kick off Reception. As the day came to a close, we joined the other participants of the STL conference on the Kentucky Bourbon Trail. 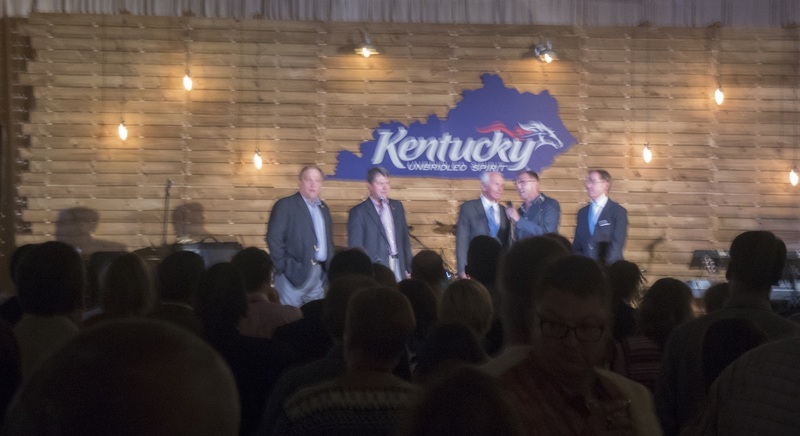 This was a kickoff social for the upcoming STL Conference in Lexington, Kentucky next year. 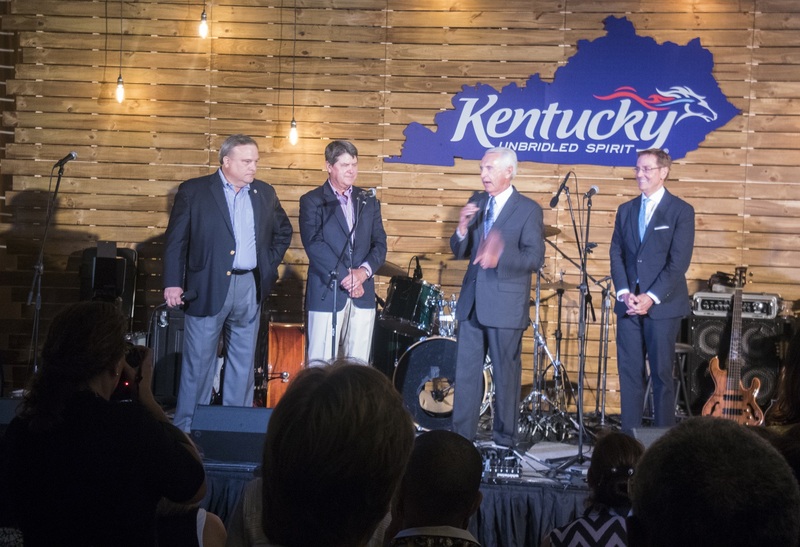 Governor Beshear of Kentucky, Kentucky Speaker of the House, the Kentucky President of the Senate, and the Mayor of Lexington flew in and gave an introductory speech and expressed their excitement for the upcoming STL Conference in Lexington by formally inviting guests. I want to talk about what brings us together. You know about Kentucky’s horses, and the Kentucky Derby; you know about the first Saturday in May; you know about our history; but I want to stress more substantive things, what really brings people together: short, tall, black, white, male, female. Kentucky Bourbon! There were small refreshments for us to enjoy throughout the night. We tasted the ham and beef mini sandwiches. Also, the homemade bread pudding was scrumptious. I think all of us would agree that we have had the best and second best versions of bread pudding we’ve ever tried, although we were in disagreement as to whether the Paula Deen bread pudding (with rum sauce) was better, or whether the Kentucky version (with bourbon and more icing) was the best. Our plan was to wait on the bread pudding until we got to its home, New Orleans, but that plan went out the window. The others tried the various cheeses that were available and seemed to have been a fan. Kentucky did a great job of putting out the best of the state. We watched the mingling for a while and after a while decided that tomorrow will come early, so it was time to head back to the hotel. On the walk home I reflected in the day and was kind of sad that my stay in Savannah will soon be over. 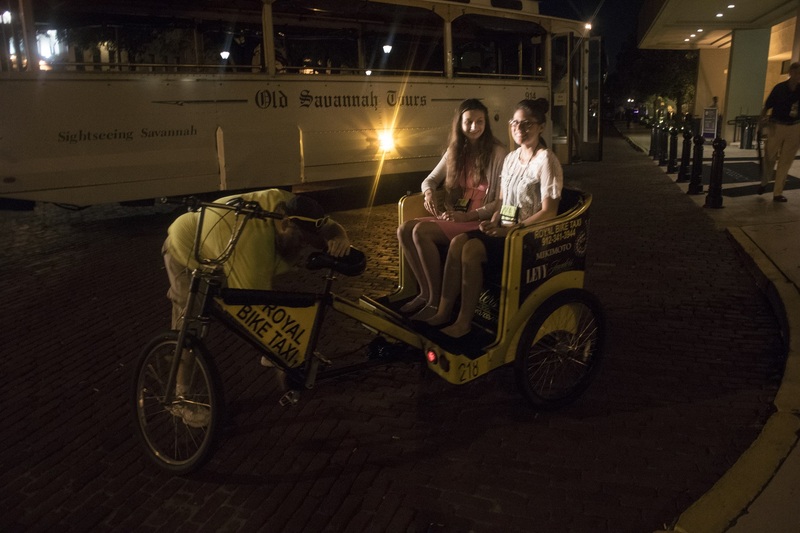 For a few of us, Professor Yawn treated us to a bike taxi which was a fun way to end the evening and see a little more of beautiful Savannah! Each day, we’ve been having a great time learning and experiencing new things. 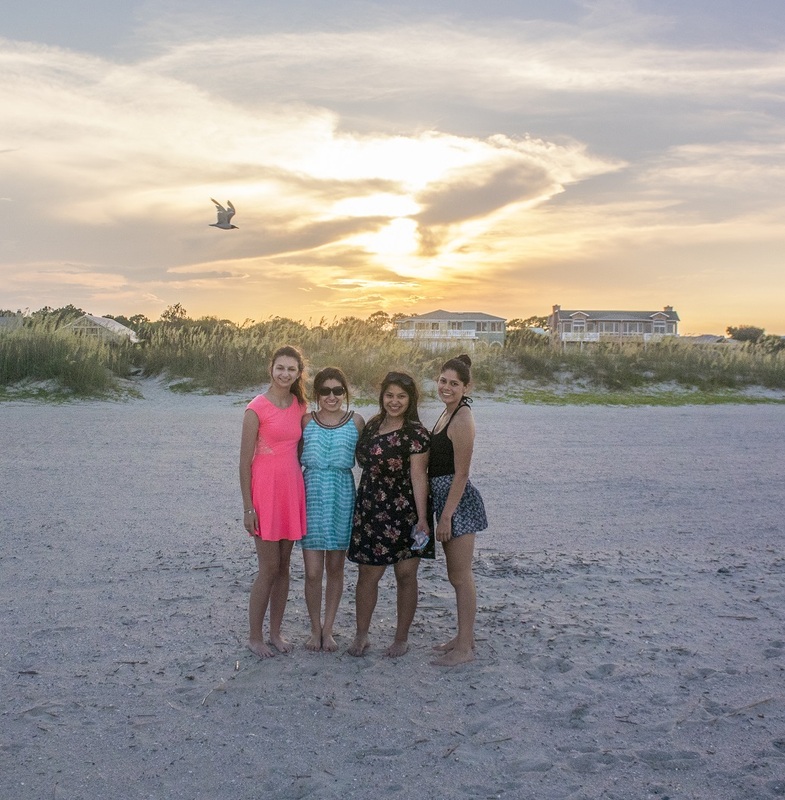 Tomorrow, we will make the most of the day…for it will be our last day full day in Savannah. 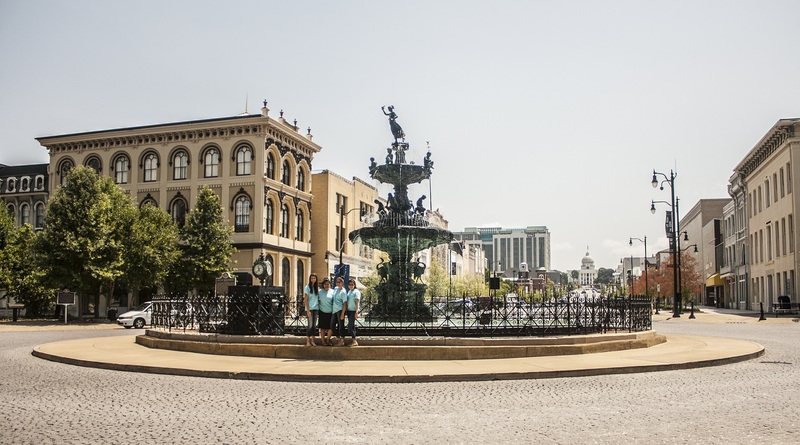 After a long nights rest, we were ready to take on Savannah, Georgia and all of its rich history. 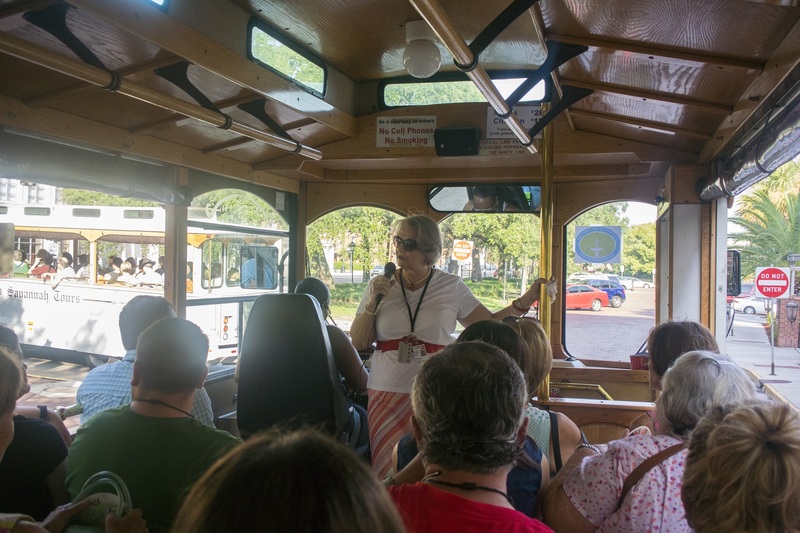 Thanks to the Southern Legislative Conference we were able to go on a trolley tour of Historic Savannah. As we drove through all 22 squares, our tour guide, Dotty, gave us a brief history of them and what all the statues located in them represent. We learned much about James Oglethorpe, the man who founded Savannah. We also learned that he worked closely with Native American Chief Tomochichi who is buried in one of the beautiful squares. We were able to stop and take a tour of the Andrew Low house that was built in 1848. 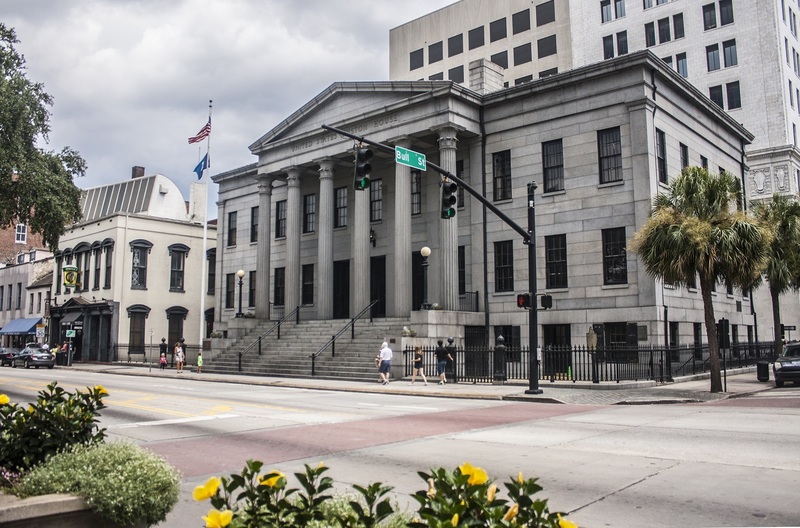 Low was not only a prominent member of Savannah’s business and social classes, but he was the father-in-law of Juliette Gordon Low, who founded the Girl Scouts in the early 20th century. In fact, she founded the Girl Scouts in the carriage house of the Andrew Low House. …and other local landmarks, in a town filled with architectural wonders. 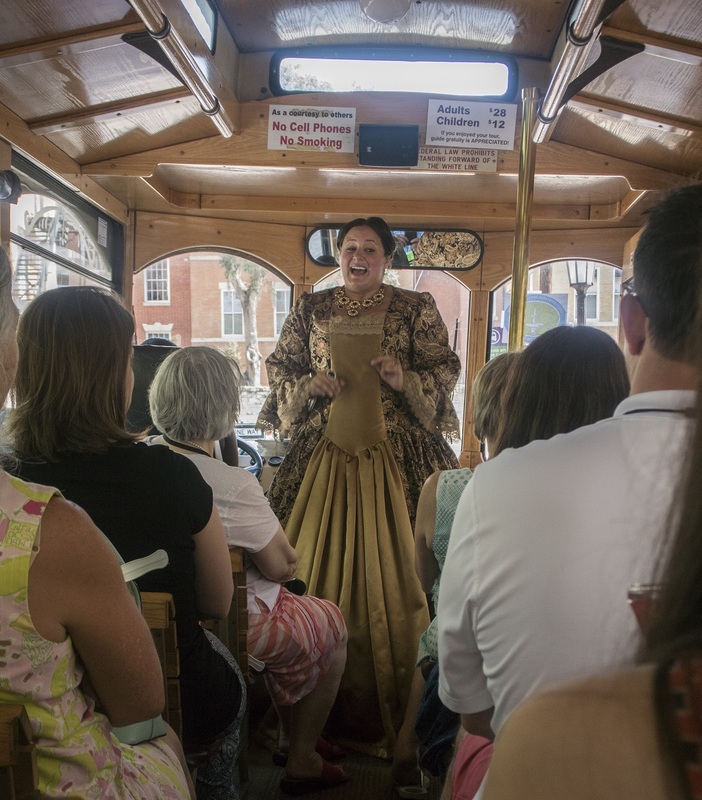 After we left the home tour we settled back in the trolley to continue our tour of historic Savannah and were able to see beautiful homes and learn the history behind local schools and churches. We also had an actress from the local theater tell the story of Fanny Kemble, whose published journals about slavery helped turn British opinion against the confederacy. 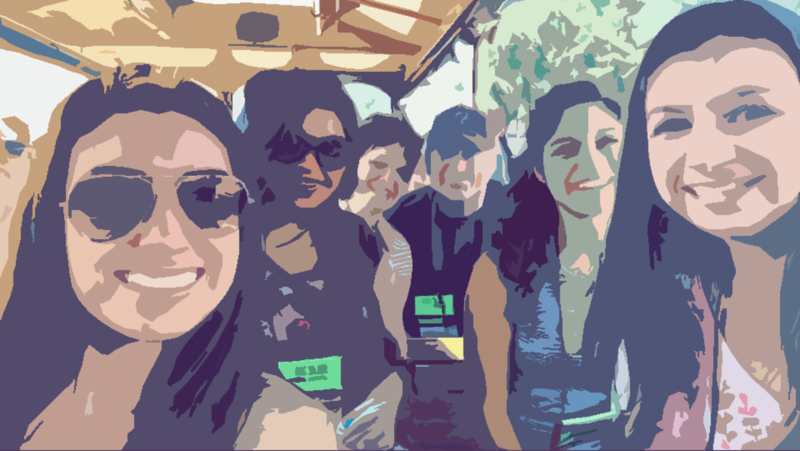 It was a long trolley ride (3 hours), but it was fun together time, and a great way to learn the history of a history-rich area. 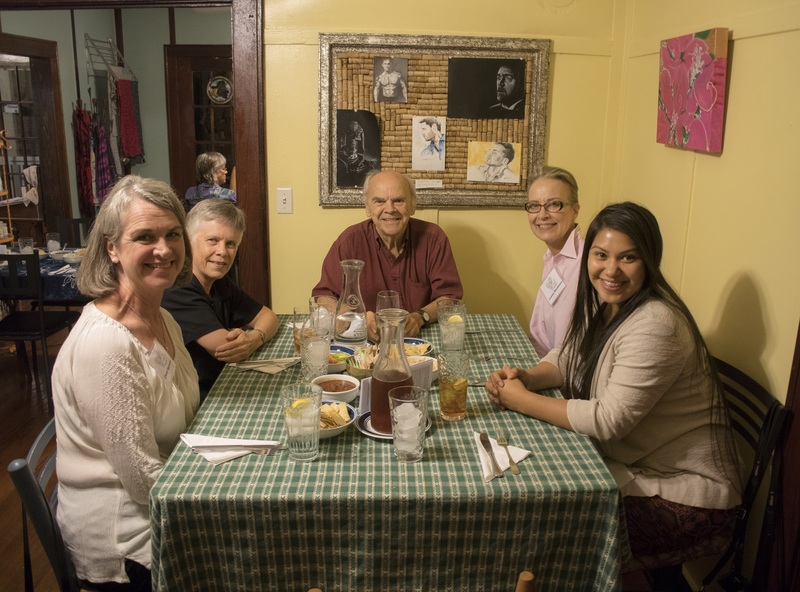 After all the learning, we were ready to eat a delicious meal at Lady and Sons. Our historic trolley tour of Savannah ended with lunch at The Lady & Sons, Chef Paula Deen’s restaurant. 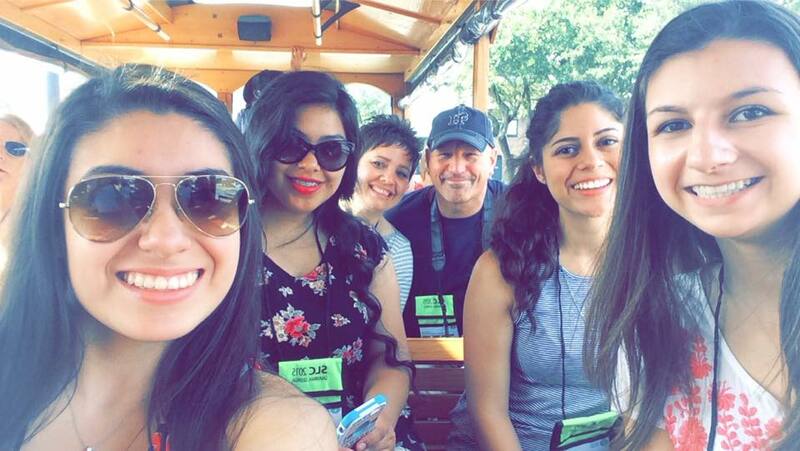 After spending the morning touring the city by trolley, our group was eager to enjoy traditional Southern food. Our lunch included access to the buffet, the salad bar, and our choice of dessert. Many of us enjoyed the sweet tea, which is not only a staple in the South, but also very refreshing. Among the buffet, our choices included: Paula Deen’s famous fried chicken, pulled pork, mashed potatoes, green beans, sweet potatoes, macaroni and cheese, and a variety of additional southern sides. For dessert, we chose from banana pudding, peach cobbler, and gooey butter cake. 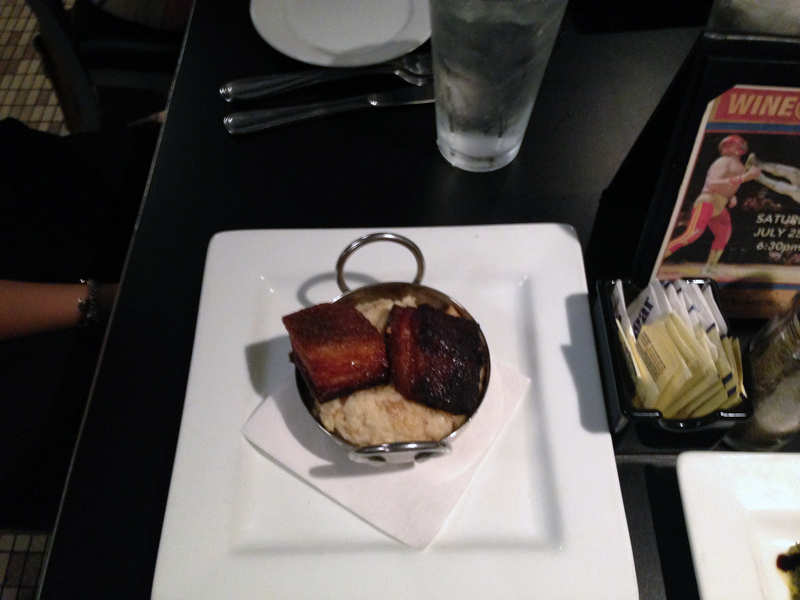 In addition, we ordered the bread pudding to sample. The bread pudding was especially delicious because it was topped with a warm butter-rum sauce. In addition, we sampled the other desserts, with the gooey butter cake winning our hearts, but all were delicious and filling. Keeping with the theme of the Southern Legislative Conference, Paula Deen’s restaurant fit in perfectly! 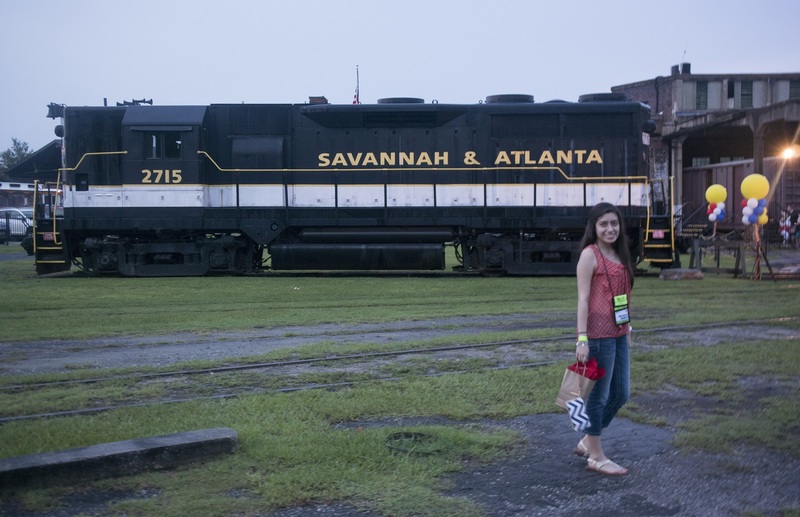 With full stomachs, we left for an afternoon of exploring historic Savannah! Next, we headed to the hotel to freshen up to head out to the local souvenir shops along the river. Luckily our hotel concierge gave us a map and directions to assist in making our shopping experience easy and enjoyable. He also took the time to warn us about the 200 year old steps that many find intimidating–even he is afraid. We decided to use the historic steps anyway and quickly learned why we were warned. The steps were extremely small and steep! Once we climbed down the steps we began our shopping adventures. It was unfortunate that our shopping ended quickly when a sudden storm rolled into Savannah. We rapidly headed to the closest destination to shelter us from the storm. Luckily we were able to catch a shuttle back to our hotel. After some time to rest from the long day of tours and shopping, we made our way to the Southern Legislative Convention’s Family Night. 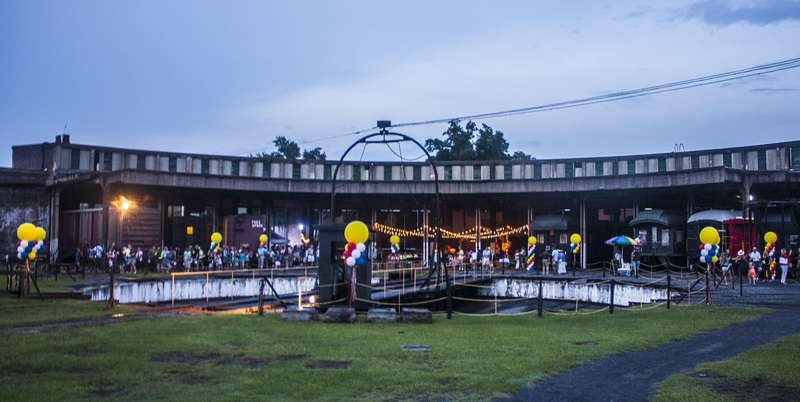 The venue was Georgia State Railroad Museum. The railroad station was established in 1833 as only a central system and within seven years the railroad expanded 190 miles. 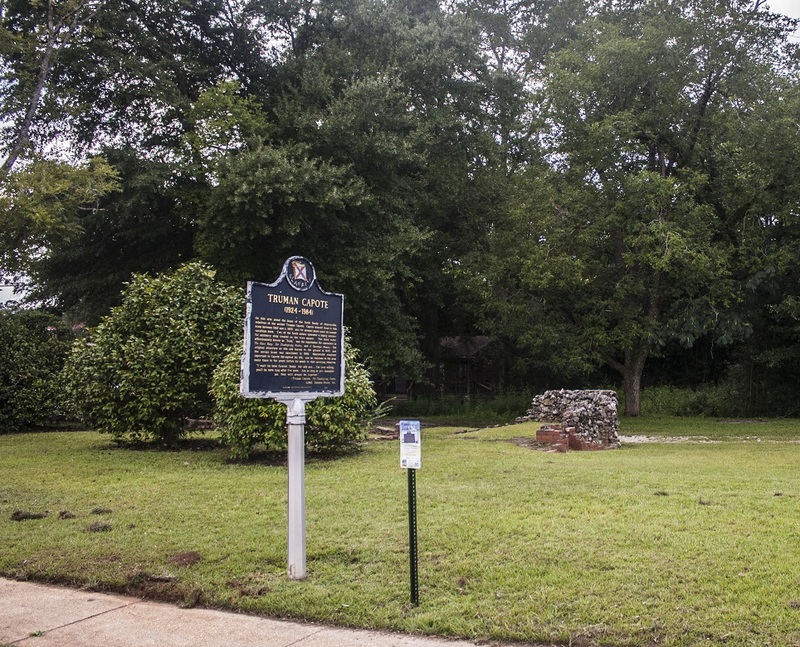 It is also known as one of the first businesses to have integrated workers in the deep South. The need for skilled workers was more important than prejudice. 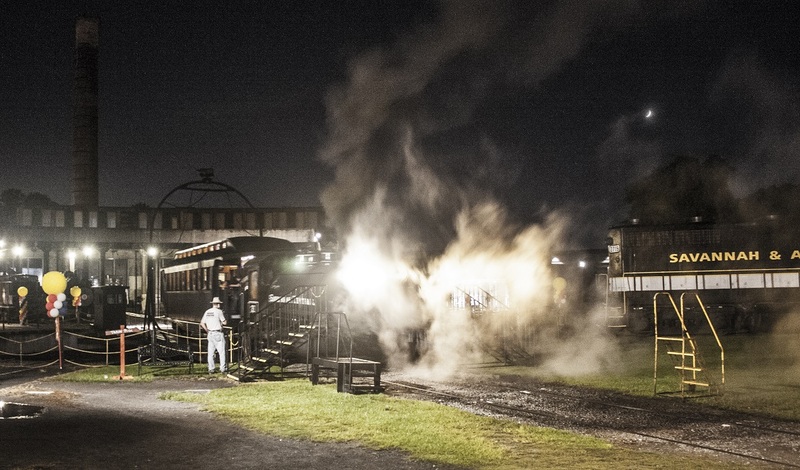 The train house was lit up with lights and southern style décor. There were numerous activity stations for us to enjoy as the sun set. 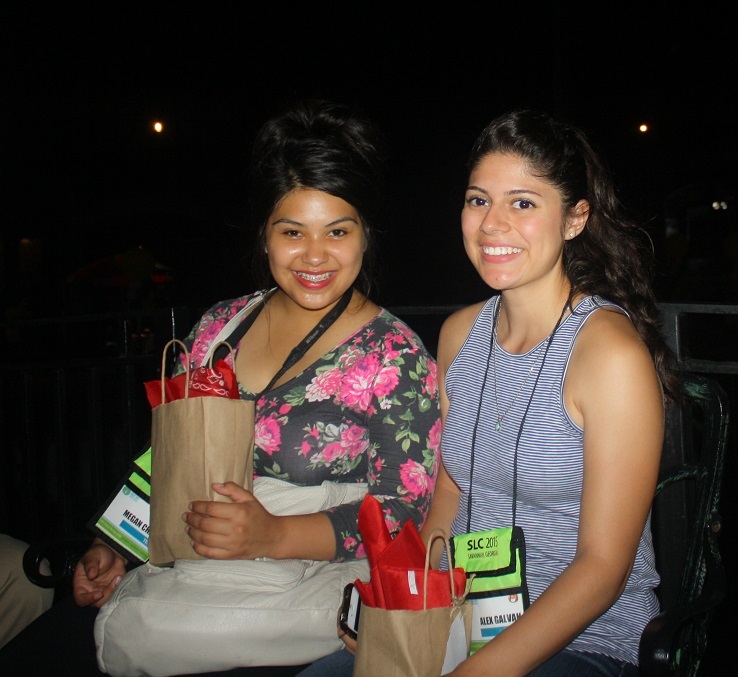 Music filled the background and families were participating in the night’s festivities. We started with a bar-b-que dinner and banana pudding for dessert. After, we indulged in more dessert from local King of Pops, they were refreshing and delicious! The train ride of the museum was our last activity. On the ride we learned fascinating facts about the history of the railroad. 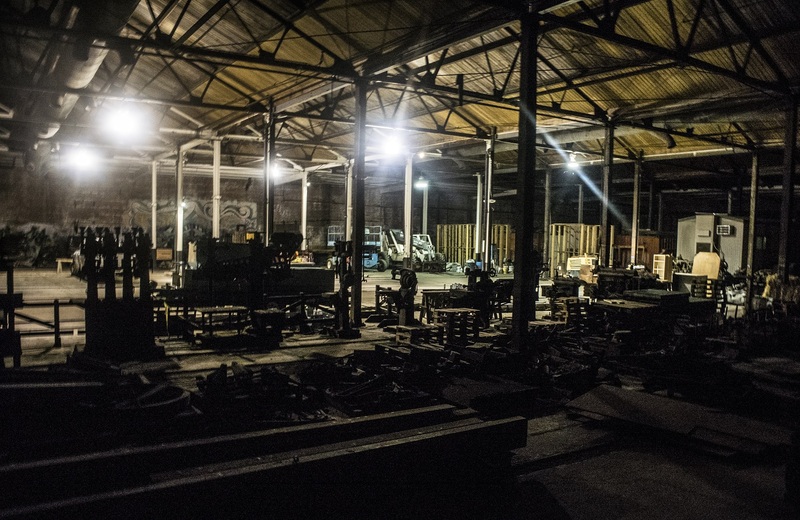 It also houses an original turntable and oldest steam engine. 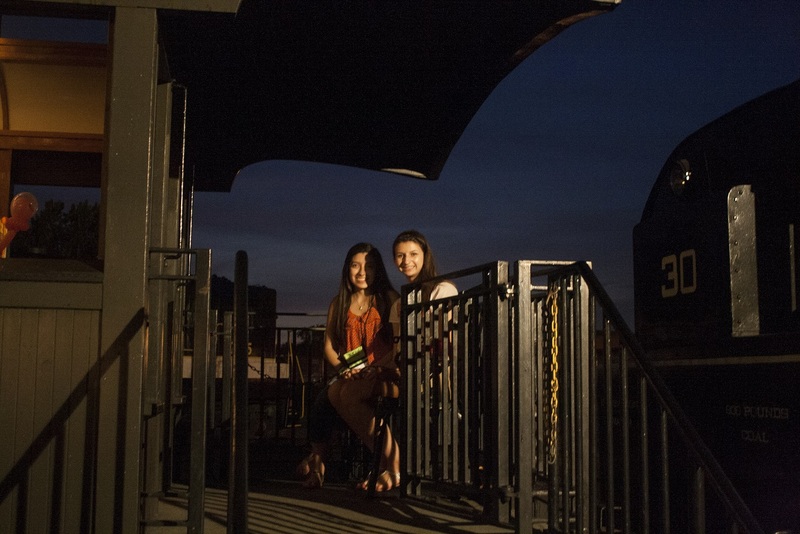 The night was perfect and, as always, we learned a lot. As we began our third day on a tour of the Deep South, we were thankful we had the opportunity to get a full-night’s rest. 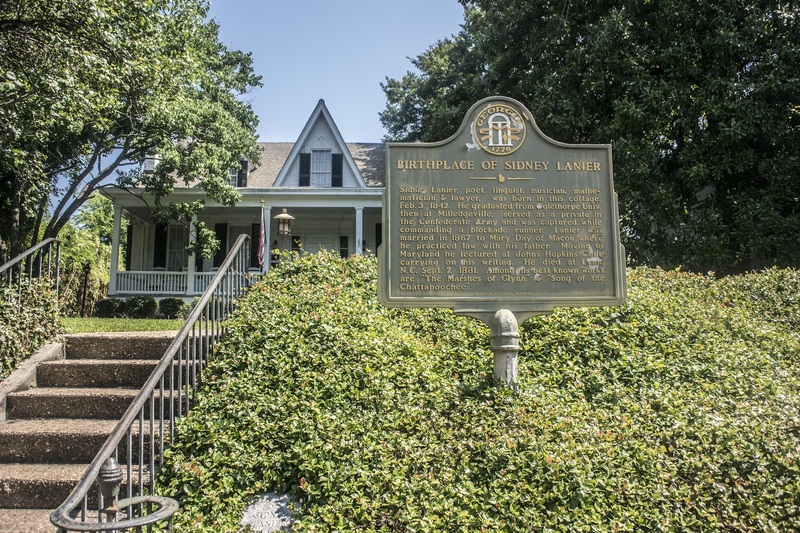 Our day began with packing up, and heading out to Macon, GA, where we were scheduled to tour the historic cottage where Sidney Lanier was born in 1842. Our tour guide, Bernard, kindly led us throughout the historic home. An American musician, poet, linguist, lawyer, and mathematician, Lanier was a well-rounded man of the nineteenth century. In addition, Lanier enlisted to serve in the Confederate Military where he was as a signal scout until he was taken captive. During his captivity, he contracted tuberculosis, which ultimately led to his death years later in 1881. Lanier died at the young age of only thirty nine. However, he accomplished much more in his lifetime than most do. Lanier was extremely intelligent and graduated college when he was only eighteen years old. He spoke multiple languages and taught at John Hopkins University. When he was twenty five, he married Mary Day and later had three sons. We enjoyed learning about Lanier’s most famous works are the “Song of the Chattahooche” and “The Marshes of Glynn”. 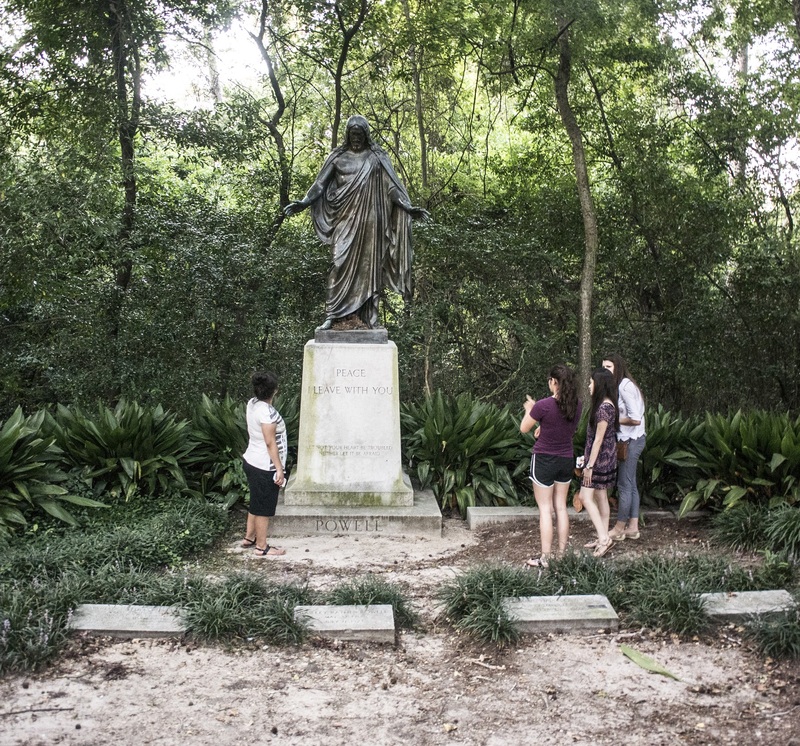 Of particular interest was his work, “A Ballad of the Trees and My Master,” which is inscribed on the Christus Statue in the Oakwood Cemetery in Huntsville, Texas. Just before departing on our Southern Tour, we visited Oakwood to see the statue of Christ and to read the poem. 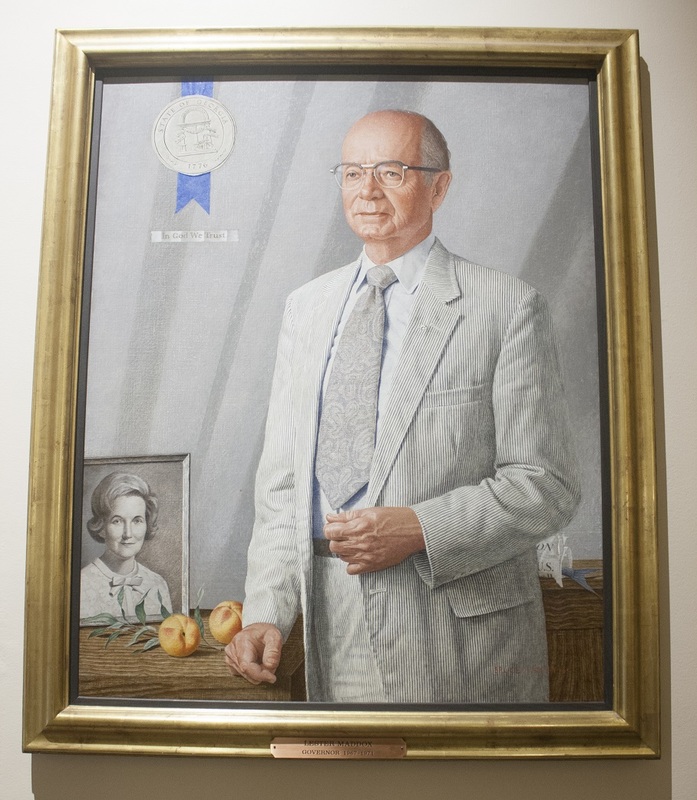 The home displayed many portraits of Lanier and his family, as well as various artifacts from his life. Among the favorites was Mary Day’s wedding dress. Very different than the average wedding dress today, the dress helped us to visualize life in the nineteenth century. 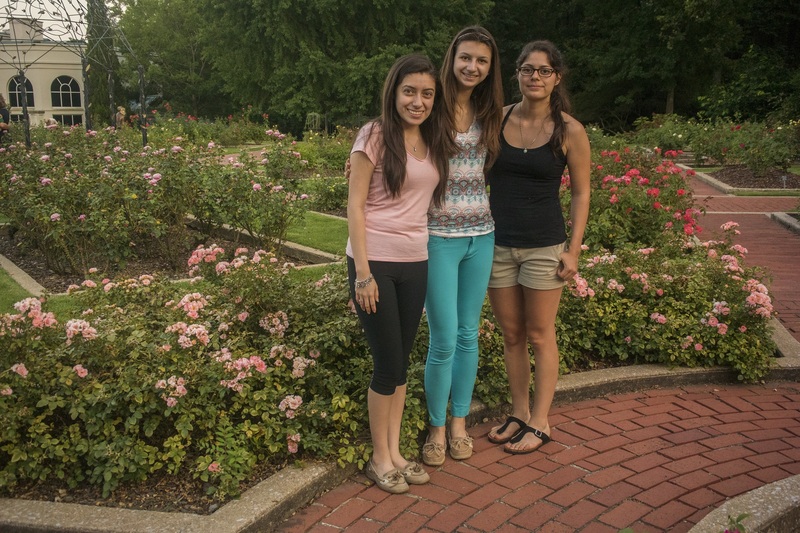 Concluding the tour, we took the opportunity to take pictures in front of the beautiful home. Following the tour, Professor Yawn gave us the opportunity to choose today’s lunch destination. We were nervous about our googled choice, Tropical Flava, but we were excited to try Caribbean and Jamaican food. The tables were beautifully decorated with lavender flower arrangements and the waitress gave us a warm welcome. The selections varied and though I wanted to try everything, I settled with their famous Jerk Chicken. The plate included Jerk Chicken, with red beans and rice, stir-fried vegetables, and plantains. Delicious would be an underestimate to describe the food. The chicken was tender and had a great flavor. Others tried chicken patties, bar-b-que wings, oxtails, and much more! Each plate was unique and tasted great. Along with the authentic food we also sampled their natural cucumber, watermelon, and pineapple juices. In the end, we were relieved to learn that our spontaneity did not disappoint us. After lunch we headed over to the Hay house for a tour of its elegant interior and to admire its massive and beautiful exterior. The Hay House, unlike the Sidney Lanier cottage, did not have any air conditioning, which made us reflect upon how it must have been to actually live in the extravagant home when people resided in it. 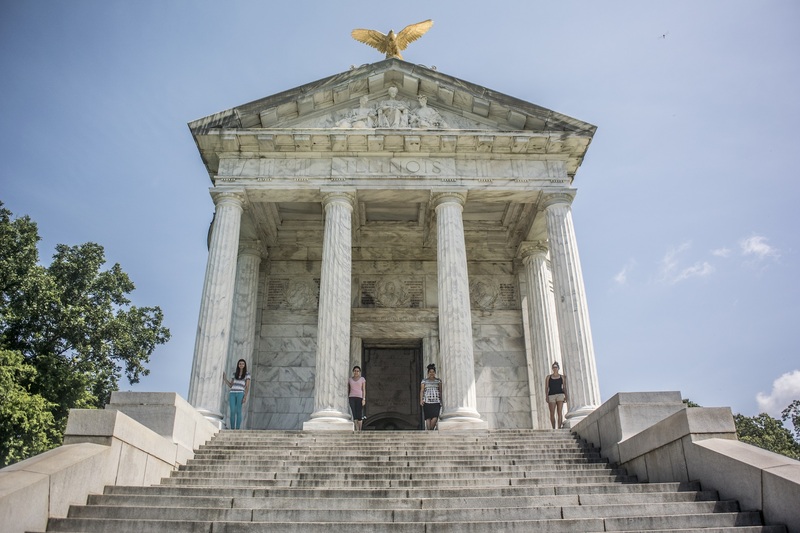 We had a fantastic tour guide who knew an immense amount about the Italian Renaissance Revival style of the home and all of the renovations made by the families that lived in the home. Our tour guide also revealed all of the tromp l’oeil illusions within the home, some of which included a faux pocket door and a disappearing staircase. 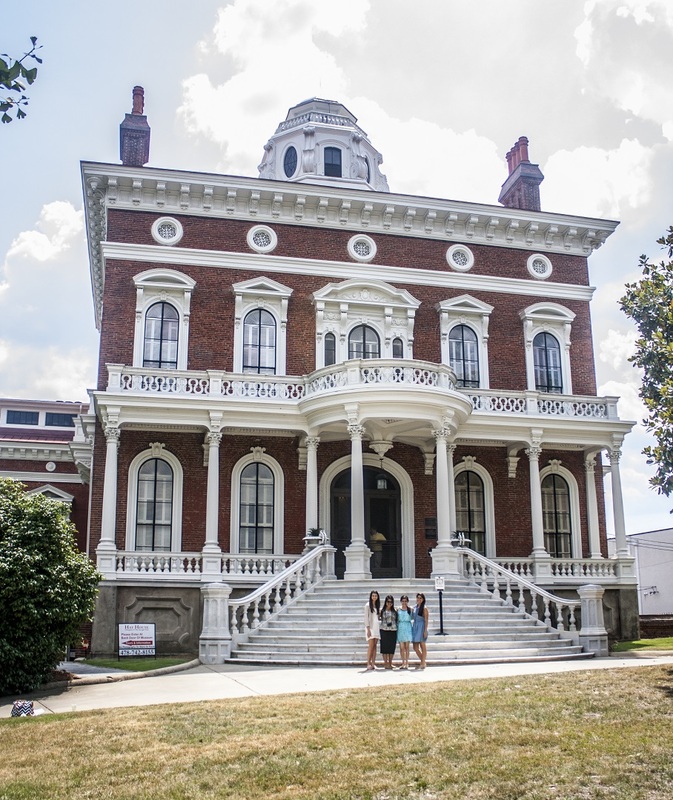 The group was amazed by the intricate detail on every ceiling of the home along with the hidden passage that is rumored to have housed Confederate gold during the Civil War. As we moved from the first floor up to the third we began to feel the heat because the air system that the original owners of the home built into the home to keep certain rooms cooler during the hot Georgia summers. Various characteristics of the home conveyed details about everyday life in the nineteenth century–such as the importance of food in a world where even basic sustenance was difficult to come by. As if to underscore that point, the pantry was guarded by burglar bars–the only room in the house protected in such manner. Another interesting aspect of the home was the speaker system within the home that was used to communicate with the servants, which made the home very technologically advanced for its time. There were many interesting things about the home, but the most exciting part of the tour was our visit to the cupola past the fourth floor. 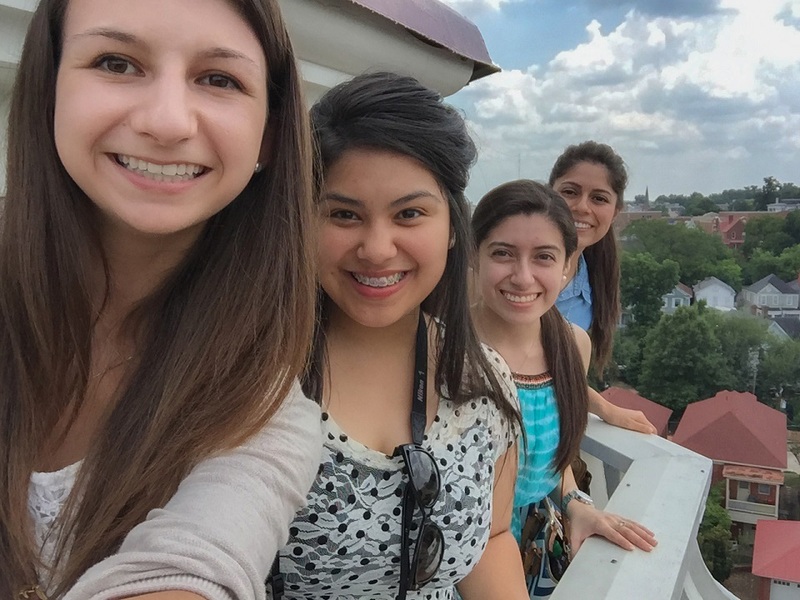 A cupola is a small dome which adorns a building, and this one offered a particularly nice view! Leading up to the cupola, the thin spiral stair case took us to the top where we could exit through a small door and walk onto the widow’s walk and gaze upon Macon from the highest point of the Hay house. 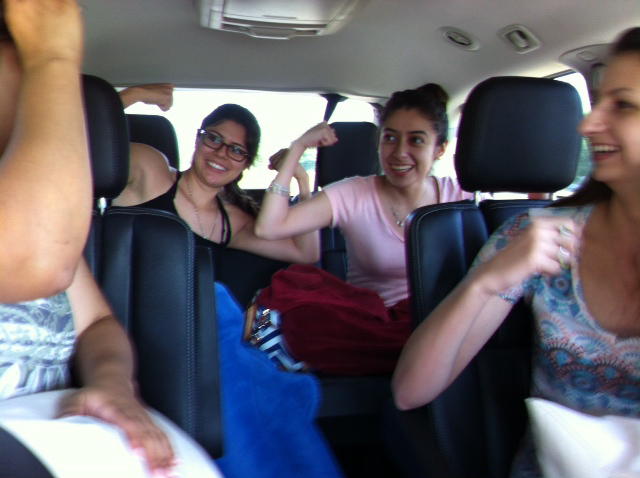 The group thoroughly enjoyed the tour, but was eager to load back into the car where we began our drive to Savannah! 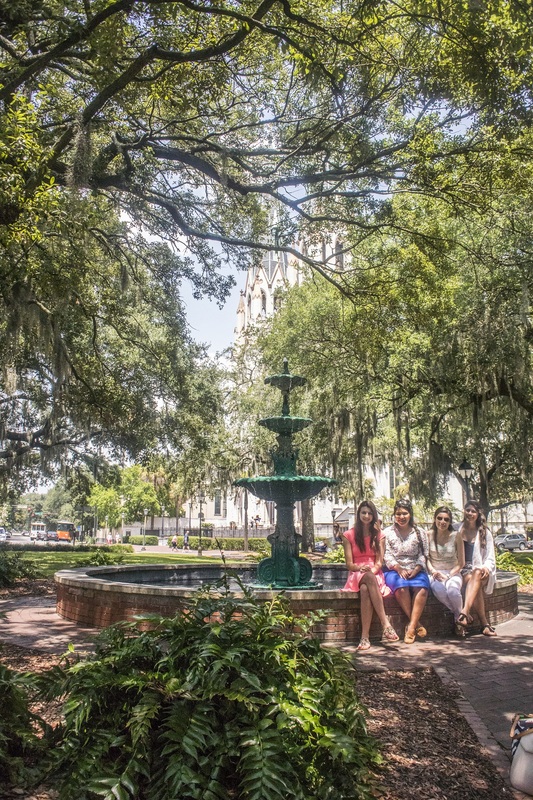 Excited about finally arriving in Savannah, we admired the beauty of the historic district. 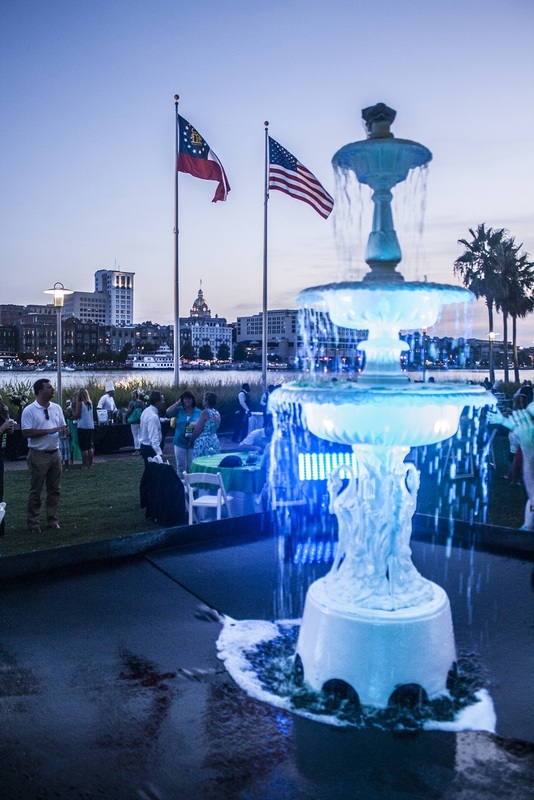 After freshening up at the hotel, we headed to the Southern Legislative Conference’s Welcome Reception themed “A Taste of Savannah”. Enjoying numerous h’orderves of Southern delicacies, we listened to the live music and gazed at the Savannah skyline along the river. 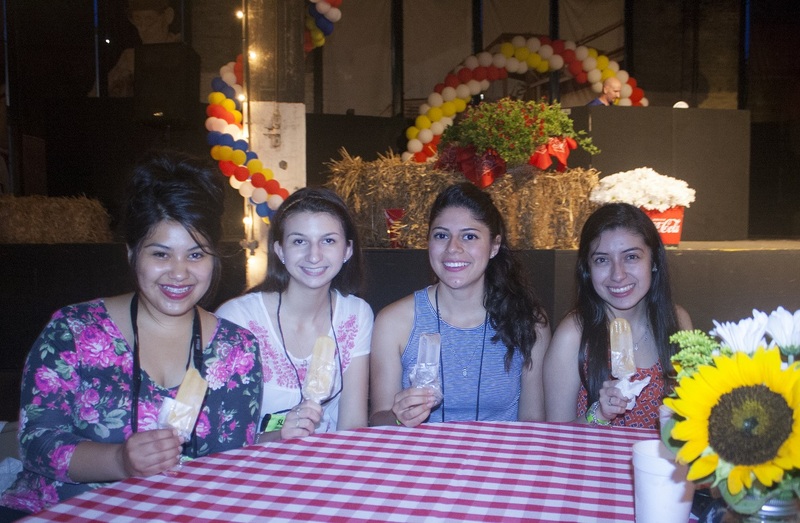 Locally owned restaurants catered the reception, so we were able to taste Leopoldo’s ice cream and the world famous pralines from Savannah’s Candy Kitchen for dessert. It was great to watch the pralines made right in front of us and taste them freshly made. They were a group favorite! 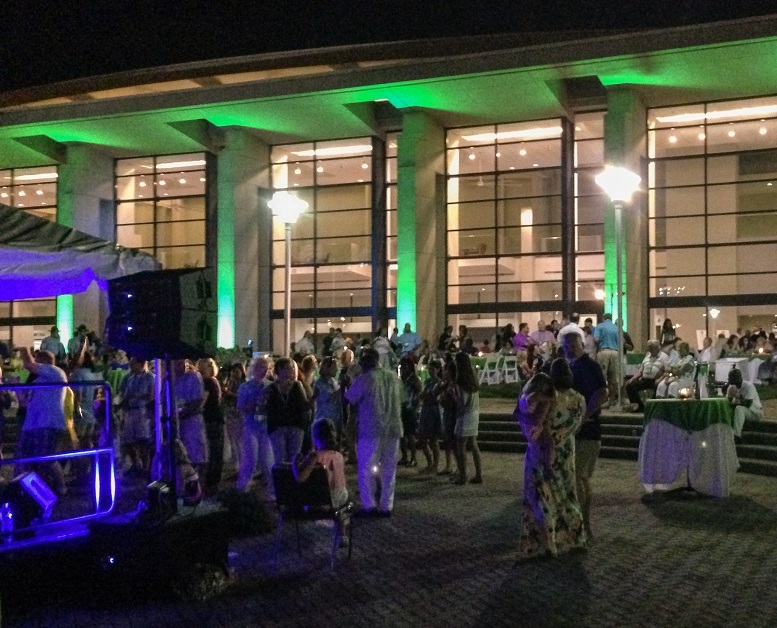 Overall, the welcoming reception was nicely done, with good music, lots of refreshments, and great scenery. 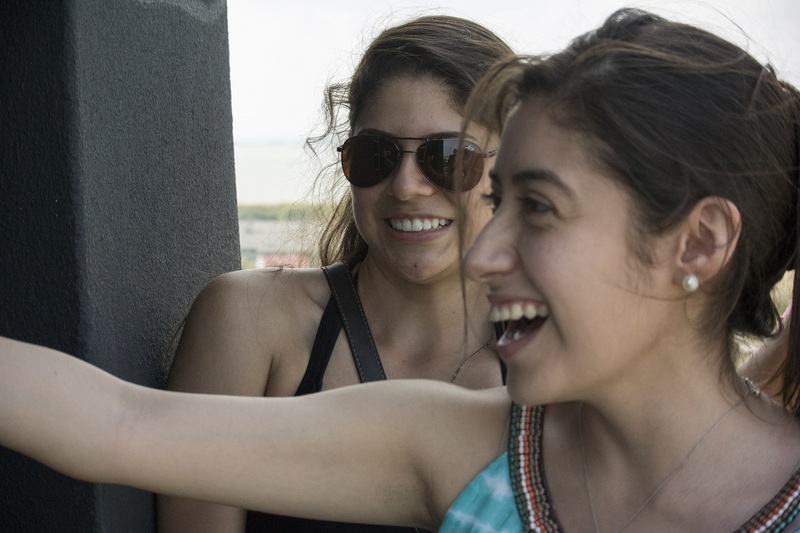 After enjoying the local food we walked over to the river to take many pictures, including many selfies. After many great pictures, we were able to have some fun and join everyone on the dance floor where we joined some very outgoing dancers. The last song literally ended in explosions with the fireworks that lit up the sky behind us. It was a colorful way to end the night as we departed back to our hotel to get some sleep. 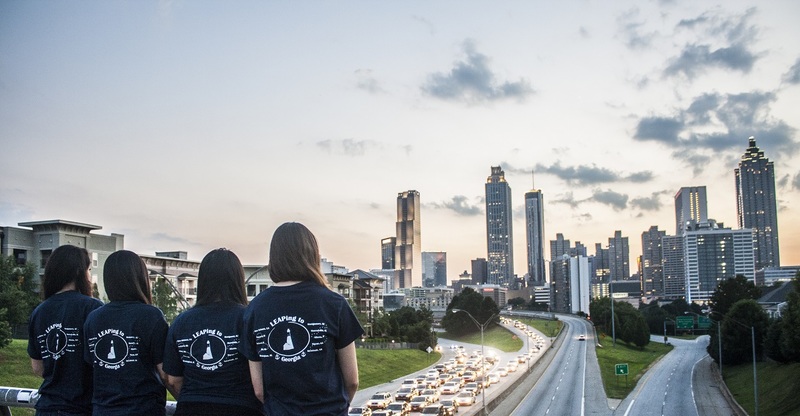 Although none of us got more than four hours of sleep, we were excited to explore Atlanta, Georgia. 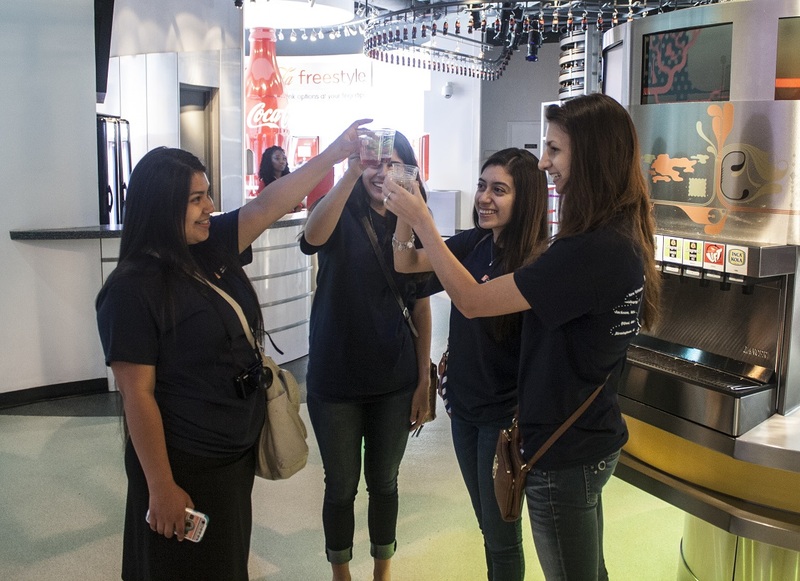 The morning started off pretty sweet with a visit the World of Coca-Cola. The staff were welcoming and made us all excited to explore the grounds. The self-guided tour was interesting because they made every room in the two-story building represent all parts of the world. Coca-Cola was invented by John Pemberton in 1886. 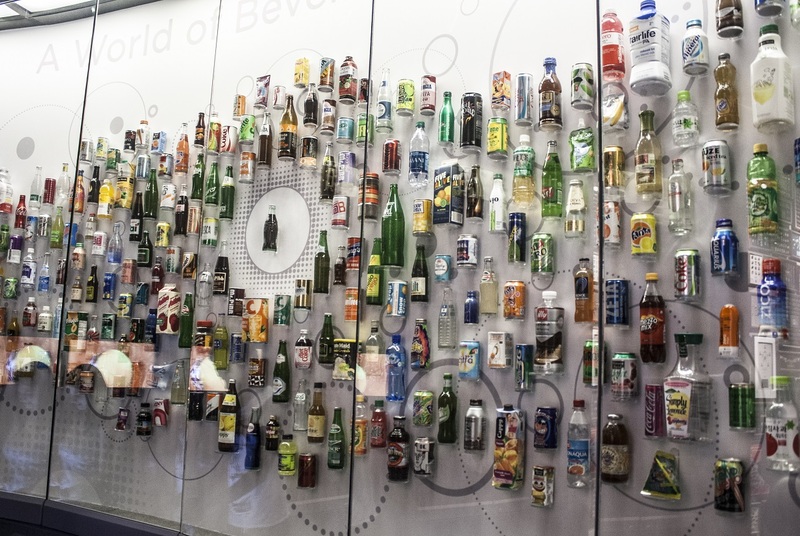 It has evolved from a local refreshment to a worldwide assortment of beverages that are unique to its environment. To conclude our visit we entered the taste testing room where we sampled Coca-Cola products from all seven continents. It was great to taste what others around the world drink every day. For lunch we stopped at a New York City style deli called Reuben’s Deli. As soon as we entered the Deli we realized that it was filled with lively chaos which made ordering a bit of a task. When it was our turn to order we were being hollered at and expected to yell back while ordering, if not they couldn’t hear you past all of the other noise and you would not receive your meal. When it was my turn to order I asked for a Godfather sandwich on honey wheat toast. I yelled out what I wanted in my sandwich which included tomato and spinach as additives, but I wasn’t loud enough so I didn’t receive the tomatoes. Even without the tomatoes, my Godfather sandwich was by far the best sandwich I have had from a deli. The bread was soft and sweet and not dry like wheat bread usually is. Others at the table ordered hotdogs and Philly cheese steaks, and Kaitlyn purchased one of their oversized chocolate chip cookies which she kindly shared with us. 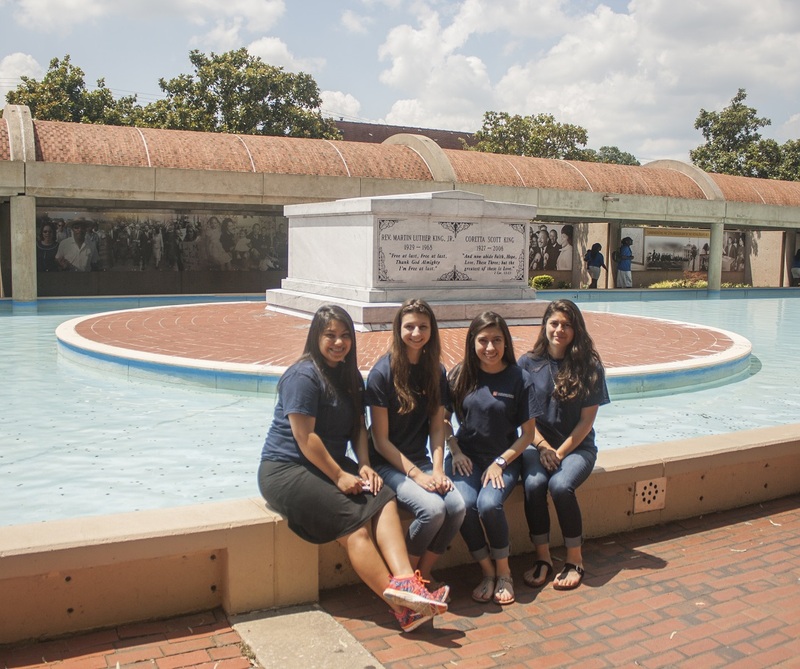 Next, we stopped for a quick photo at Martin Luther King’s gravesite. 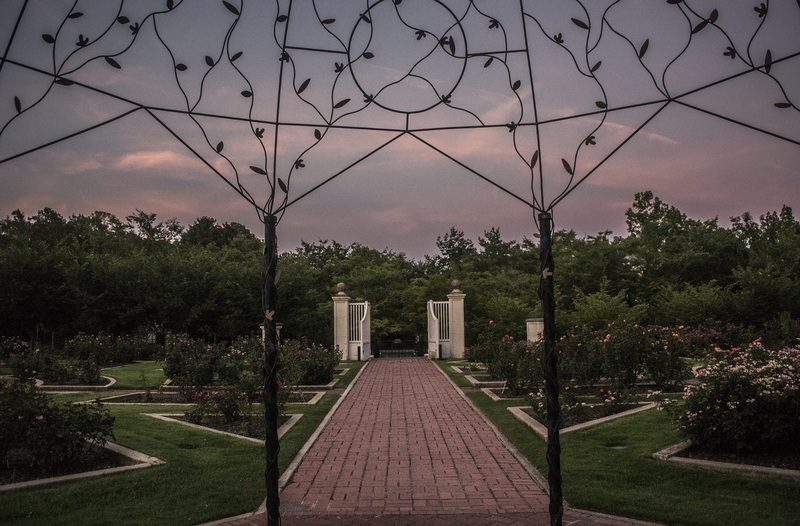 It was a beautiful gravesite where he was buried alongside his wife, Coretta Scott King. Their gravesite was surrounded by a pool which made it a perfect scene. After our quick photo we moved to our next destination, the state Capitol. At the very beginning of our self-guided tour, we ran into a nice gentleman who turned out to be Georgia Representative Tom Taylor. In fact, he was so nice, he offered to give us a tour. Yes, that is the newspaper wrapped around a dead fish! 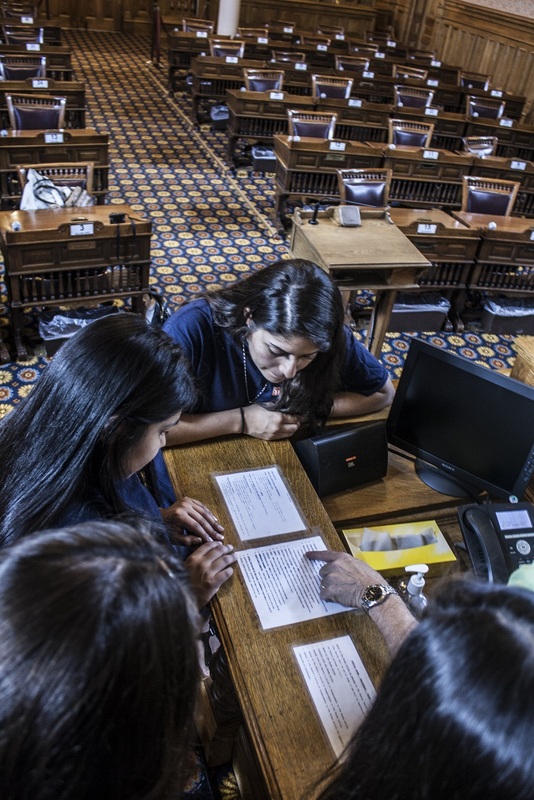 We moved on to the House Chamber where Representative Taylor told us history of the chairs and desks and then gave us an overview of how things work in the state House of Representatives. The house still uses the original desks from the 1860s. Although the desks are original, they have been updated. 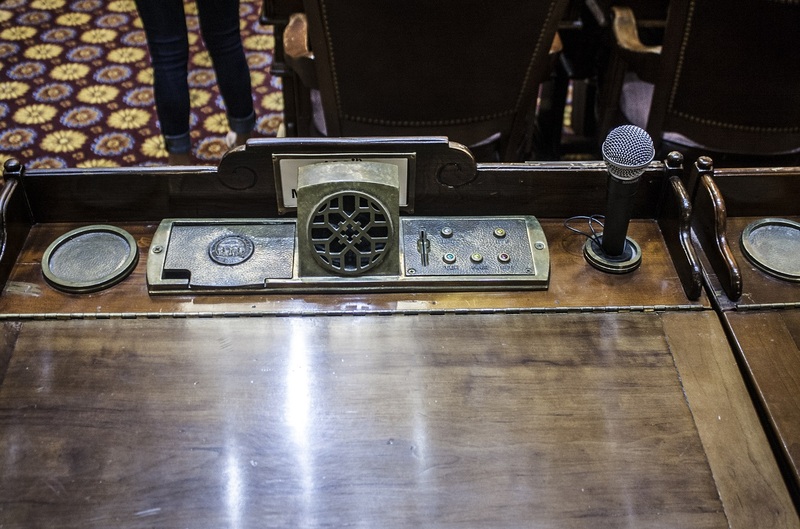 The desk was originally equipped with an ashtray, which has now been converted to an electronics outlet; a microphone has replaced the old ink-holder for their quill pens; and while the drink coaster is still there, it’s now used for coffee or water rather than Bourbon. We were also given a chance to occupy the spots used by the Representatives, and we had fun posing in positions we may actually occupy officially in the future. Amazingly, Representative Taylor offered to take us to the Governor’s Office, where we took a group picture, were given some “official Georgia peanuts,” and took photos of the office. As we were about to leave, the Parliamentarian and Secretary of the Senate, David Cook, greeted us and offered to show us around the chamber! By this time, we were feeling pretty important, but we think the reality is that the folks in the Georgia Capitol are just very welcoming. 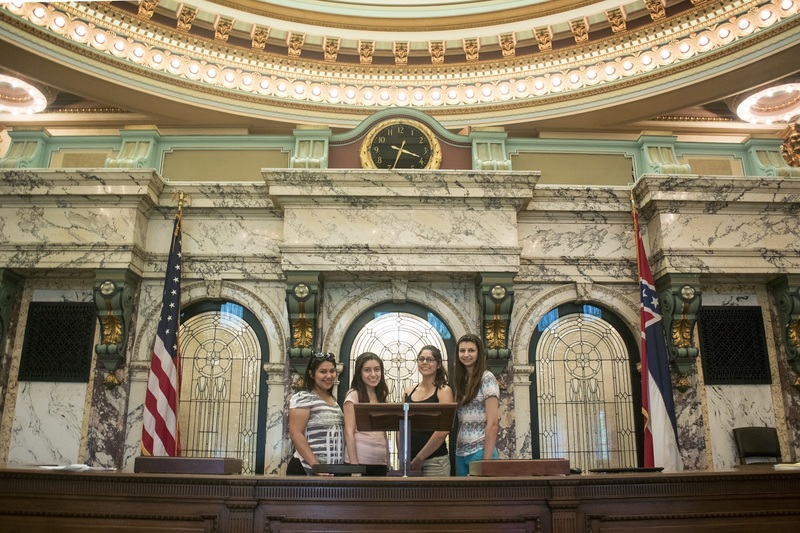 He gave us a great tour of the senate where we learned a lot and got to take plenty of pictures. Secretary Cook also showed us a “cheat sheet” for parliamentary procedures that he keeps on the podium, and he explained some of them to us. Also, each one of us got to slam the gavel, as though we were were presiding over the Senate. It was great to be welcomed with such hospitality. 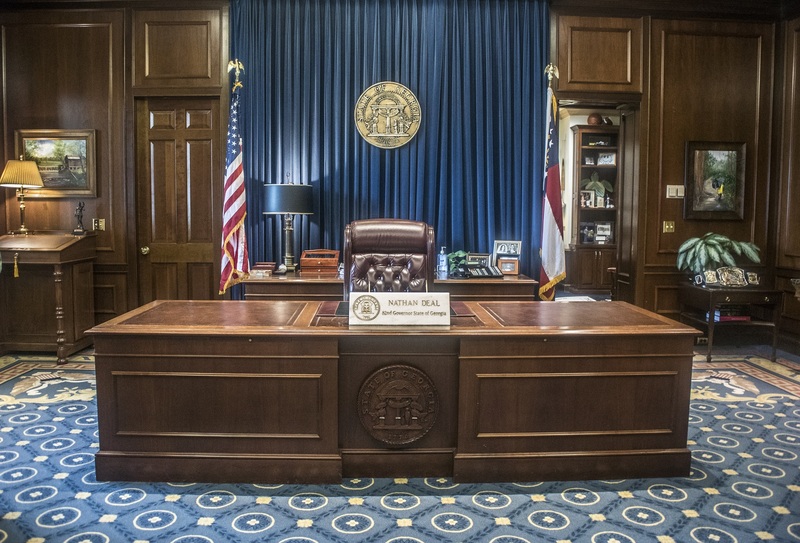 We definitely learned more than we expected about Georgia’s legislative branch. Following our exciting VIP capitol tour, we hurried over to the Carter Presidential Library. 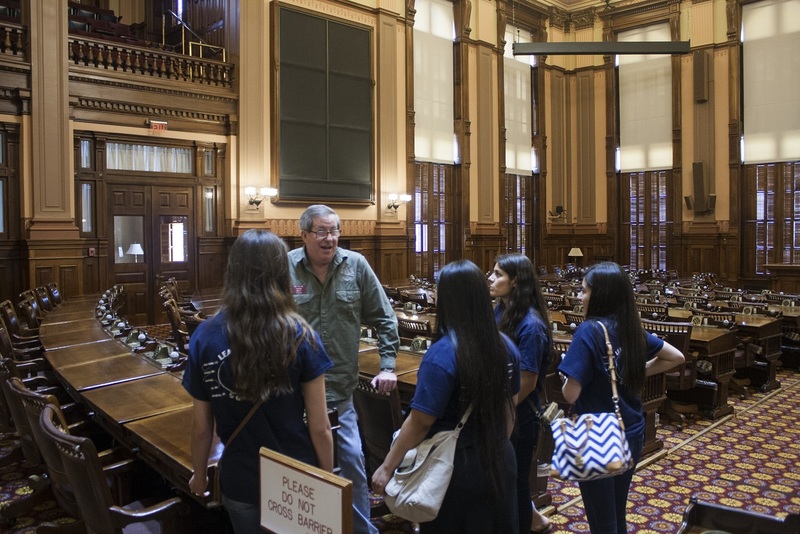 During the capitol tour, we learned that Jimmy Carter was previously a governor of Georgia. This was the perfect transition for the Presidential Library. Jimmy Carter was elected to office in 1977. 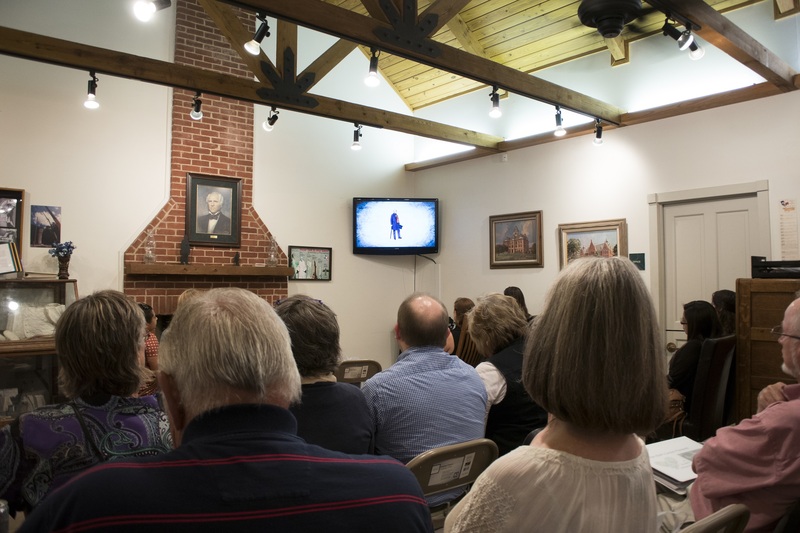 The library began with a video which gave visitors background information on President Carter and his life. 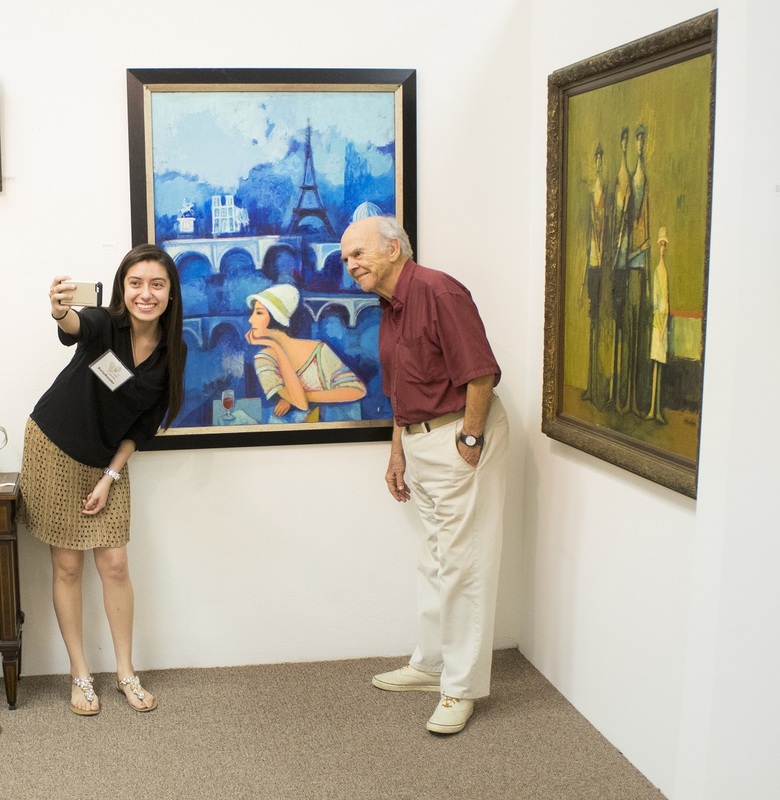 Arranged as a timeline, the museum began with the birth of President Carter, proceeded through his early life and political career, and ended with his numerous awards. The library contained extensive amounts of history, but also more personable artifacts such as President Carter’s childhood report card, or the President and First Lady’s passport. 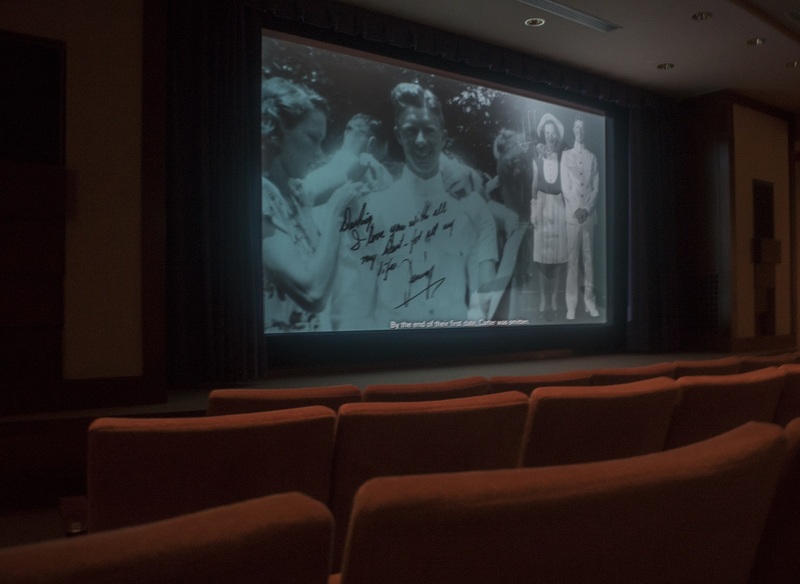 Dispersed throughout the museum, videos of President Carter and first lady Rosalynn played adding a more personable element throughout the library. 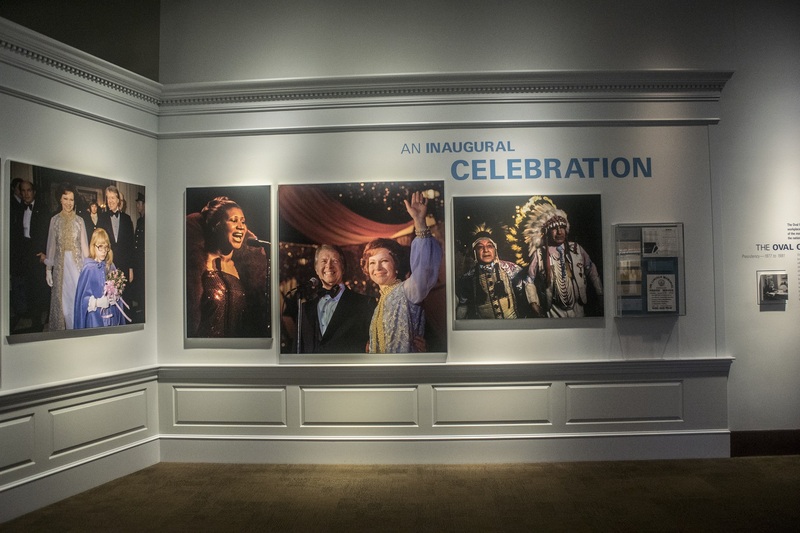 Emphasized throughout the museum, President Carter and Rosalynn’s commitment to serving people and helping to establish world-wide relations to promote world peace were clear. The library gave visitors a better understanding of President Carter’s accomplishments in the White House, but also who he is as a person. 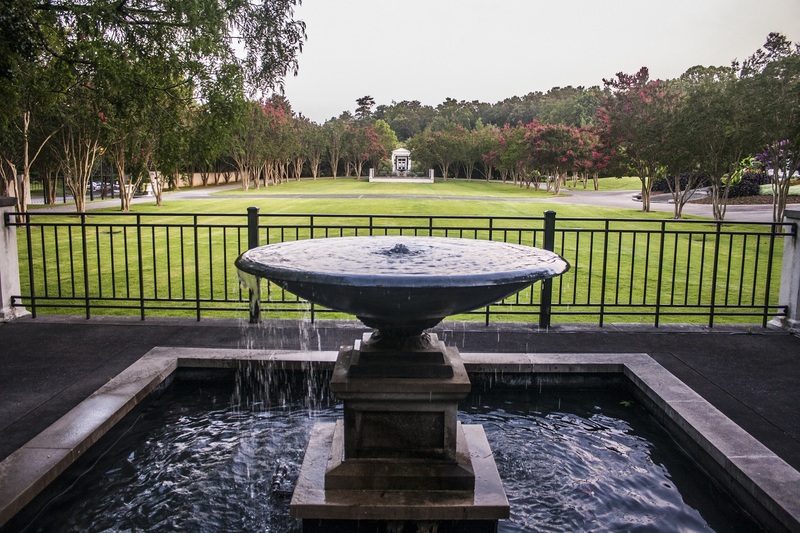 The Carter Presidential Library is situated on beautiful grounds, giving us the perfect opportunity to take stop for photos. 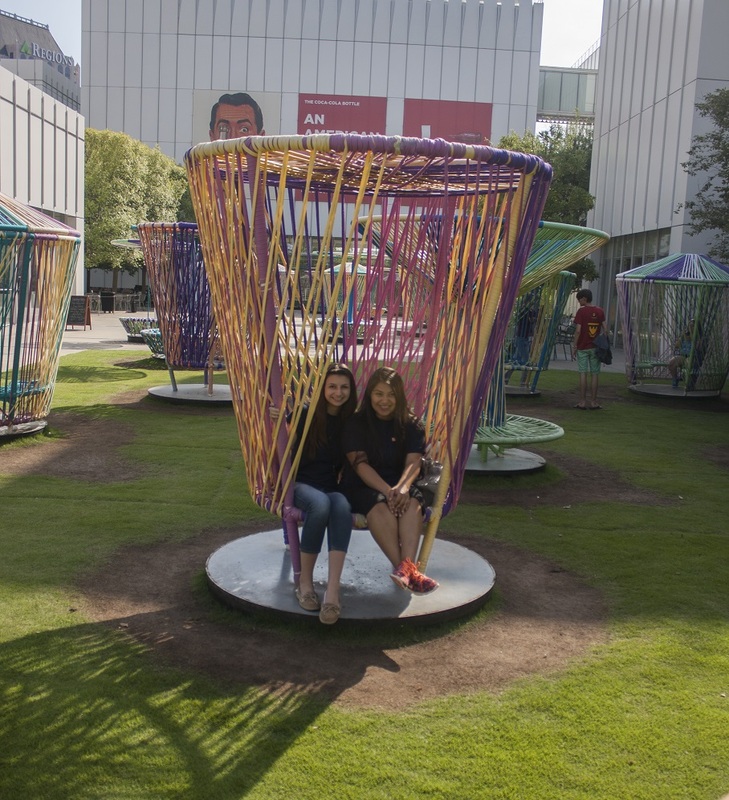 Atlanta’s High Museum of Art was the next stop. 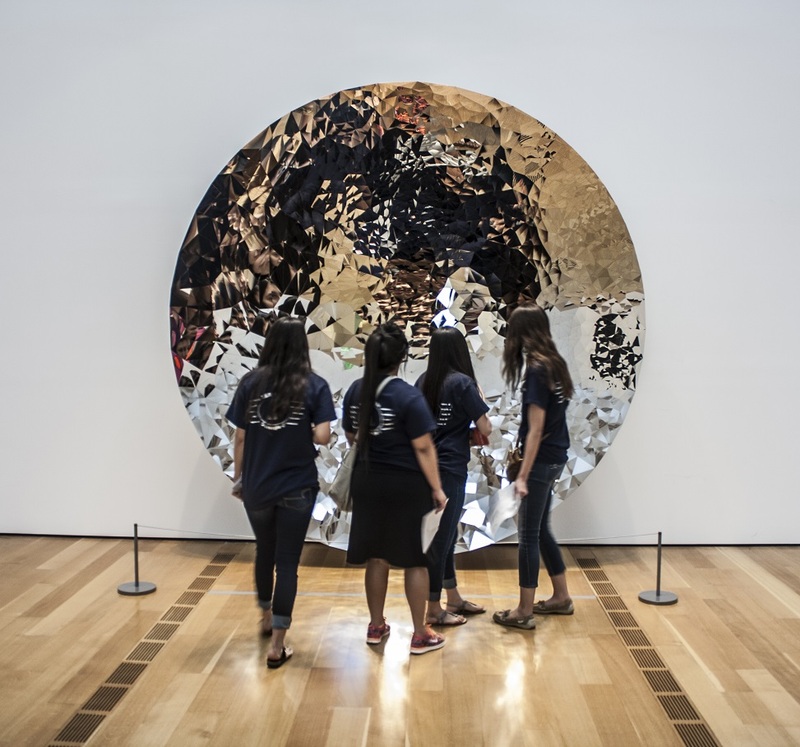 The High Museum of Art consists of more than 14,000 pieces of art ranging from American, European, and African…the list goes on. The building is four stories high with all forms of art (photography, sculptures, paintings, and furniture) displayed throughout. 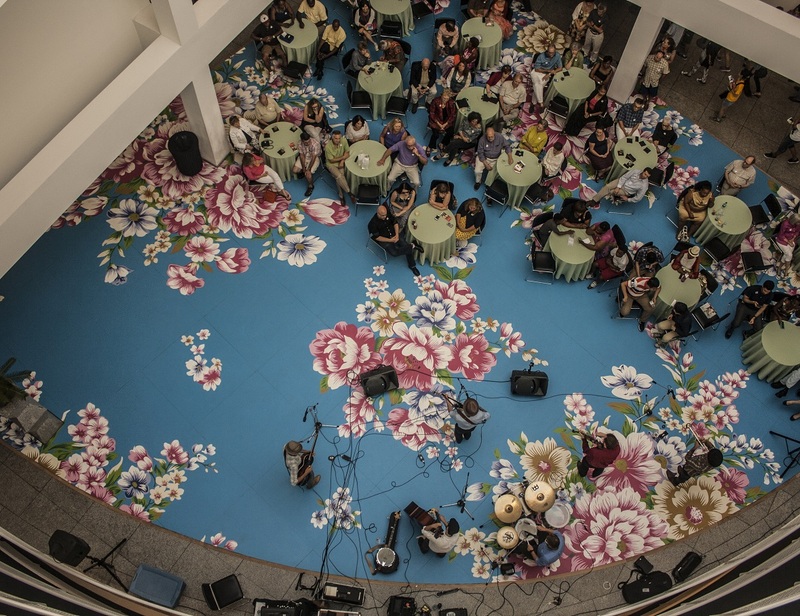 It was a special day because as we admired the art a live band played great tunes. The combination of the two were perfect and made the visit unforgettable. The museum offered a variety of styles to fit everyone’s palate. The group all had different favorites, however one in particular stood out to me. The Crochet Chair proved my favorite because of its uniqueness, but also its practicality. Created by Marcel Waders, this piece proved its originality with its simplistic concept. Another group favorite was more interactive, allowing visitors to listen to each other from a distance without creating extra noise. 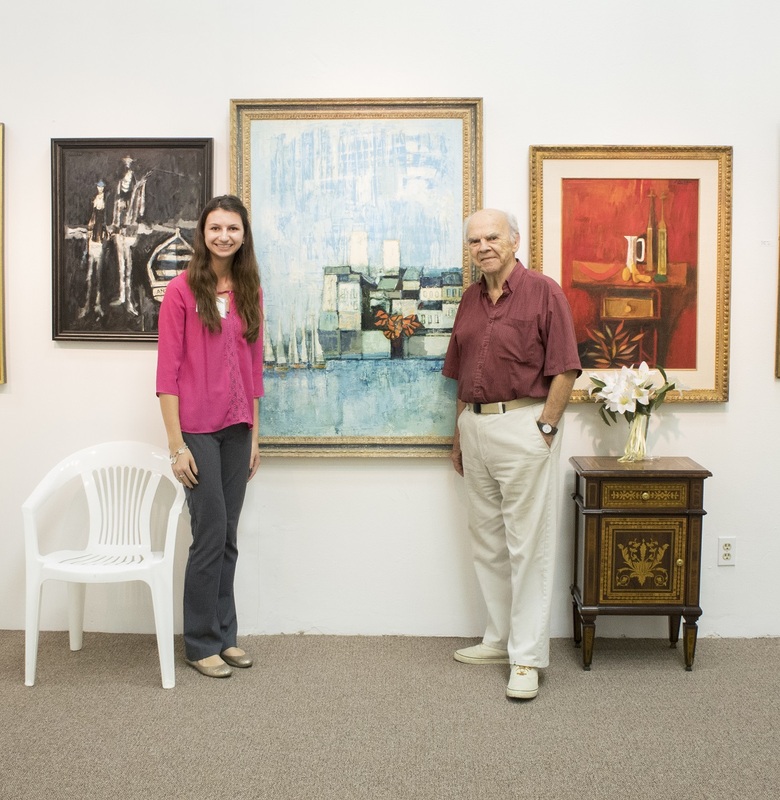 We also enjoyed paintings by Thomas Moran, Childe Hassam, Ernest Lawson,William Haseltine, Thornton Dial, and Mr. Imagination, the latter of which is a folk artist who actually appeared at the Wynne Home a few years ago. 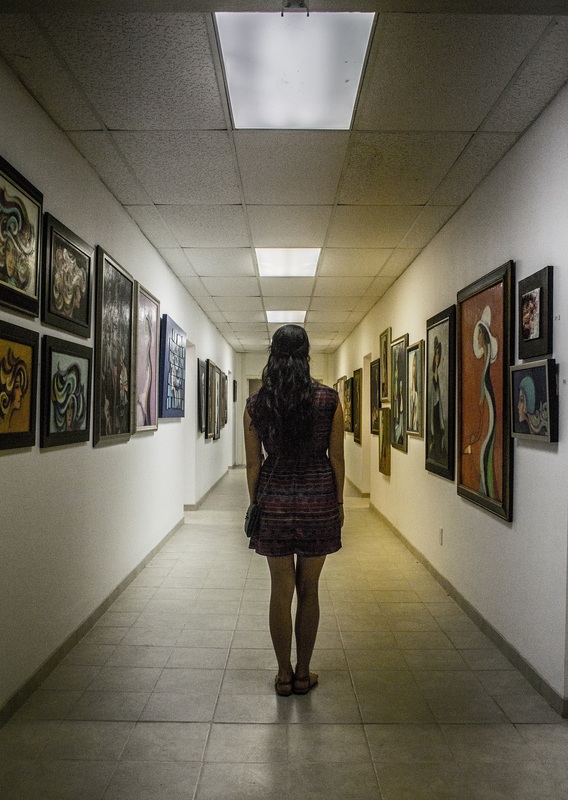 Words and pictures do not capture the beauty of the artwork, but after spending a few hours exploring the massive art museum, we departed the museum–but not the grounds. 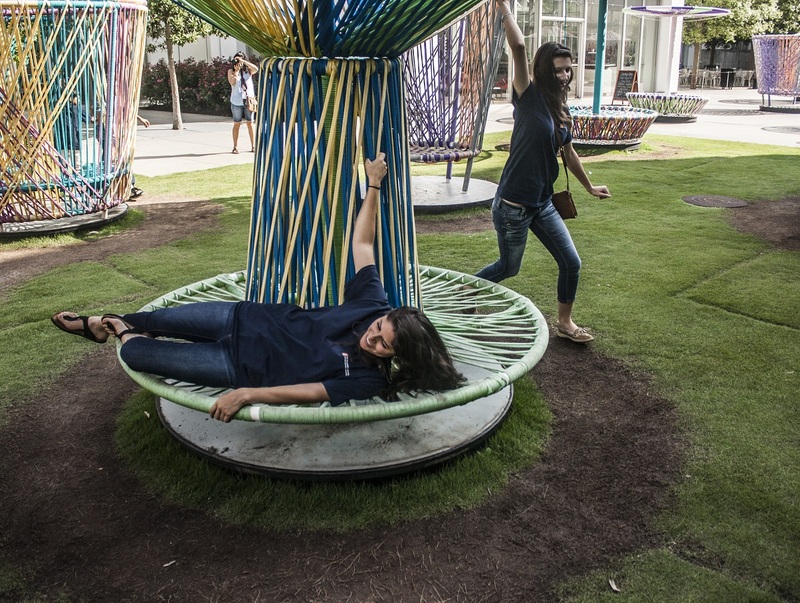 The grounds had been decorated with “yarnbombs,” decorative and useful objects that attract people to create my relaxing…. …and it certainly worked for us! Dinner was different from what we anticipated. We were supposed to be stopping at West Egg Cafe for dinner, but we found ourselves in the Odd Bird instead because the West Egg Cafe turns into the Odd Bird after 3pm. The menu for the Odd Bird was limited to Chicken Biscuit sandwiches, Chicken Sandwiches and Chicken and Waffles. Three of us ordered the BBQ Chicken Sandwich which came with coleslaw and pickles and the other three ordered the Chicken Biscuit. I am a barbecue fanatic so I was pretty excited for my BBQ Chicken Sandwich, but when it arrived I realized that the Barbecue sauce from the Odd Bird tasted more like buffalo sauce than barbecue. I believe that the Odd Bird lived up to its name with its odd sauce. After we were through eating our entrees, we indulged ourselves with blueberry custard pie which left a sweet taste for the road, but after a wonderful dinner at John’s City Dinner the night before, Oddbirds was a bit of a let-down. We had heard much about the view from the Jackson Street Bridge, so that’s where we headed. The view lived up to its name, giving us a beautiful view of the downtown skyline at sunset. 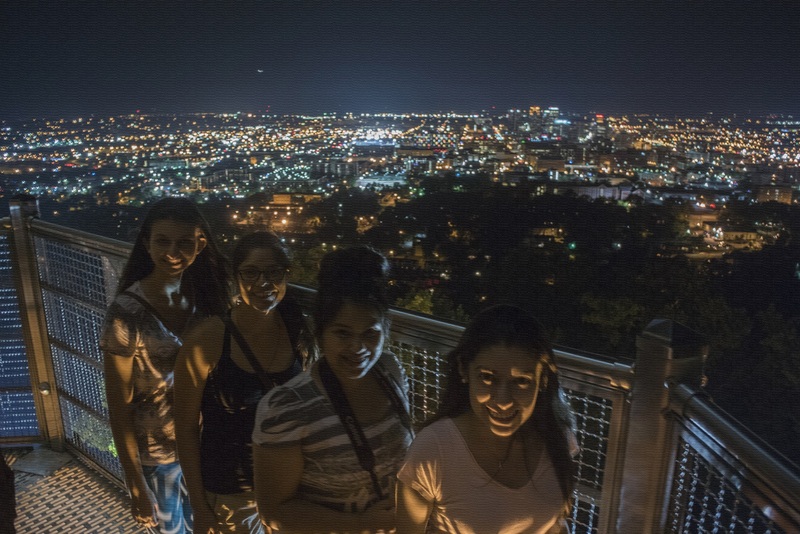 In fact, the view turned us in to shutterbugs, and we enjoyed it immensely. 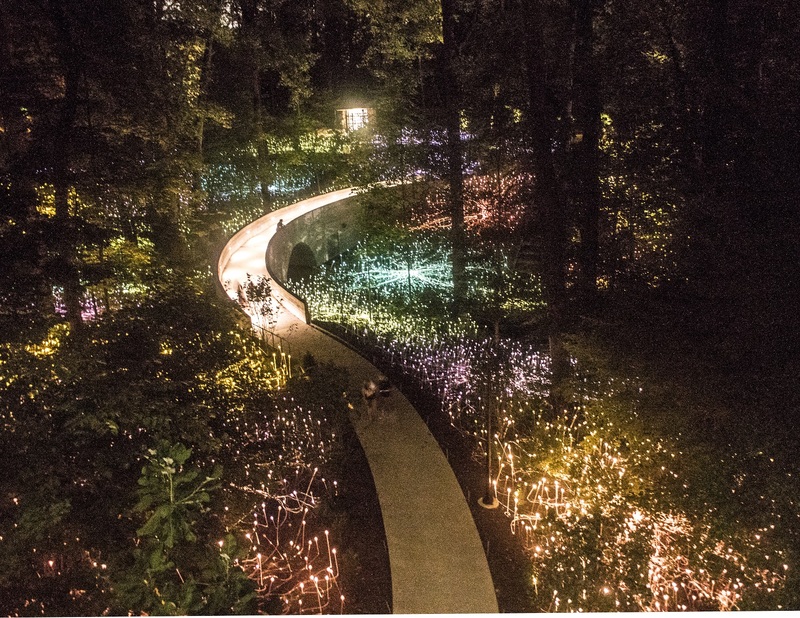 The sun had set by the time we arrived at the Botanical Garden of Atlanta so we were able to go into the garden while it was filled with lights. 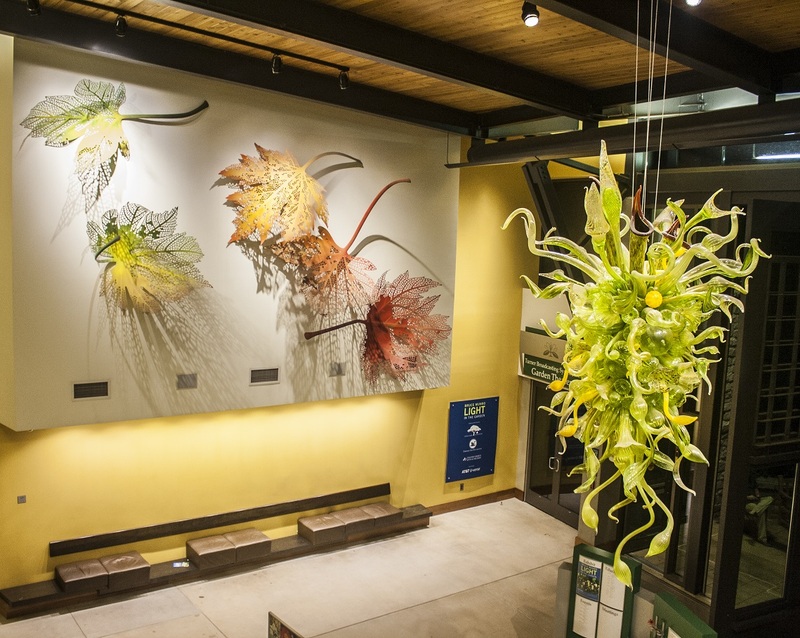 As soon as we walked in we were greeted by a gorgeous piece of glass art called the Nepenthes Chandelier by Dale Chilhuly that was hanging from the ceiling (with Maple Leaf Rag) by David Horner in the background). 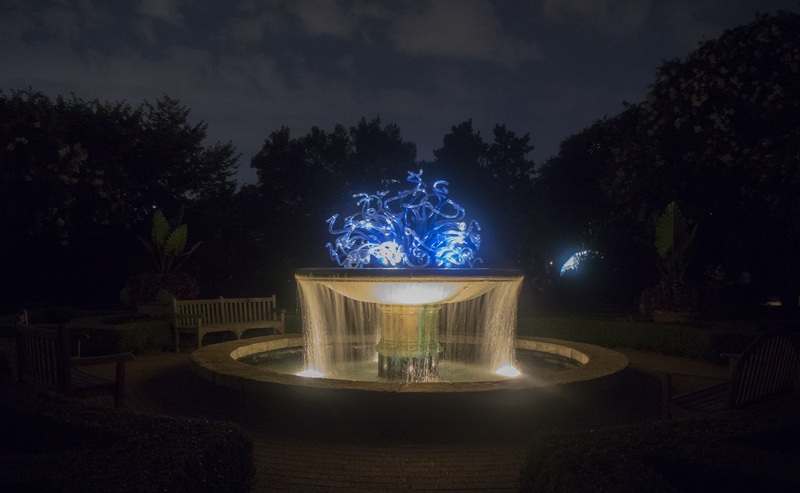 As we walked a bit further into the gardens we were able to see another piece of glass art by Dale Chilhuly called Parterre Fountain. 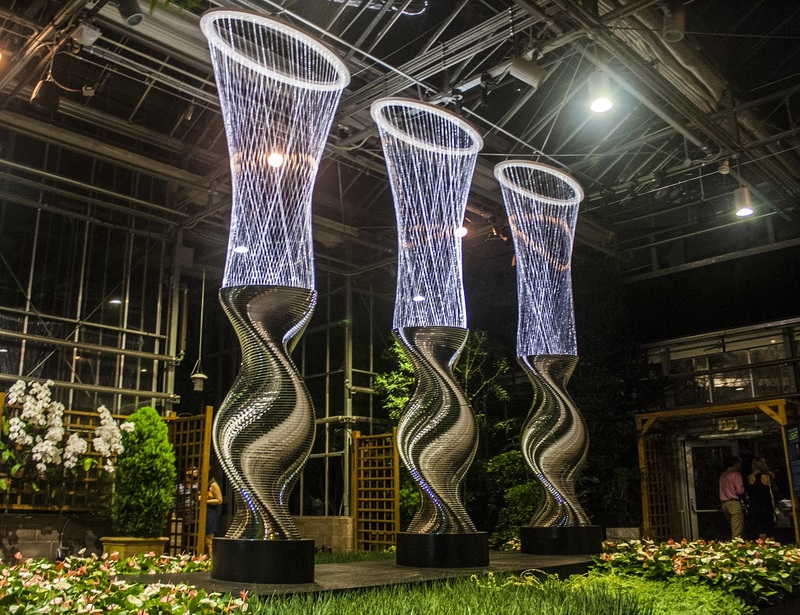 The main feature of the garden at night was a temporary and special exhibit by Bruce Munro, who specializes in art made from fiber-optic lights. Making our way through the gardens we passed numerous amounts of beautiful flowers like orchids in full bloom and Munro’s complementary art…. 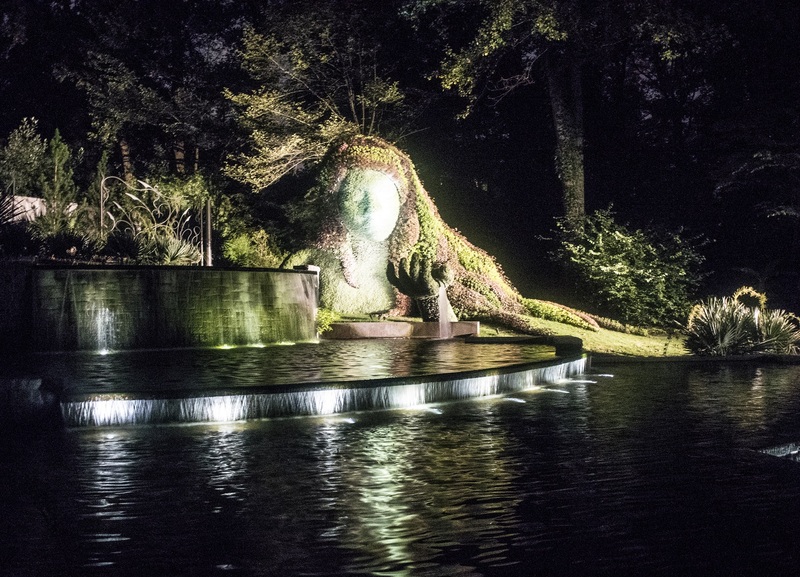 …and we then walked over a bridge which gave a beautiful view of colored lights below us and led us to a statue of a woman covered in over 1800 individual plants. 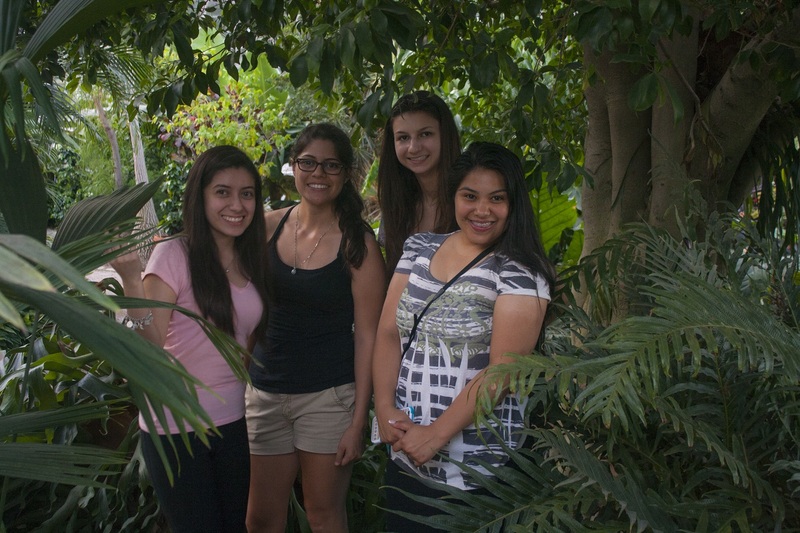 The Atlanta Botanical Garden was a peaceful way to end our adventure-filled day.